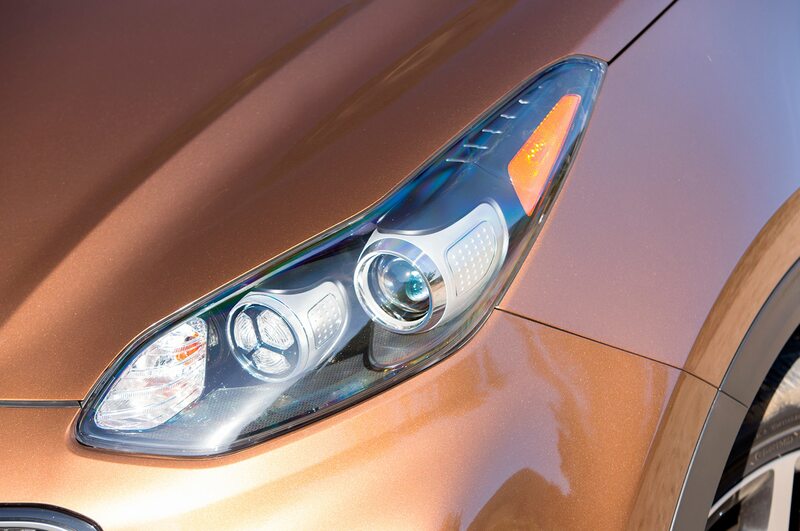 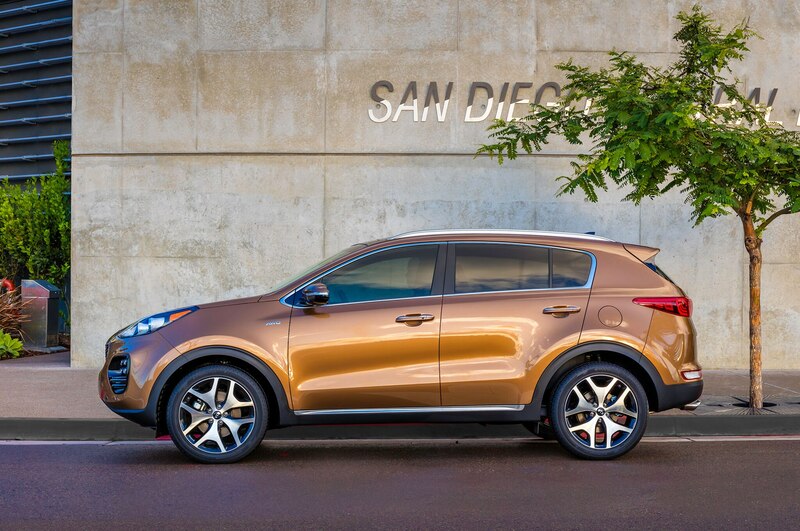 SAN DIEGO, California — No new-car segment is more competitive than that of the compact crossover. 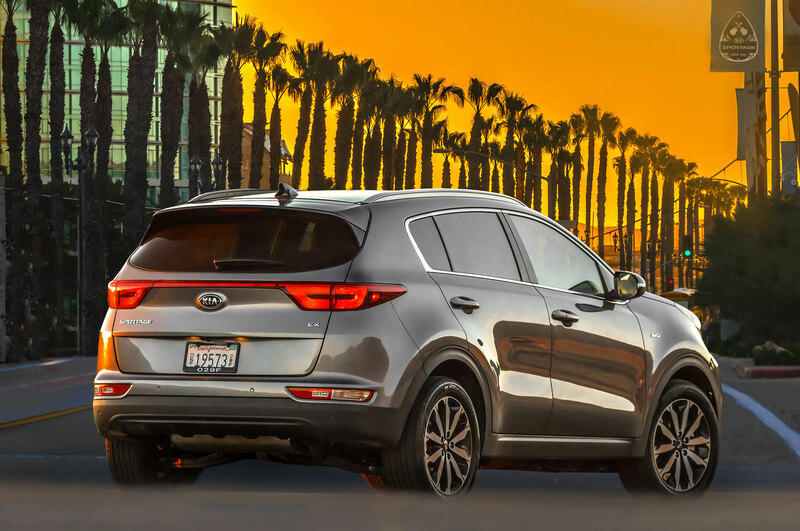 This is one of the most in-demand types of vehicles for everyone from young families to baby boomers, desired by drivers from the snowbelt to South Beach. 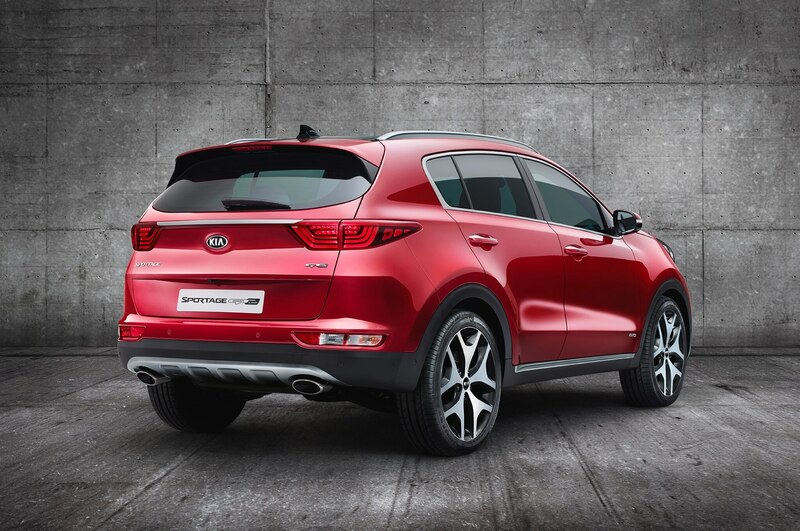 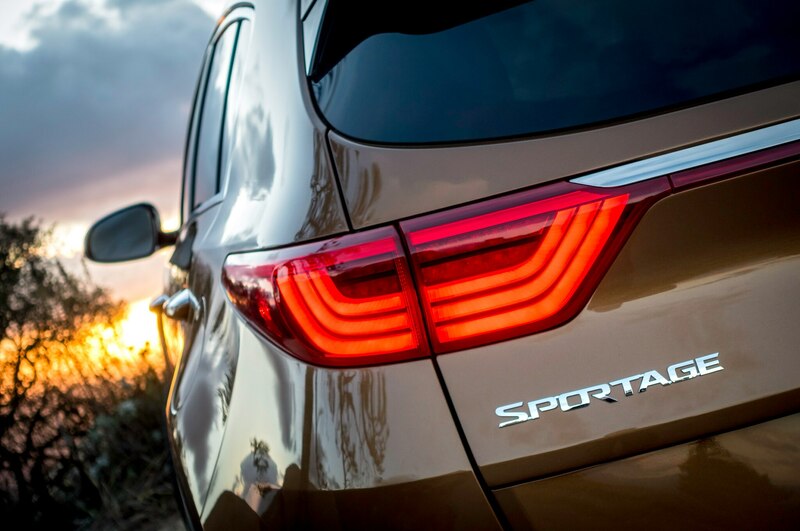 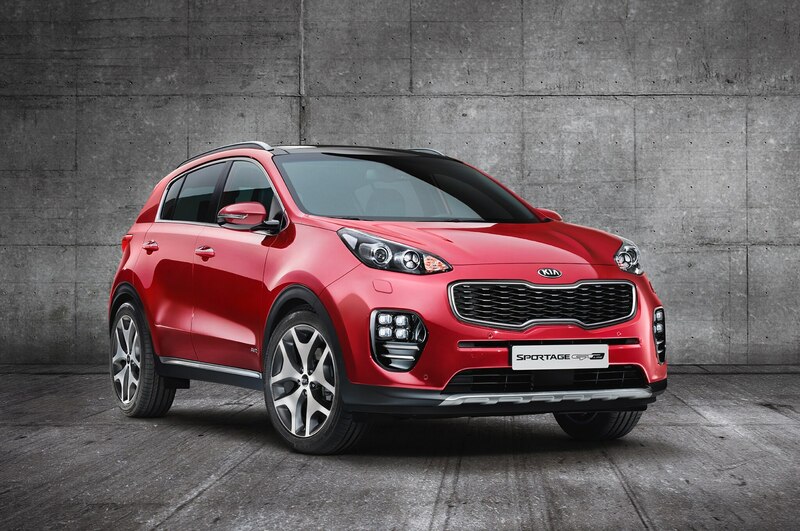 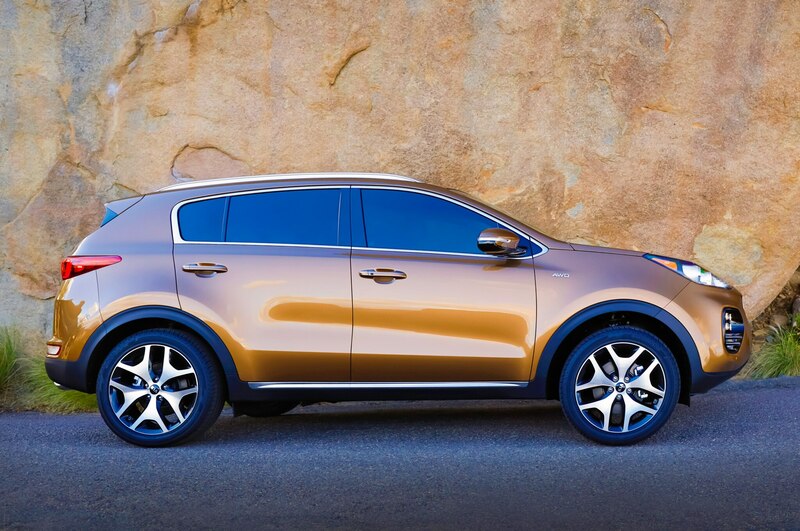 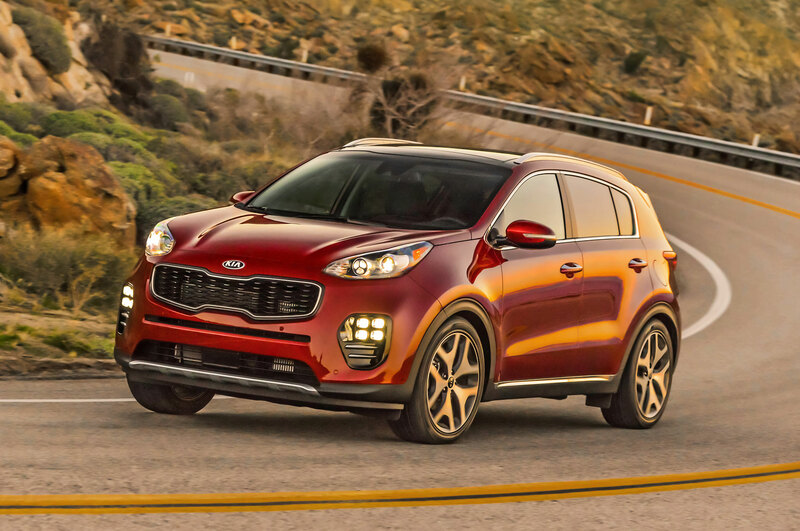 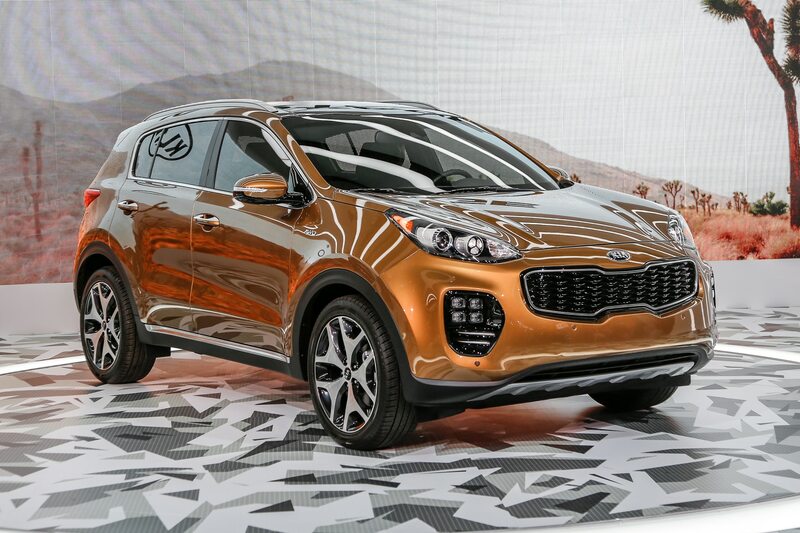 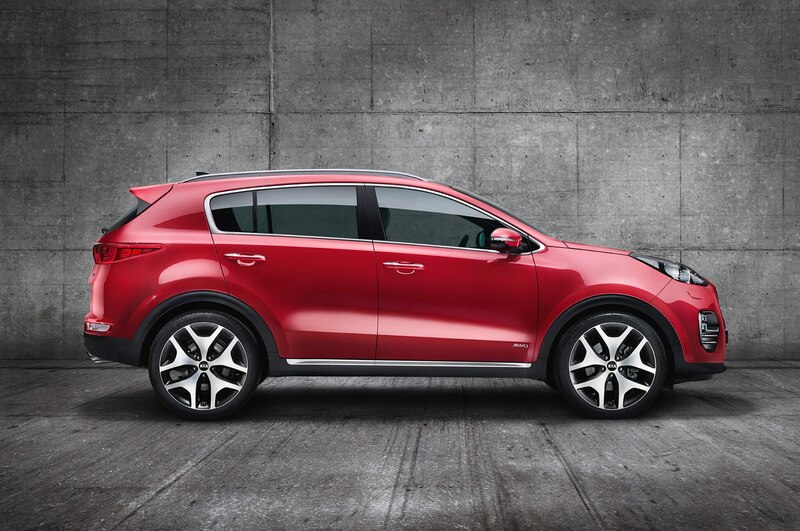 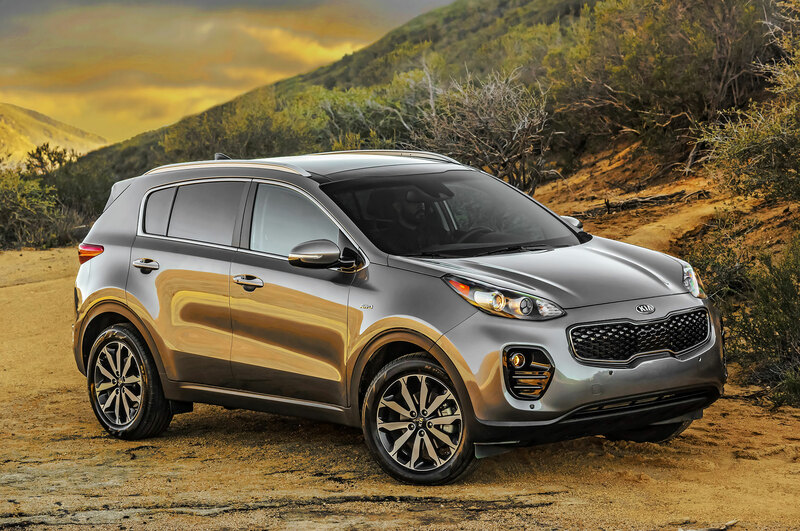 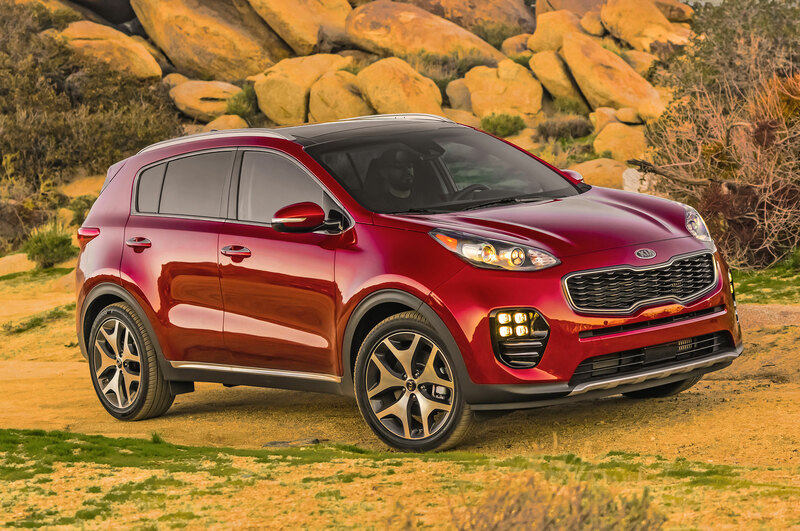 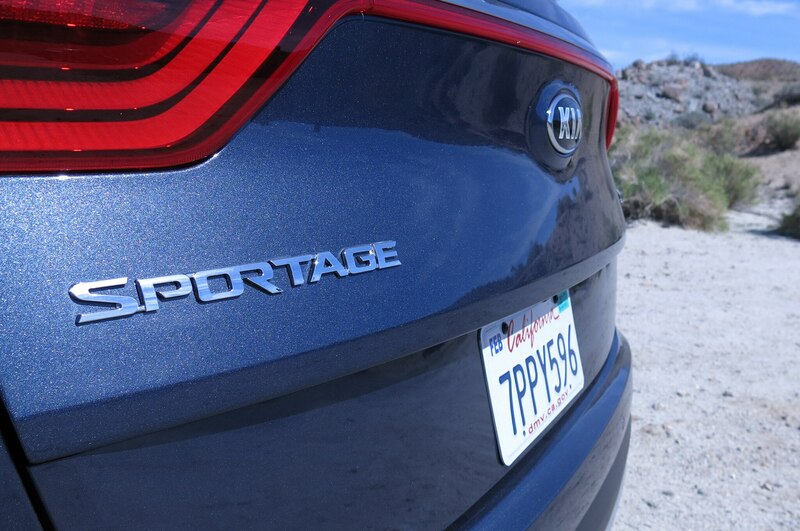 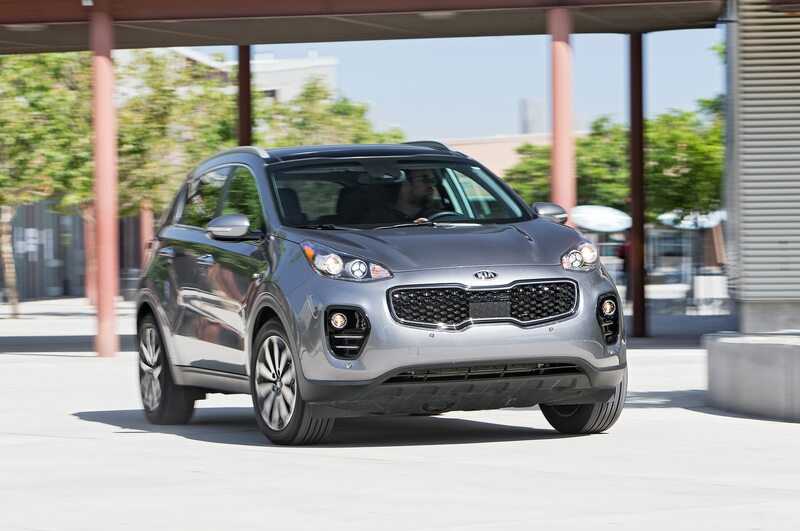 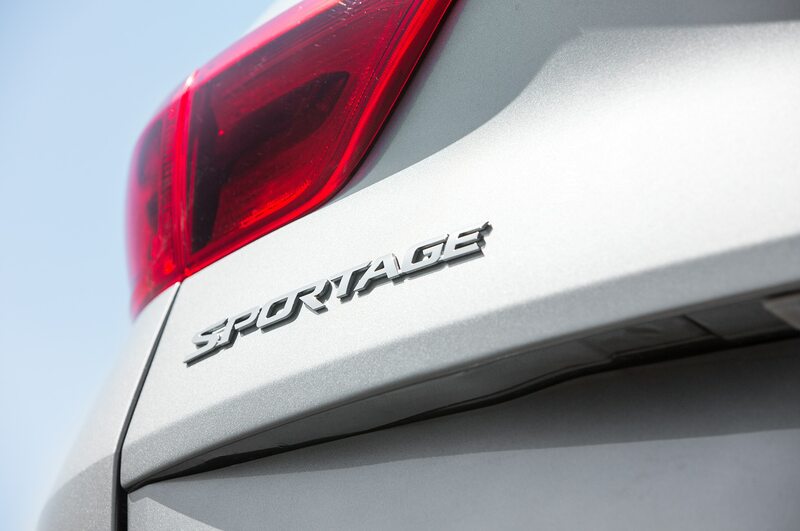 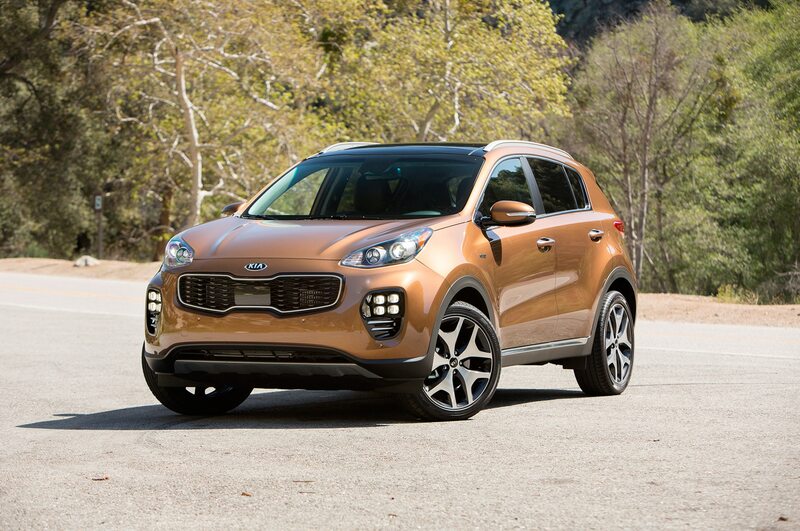 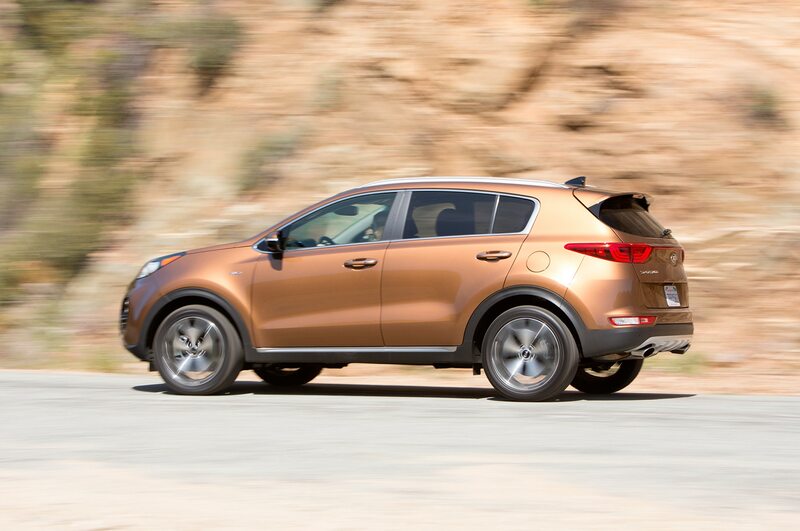 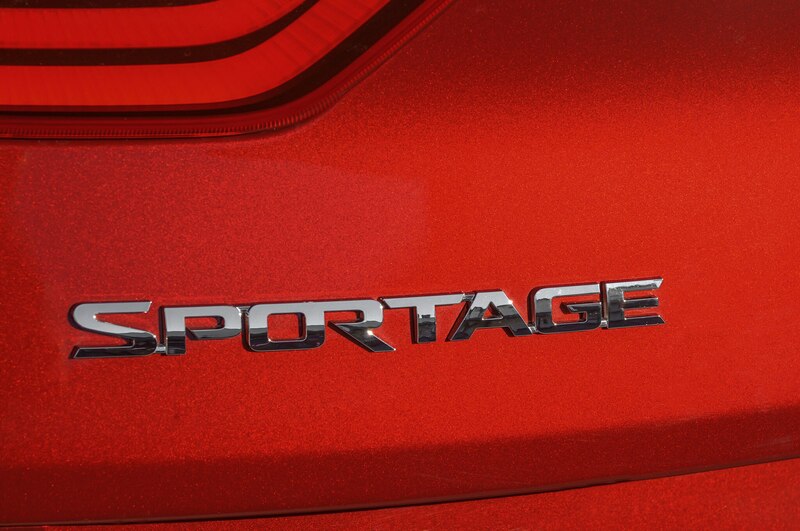 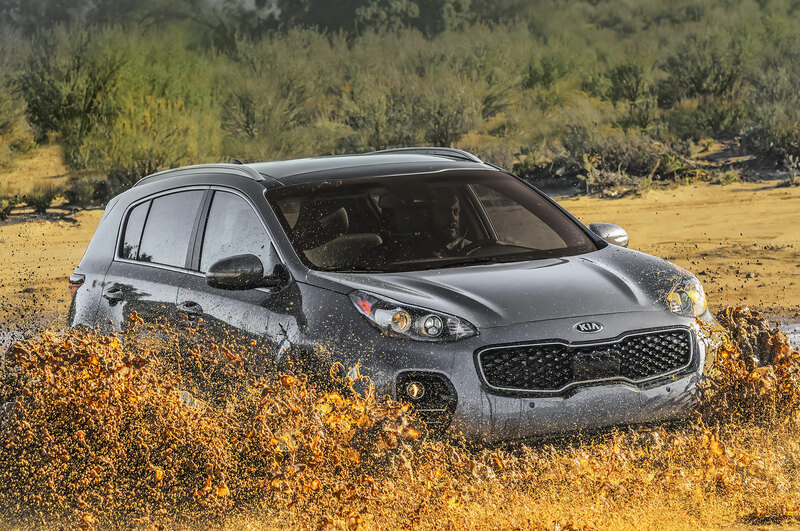 The Kia Sportage, however, has never managed to make much of an impact. 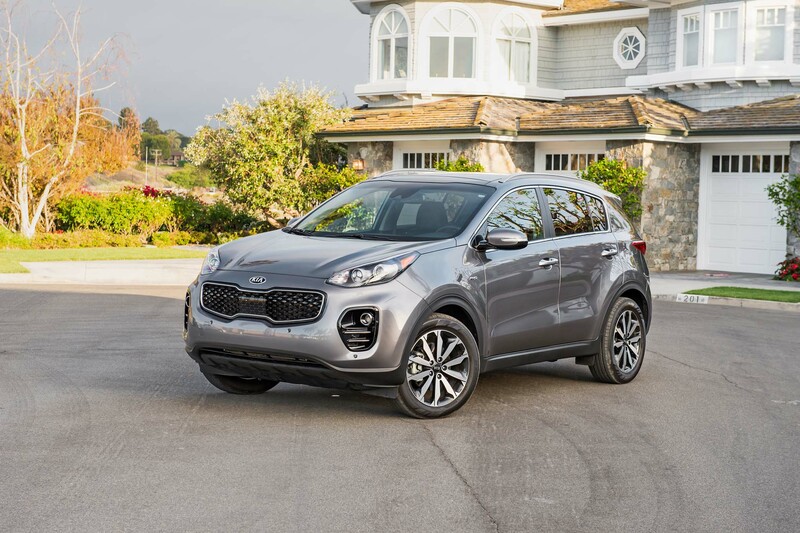 The Sportage’s nearly 54,000 sales last year paled in comparison to the volume-leading Ford Escape, Toyota RAV4, and Honda CR-V, all of which easily cracked the 300,000 mark. 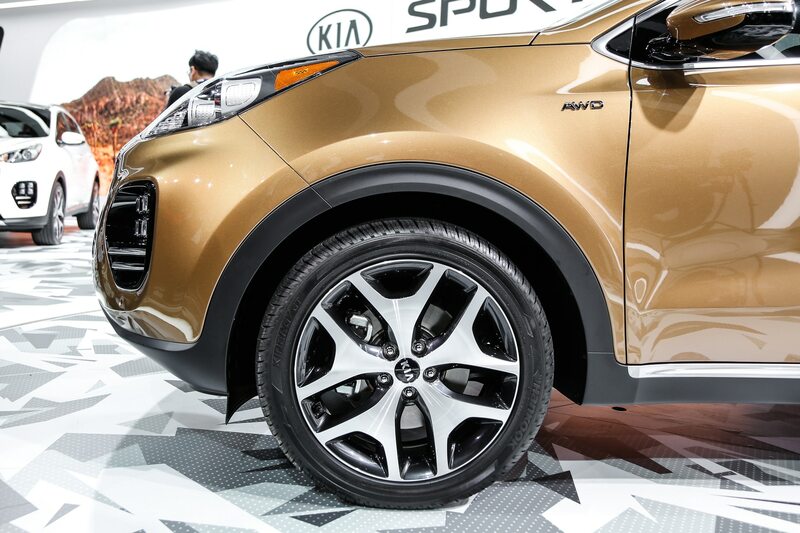 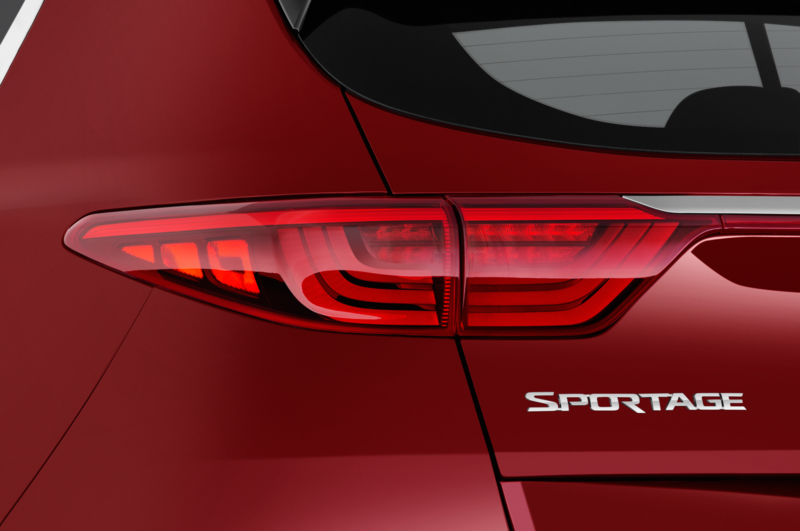 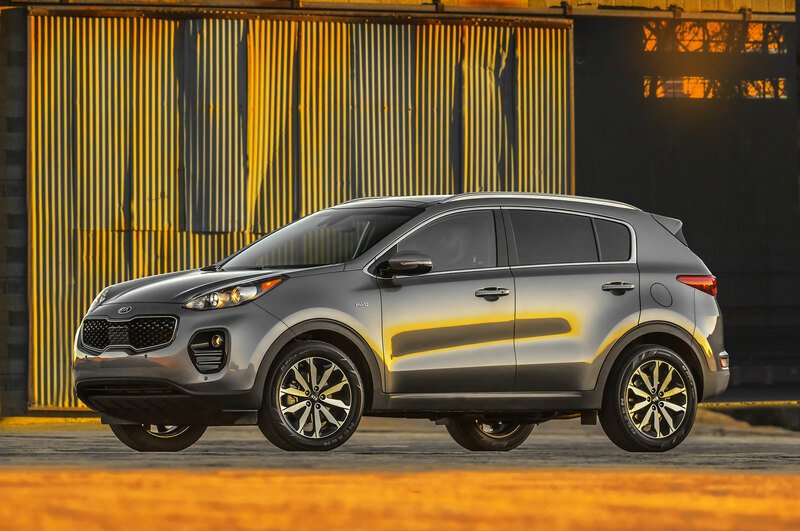 The all-new 2017 Kia Sportage could be the vehicle to draw in more customers than ever before. 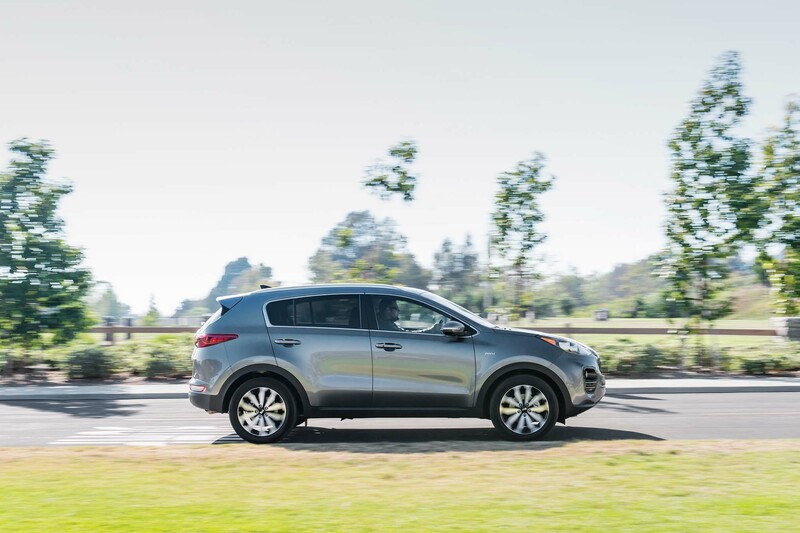 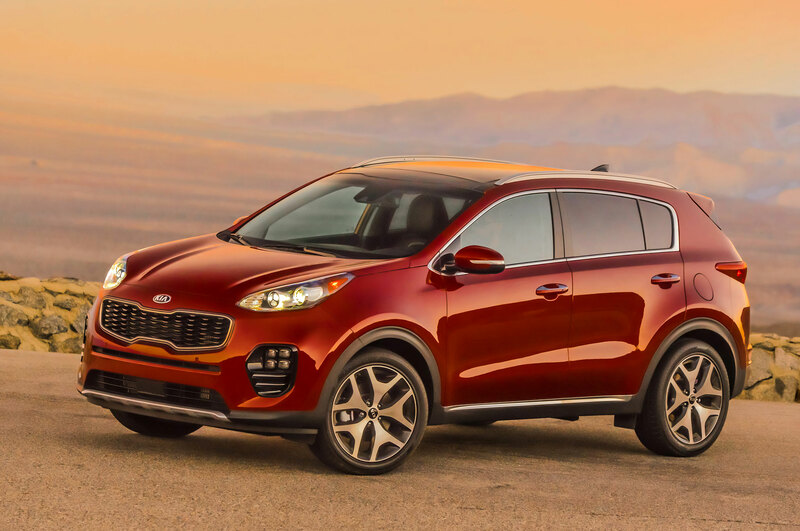 Based on essentially the same platform as the new Hyundai Tucson, the Sportage attempts to bring a mix of style, fun, and practicality to the often-staid crossover segment. The 2017 Kia Sportage grows in both length and wheelbase compared to its predecessor, so head- and legroom increase for both rows of seats. 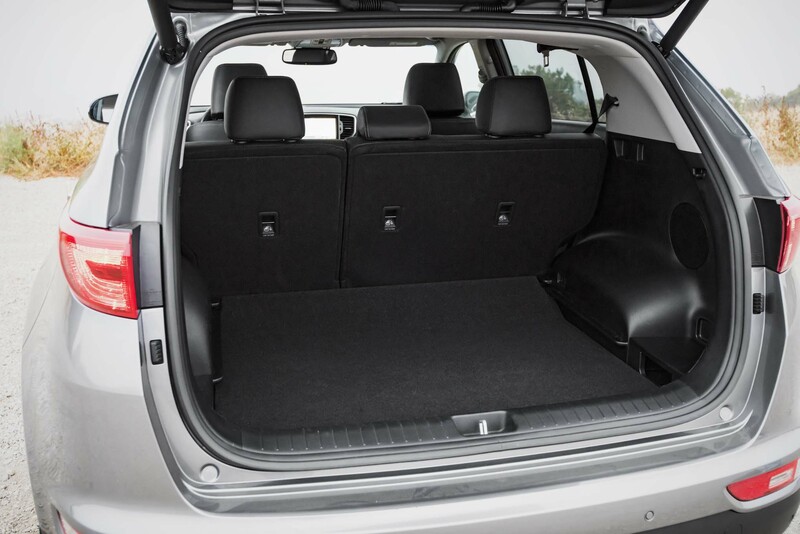 Meanwhile, cargo room climbs 18 percent to 30.7 cubic feet with the seats raised and 60.1 cubic feet with them lowered. 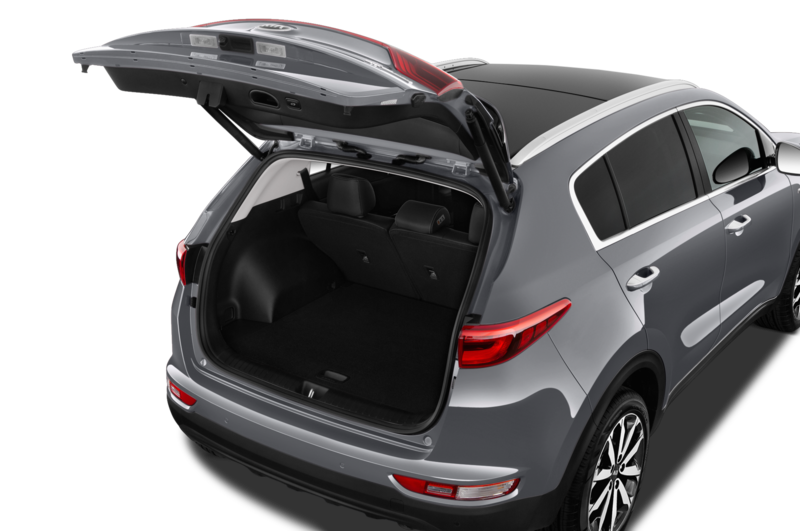 That’s pretty good for the class, though it does fall behind the supremely spacious trunk of the Honda CR-V, as well as the Mazda CX-5, Nissan Rogue, and Ford Escape. 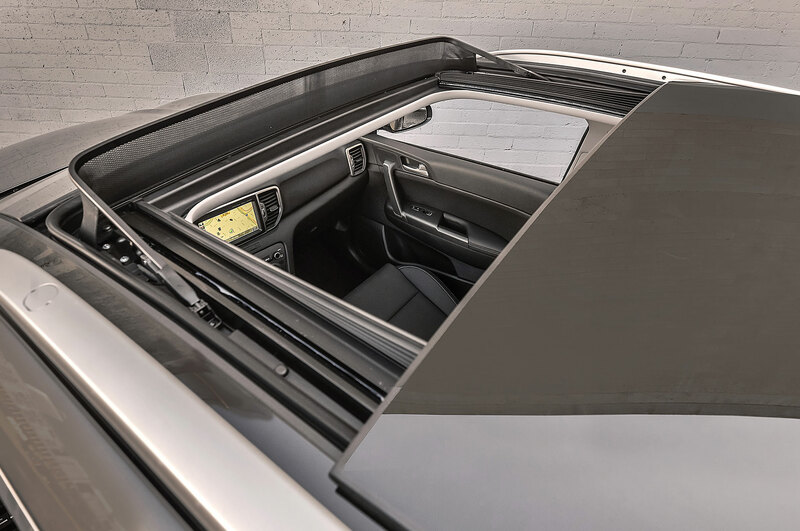 The trunk’s liftover height is now 2 inches lower, too. 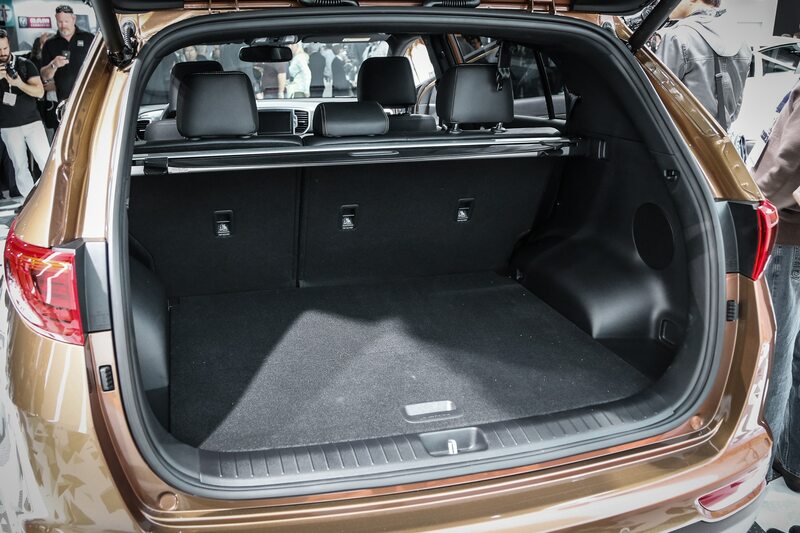 Unfortunately, the extra size (and the increased level of equipment on board) has pushed weight up considerably on all trim levels, with curb weights now ranging from 3,305 pounds to a beefy 3,996 pounds depending on options. 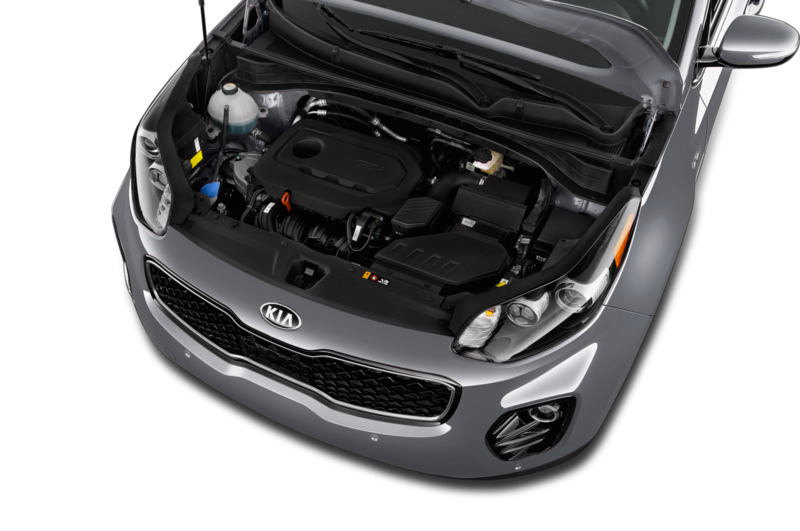 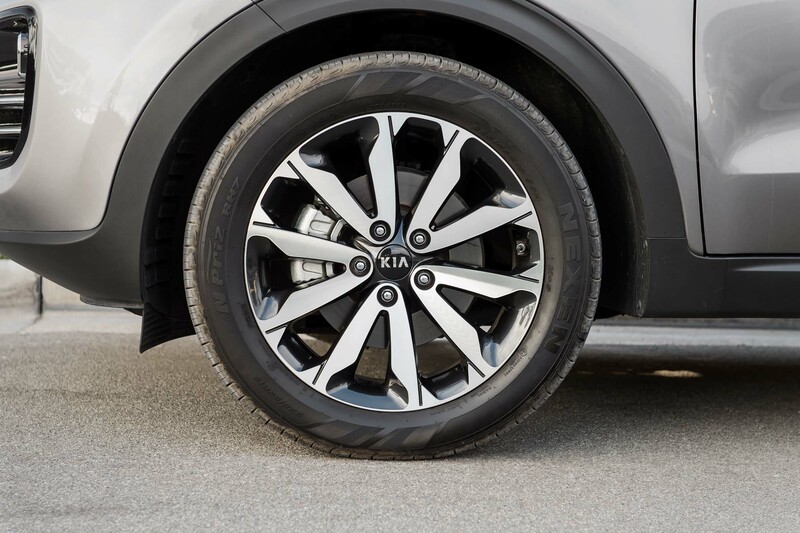 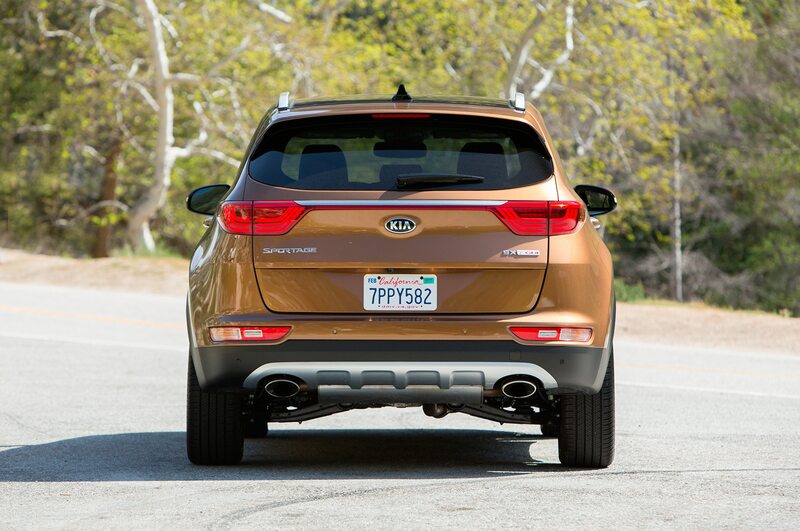 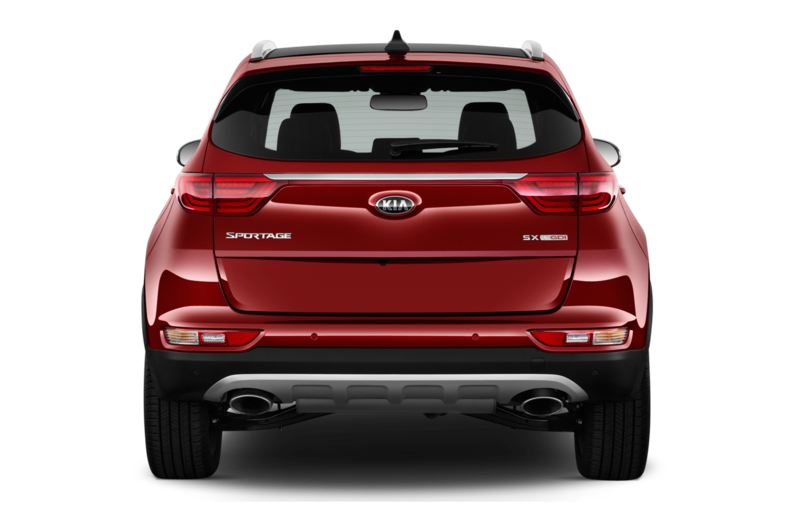 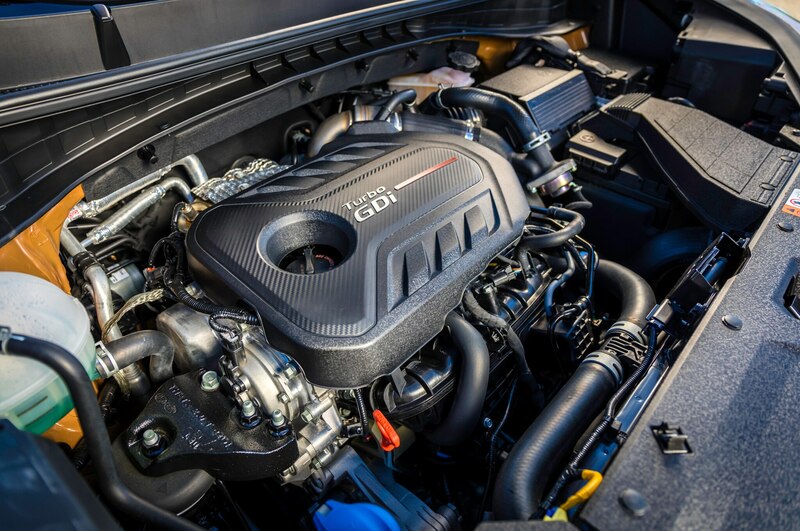 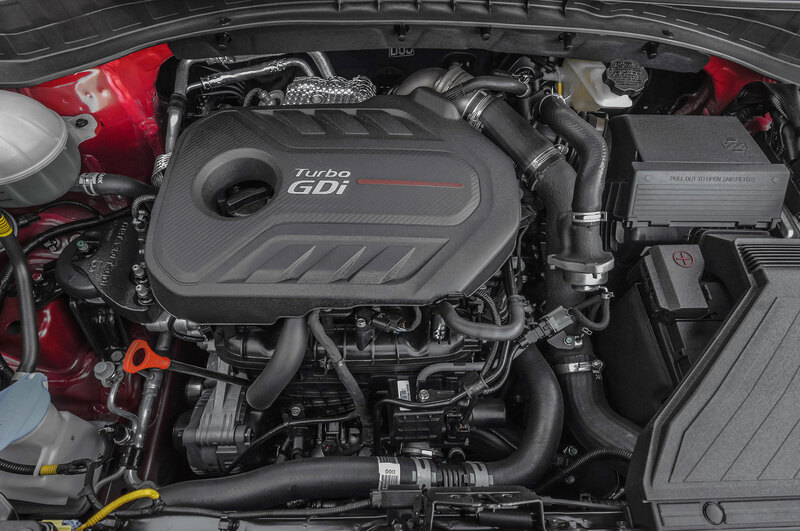 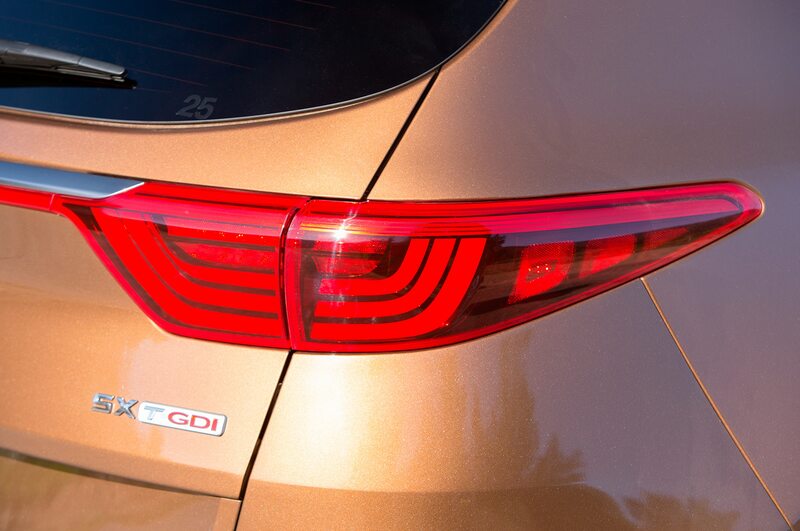 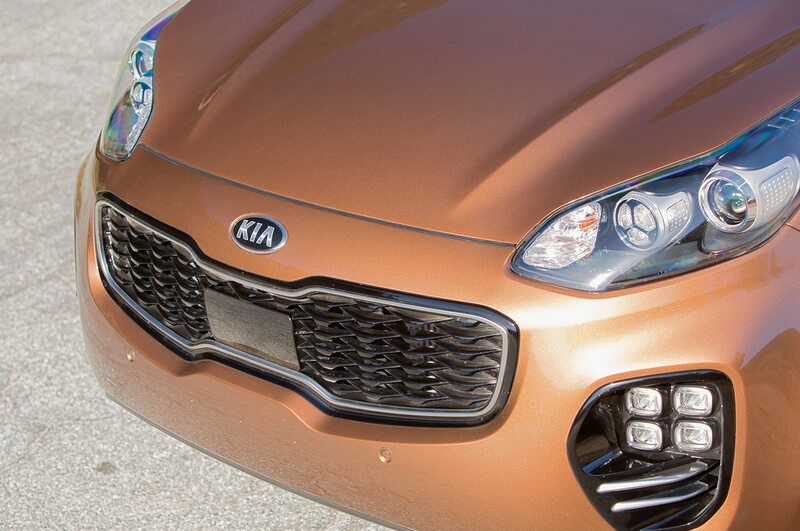 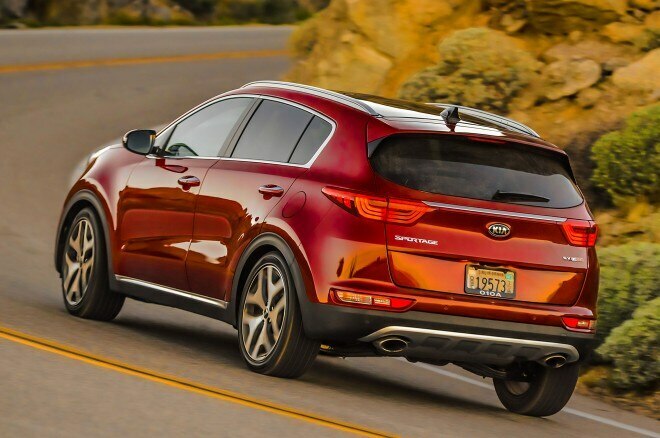 This weight gain comes even though Kia has dramatically increased the use of high-strength steels from 18 to 55 percent. It’s also disappointing when nearly every other new car, from the Chevrolet Cruze up to the Audi Q7, has lost weight when it was redesigned. 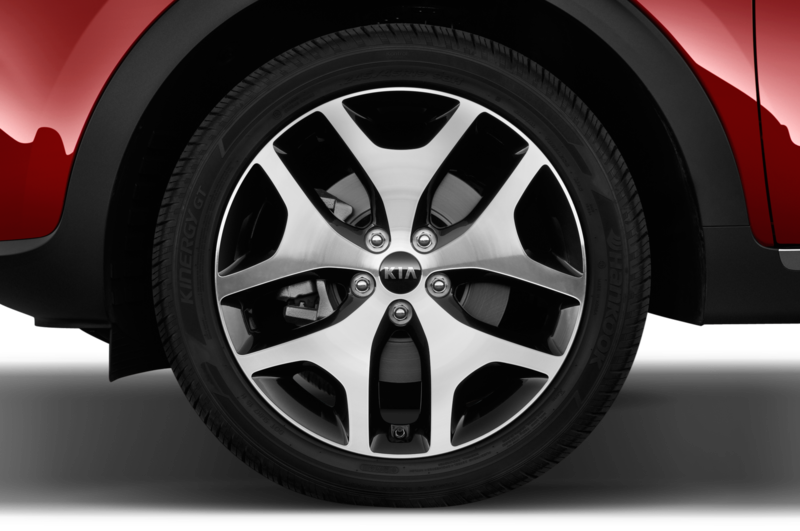 The high-strength steels do pay off in terms of safety and visibility. 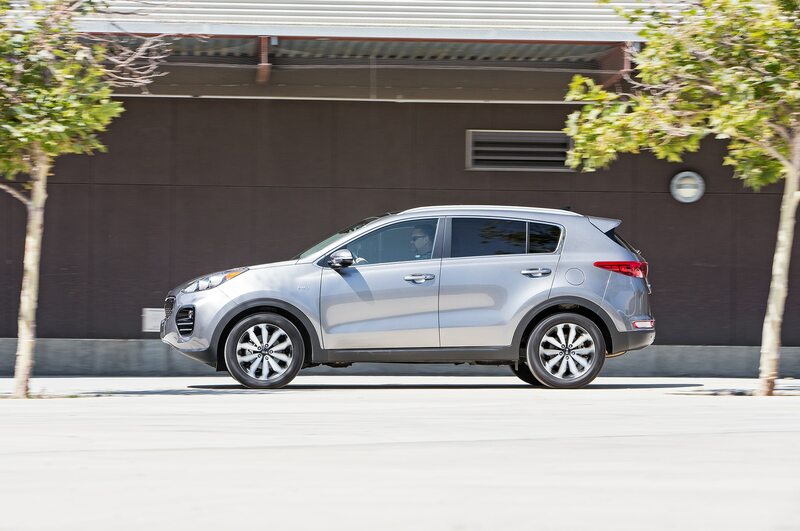 The Sportage’s A-pillars are an inch narrower than before and its C-pillars 2 inches narrower, reducing blindspots, yet structural rigidity is up 39 percent. 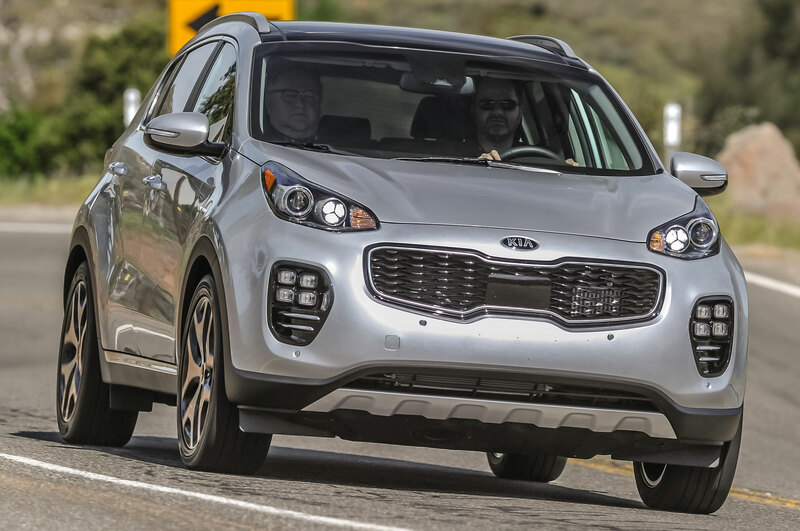 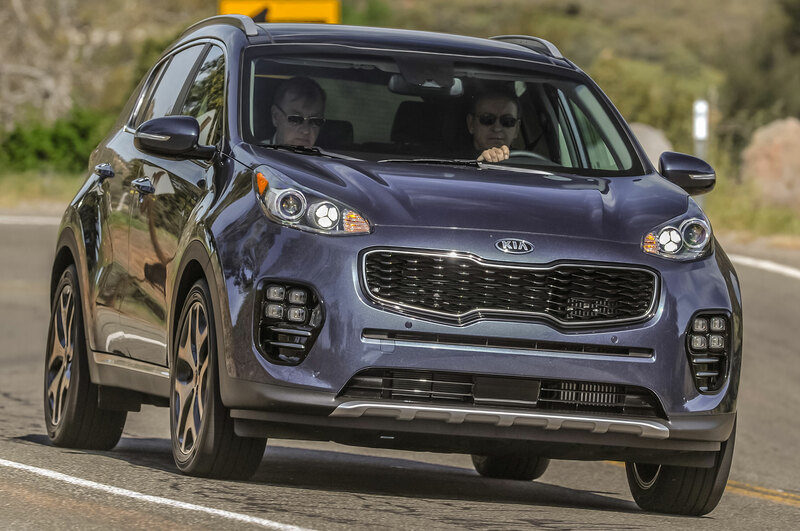 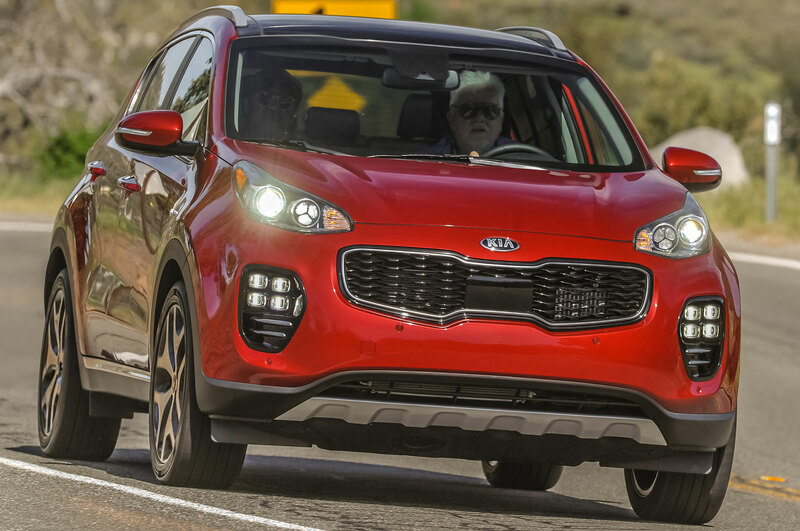 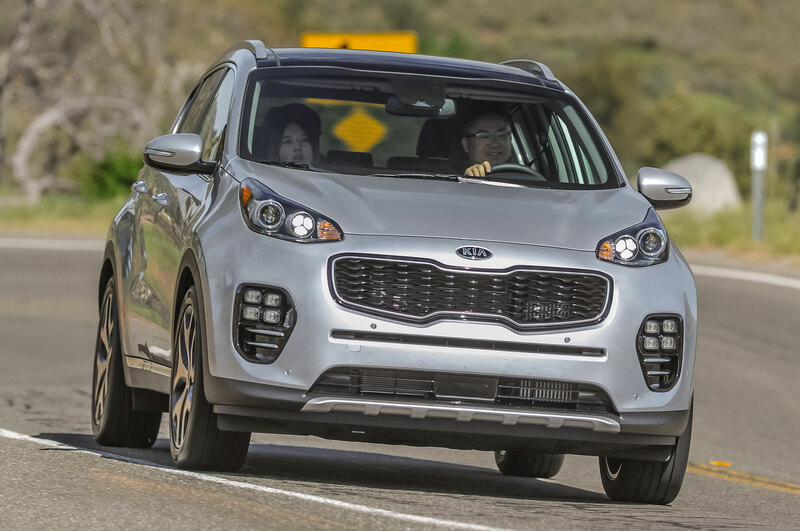 Plus, Kia expects the 2017 Sportage will ace the tough Insurance Institute for Highway Safety small-overlap crash test; the current model scores a “Poor” rating in that test. 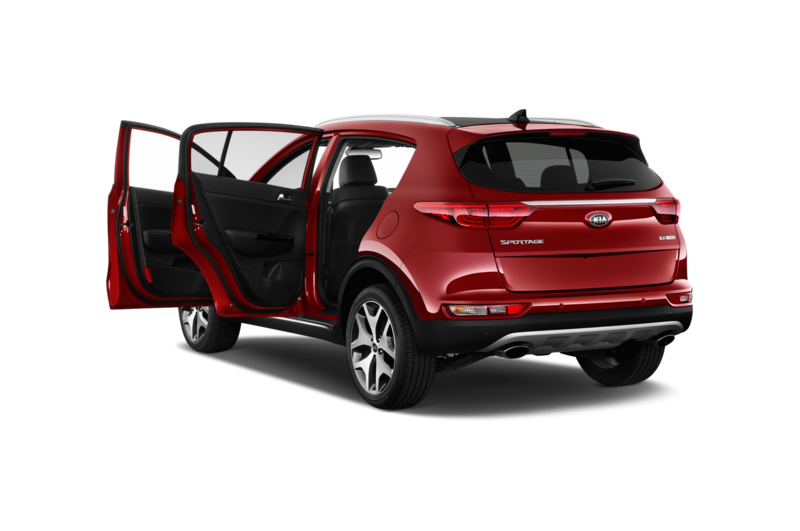 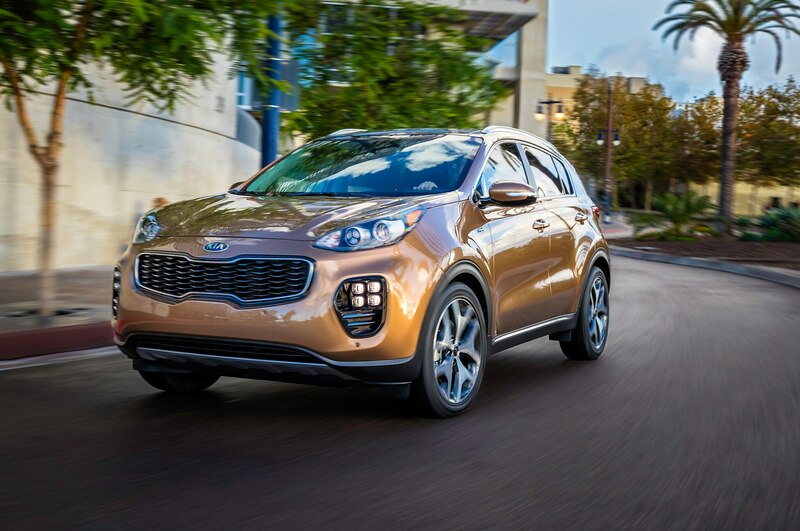 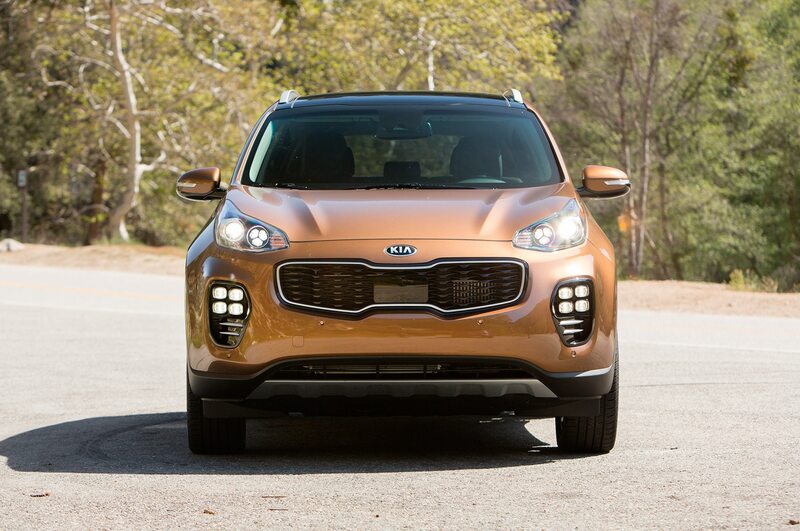 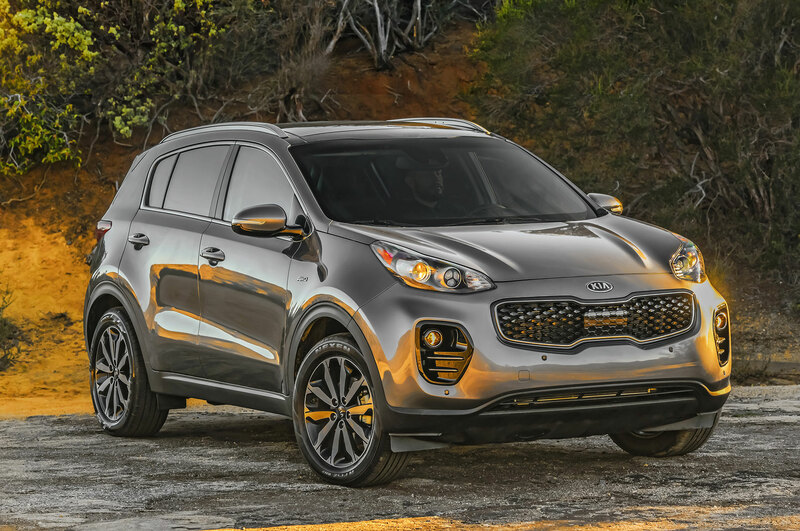 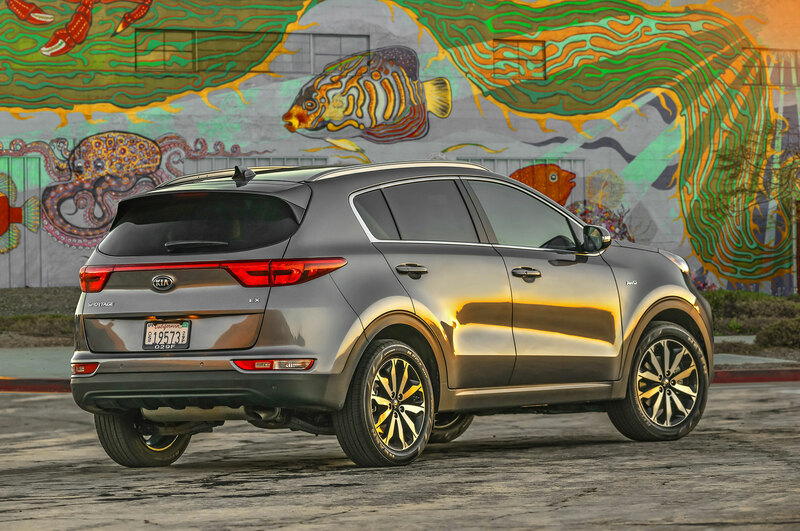 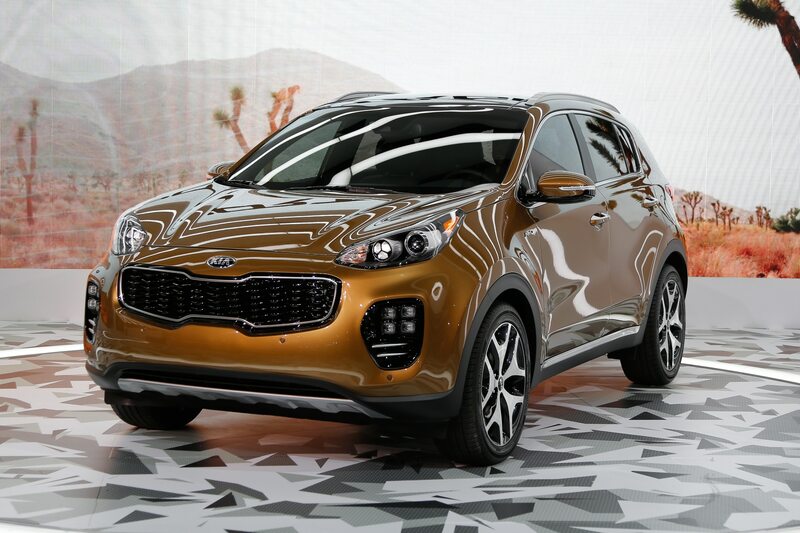 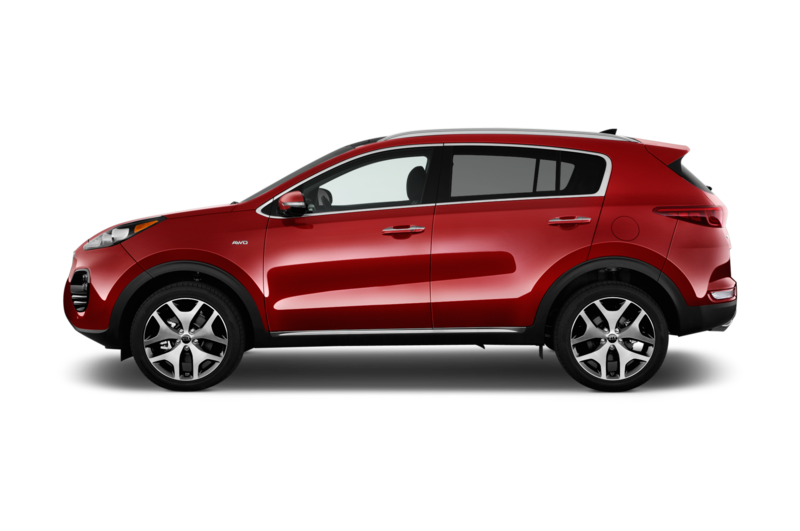 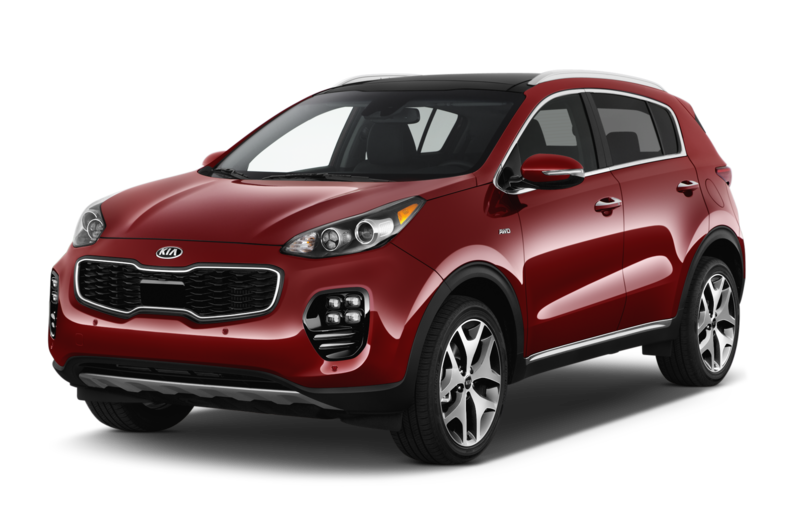 A brash, new exterior style is without a doubt the most controversial thing about the 2017 Kia Sportage. 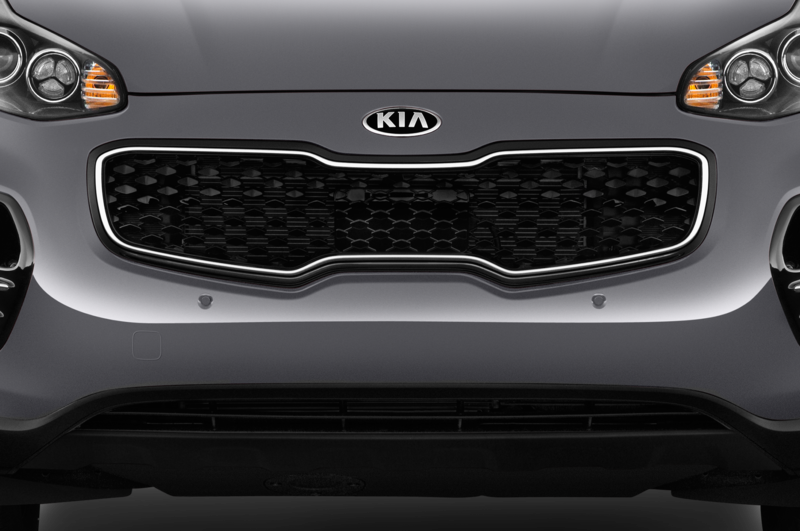 We dig the smooth, chunky look, but we suspect not everyone will love the cartoonish front fascia and high-mounted headlights. 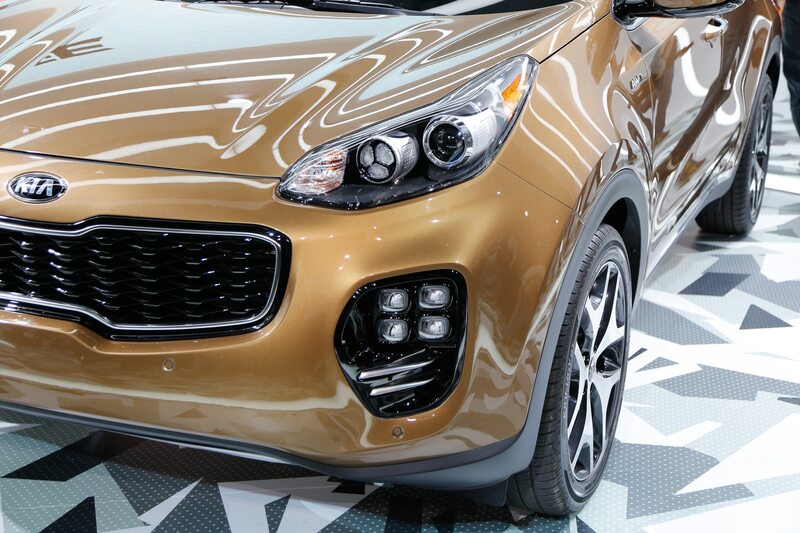 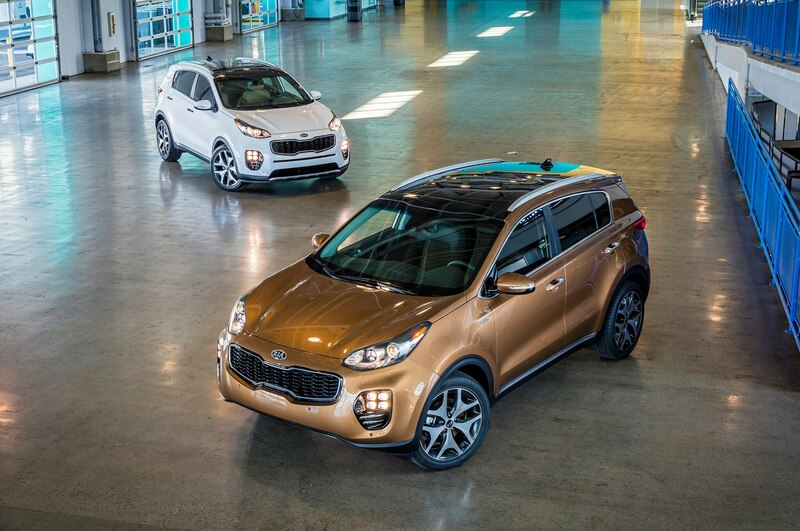 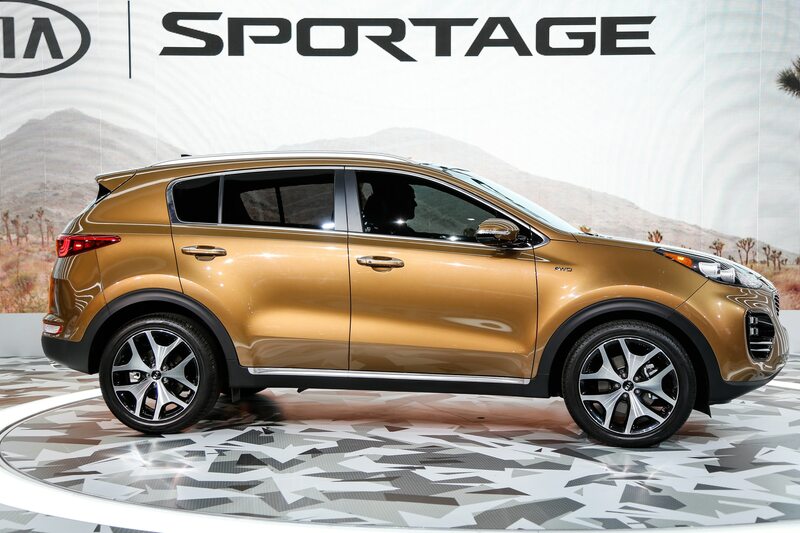 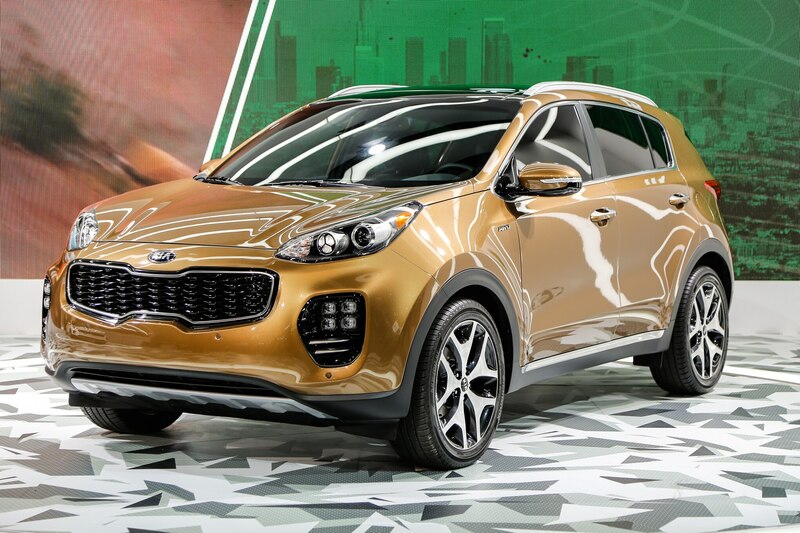 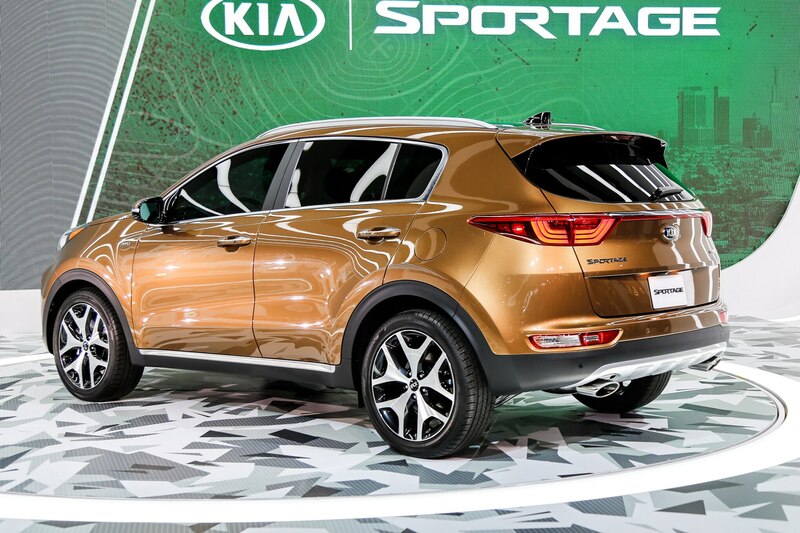 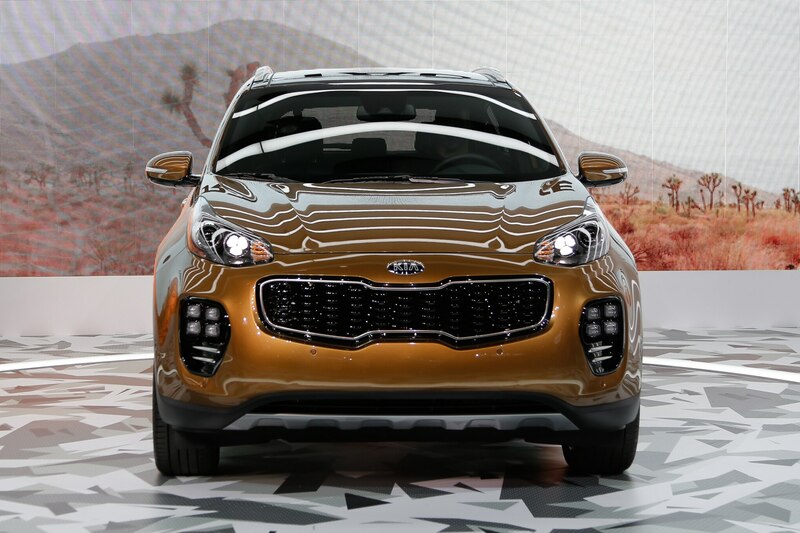 Nevertheless, once you consider the chunky fenders and an airy greenhouse, plus lots of fun color choices, the Sportage is a lot more interesting to look at the rest of the segment’s entries. 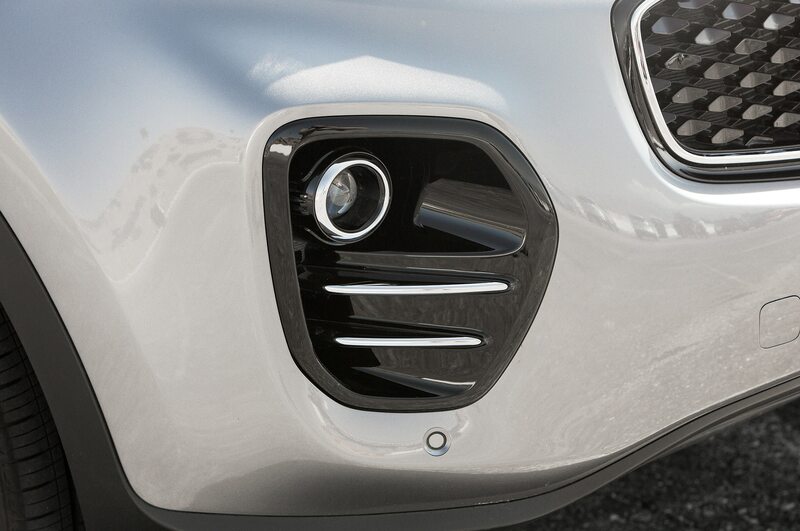 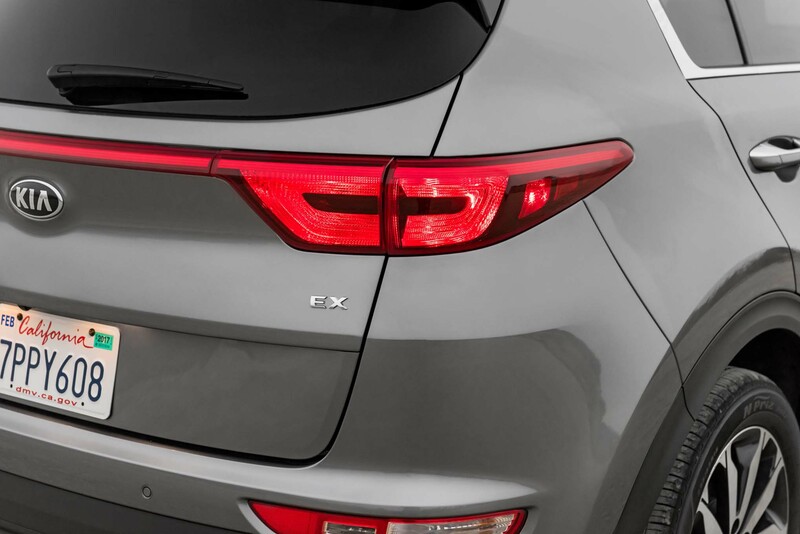 Standard LED running lights and dual exhausts imbue a sporty look across the range; wheel sizes range from 17 to 19 inches depending on trim level. 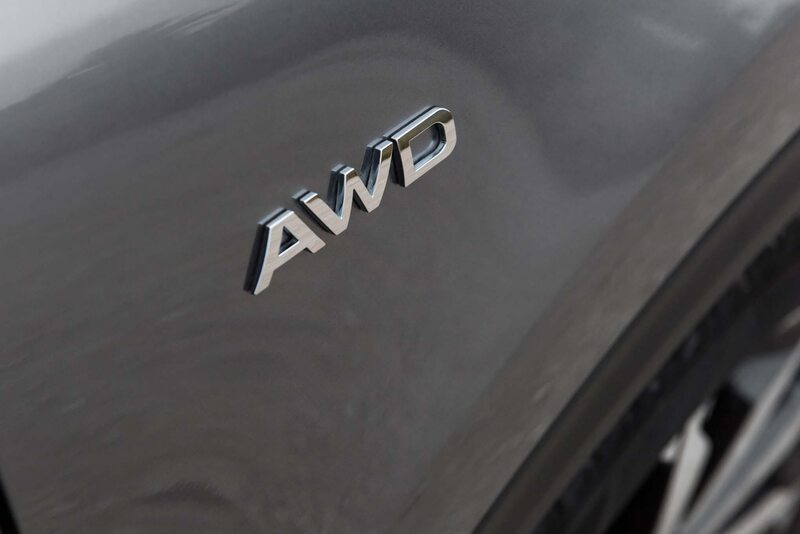 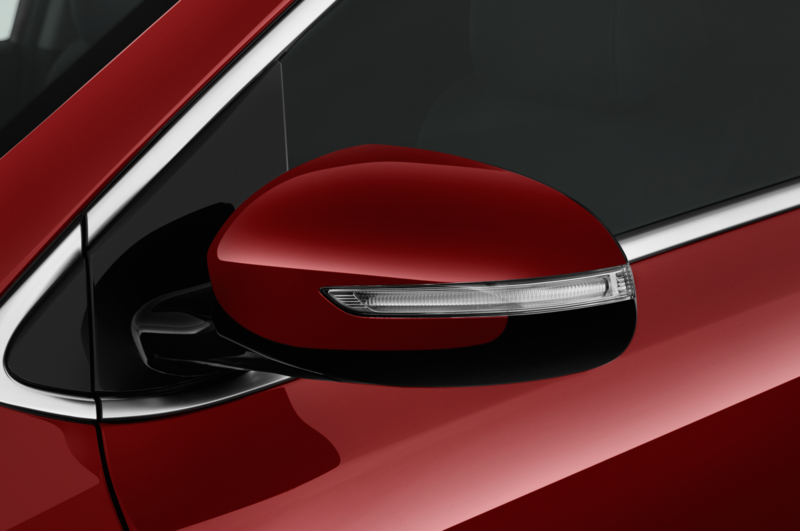 All-wheel-drive models get a unique front fascia with more clearance for better approach angles, as well as a 0.4-inch-higher ride height. 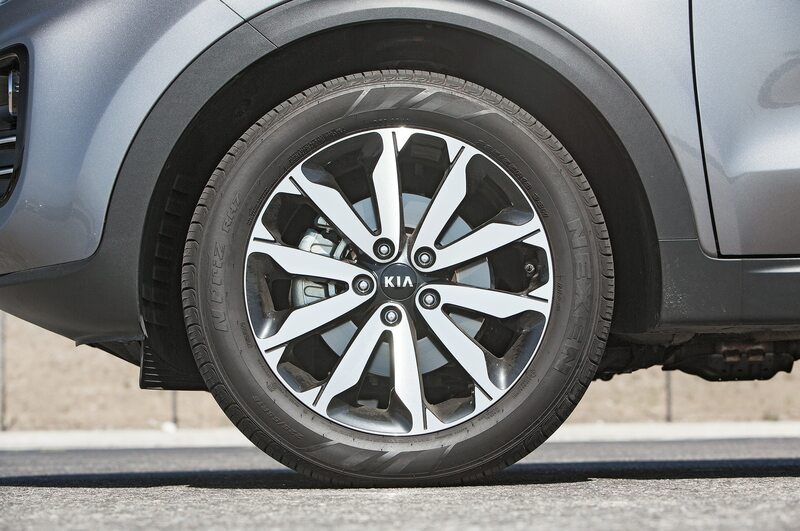 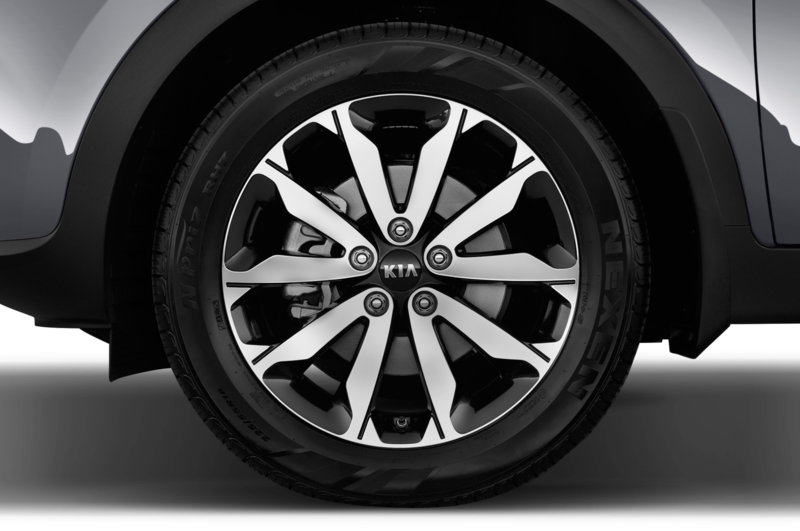 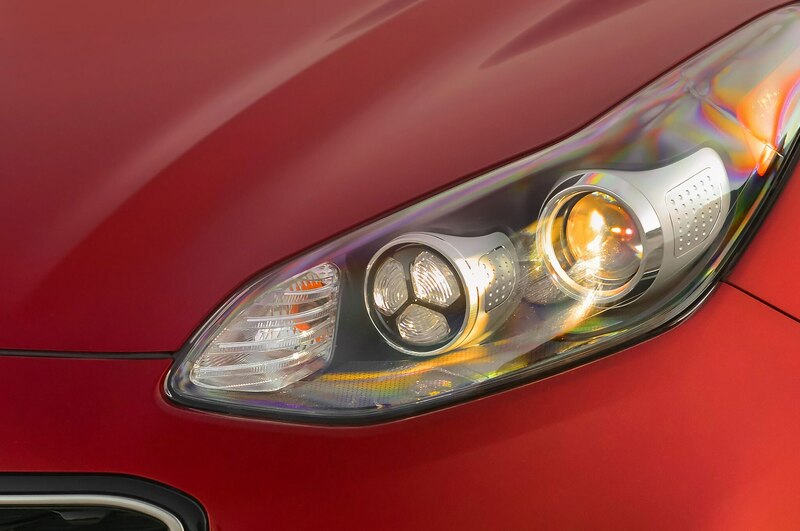 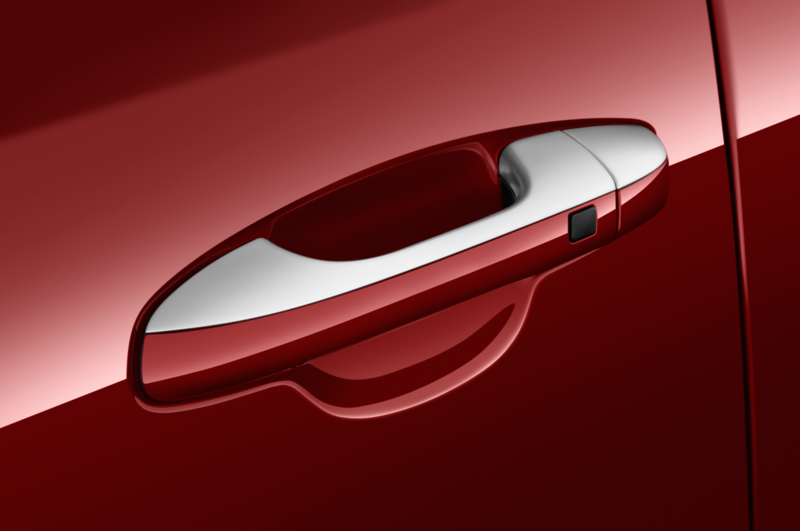 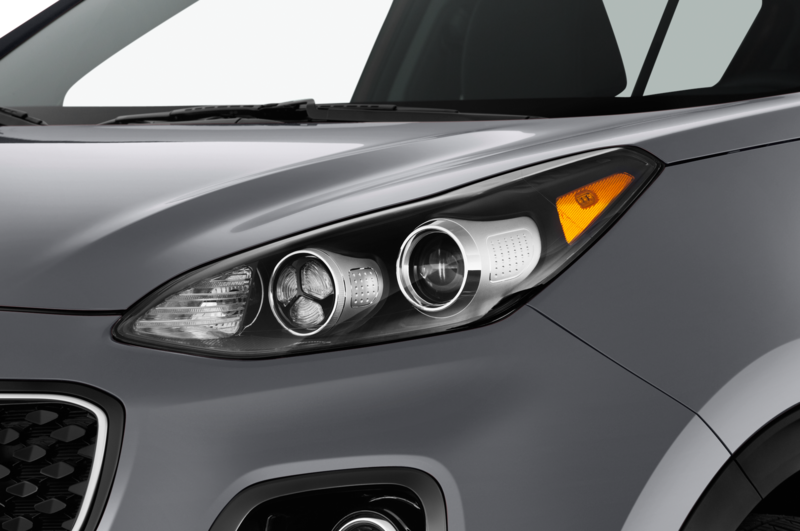 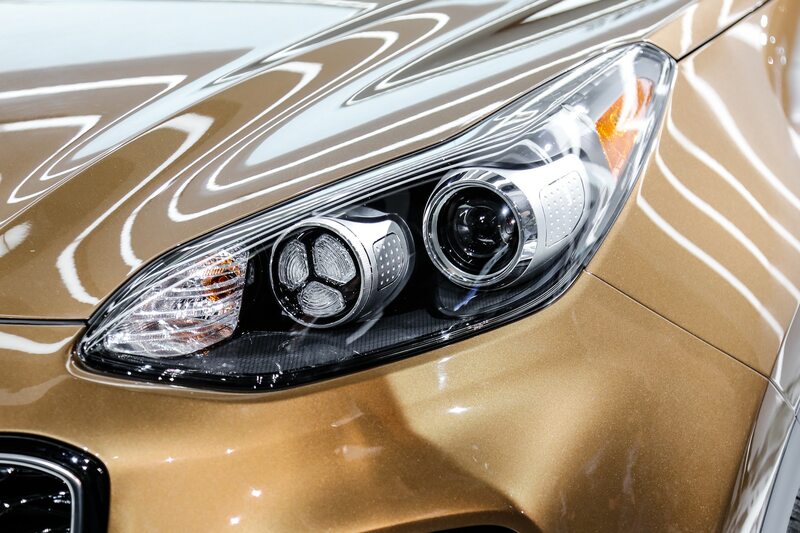 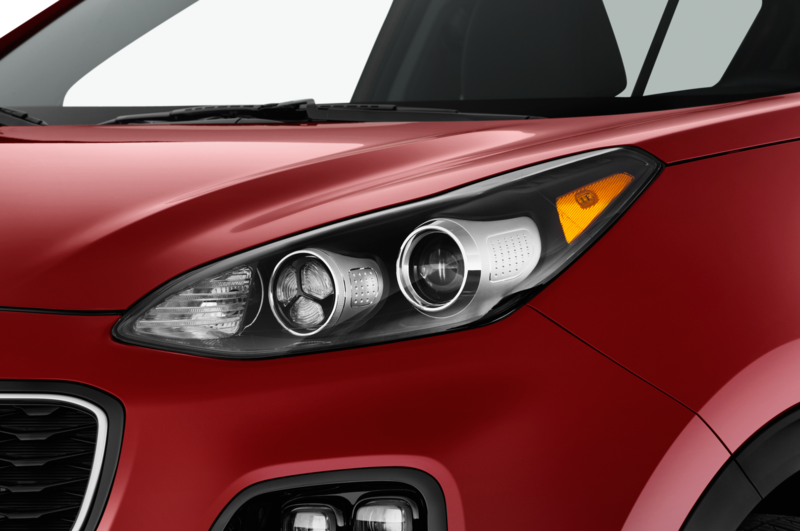 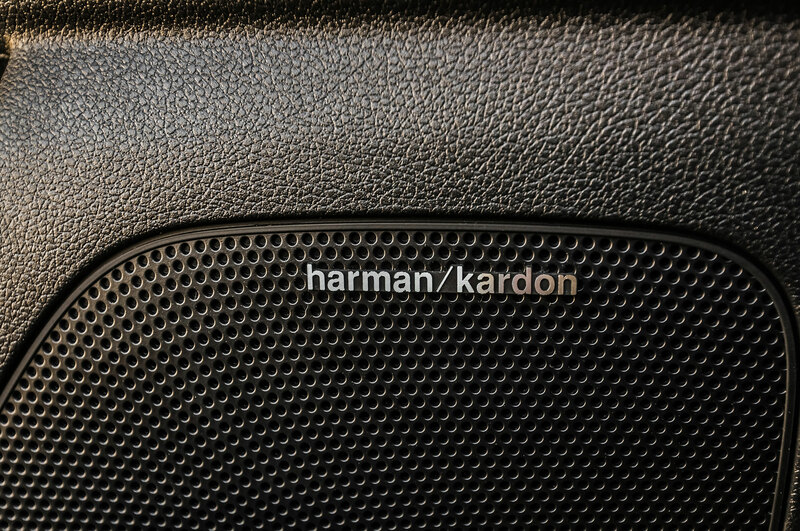 Of course, we doubt most Sportage drivers will get much benefit from these last details except when tackling deep snow. 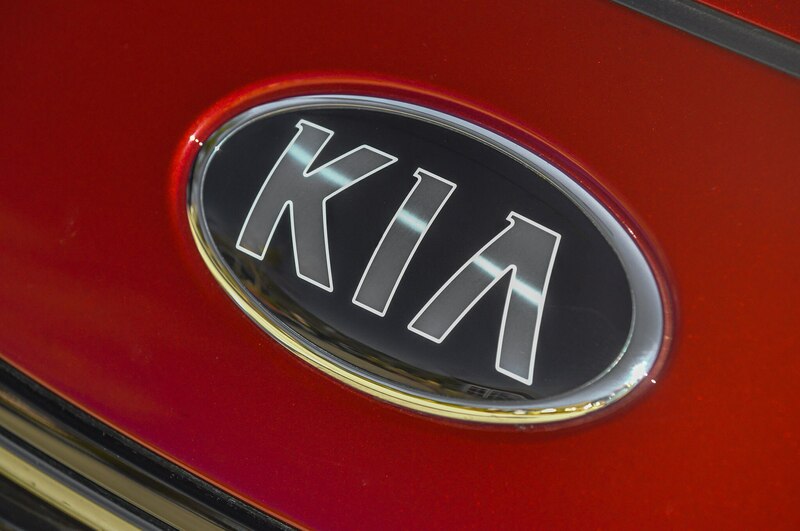 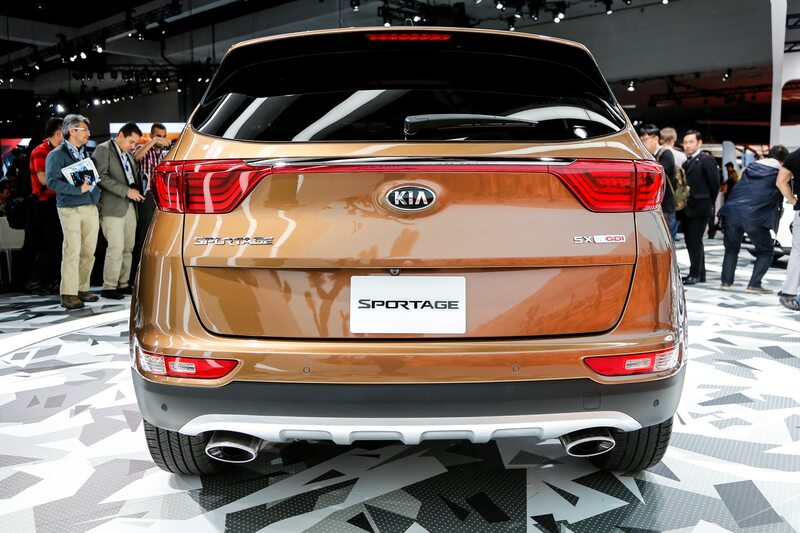 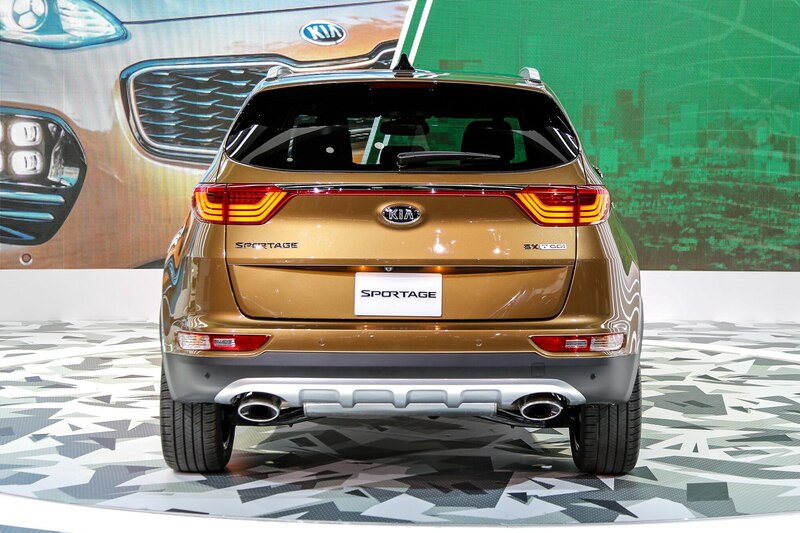 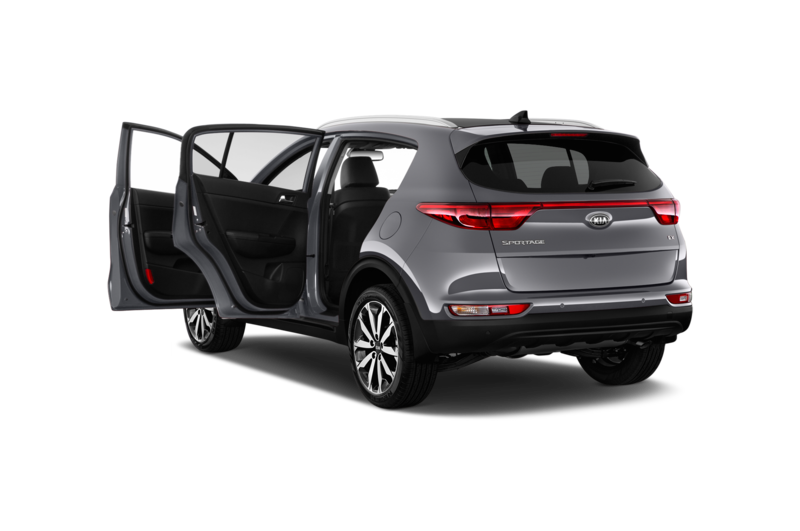 Since Kia sells twice as many Sportages in Europe as in the U.S., the Korean company let the Europeans take the lead in development. 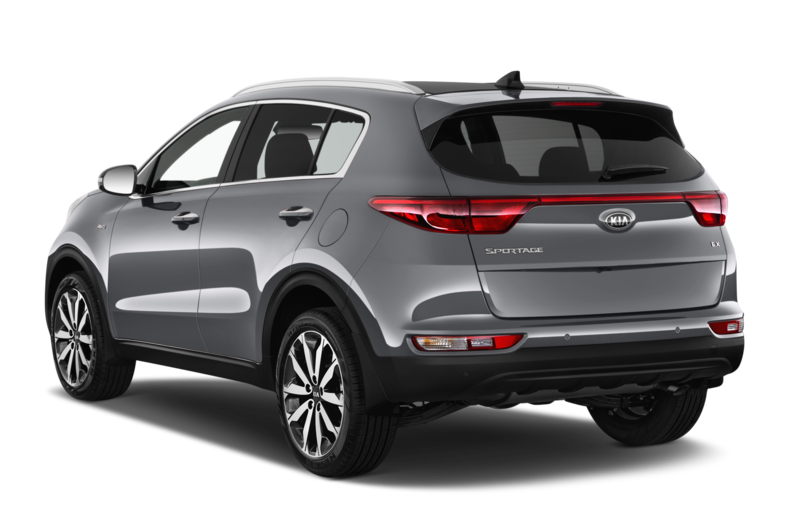 The official benchmark for the new 2017 model is the Volkswagen Tiguan, says Sportage product planner Dan Sherman, because Kia wants a fun-to-drive character. 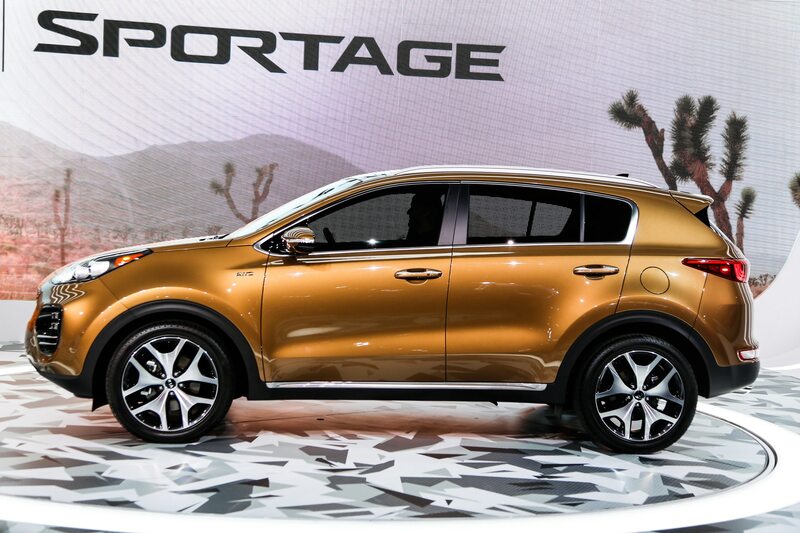 “Our point of difference is a more dynamic experience overall,” Sherman says. 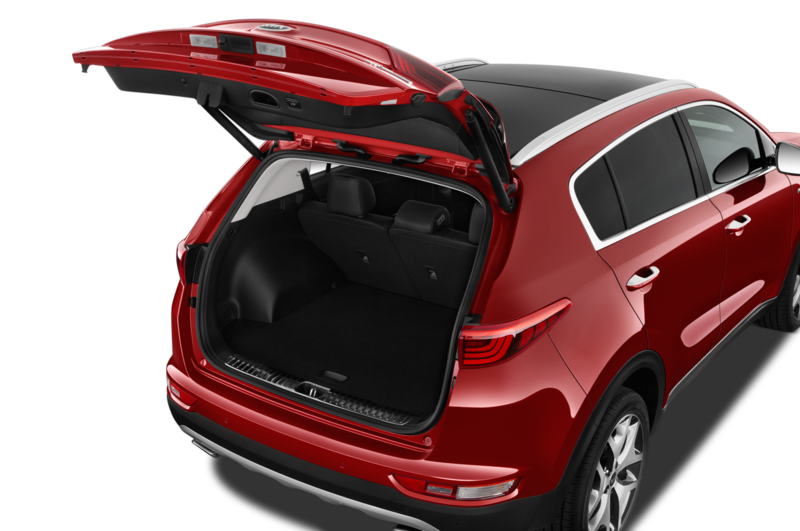 Only the fully loaded, 2017 SX Turbo model was available for our drive, though the majority of shoppers buy LX and EX models. 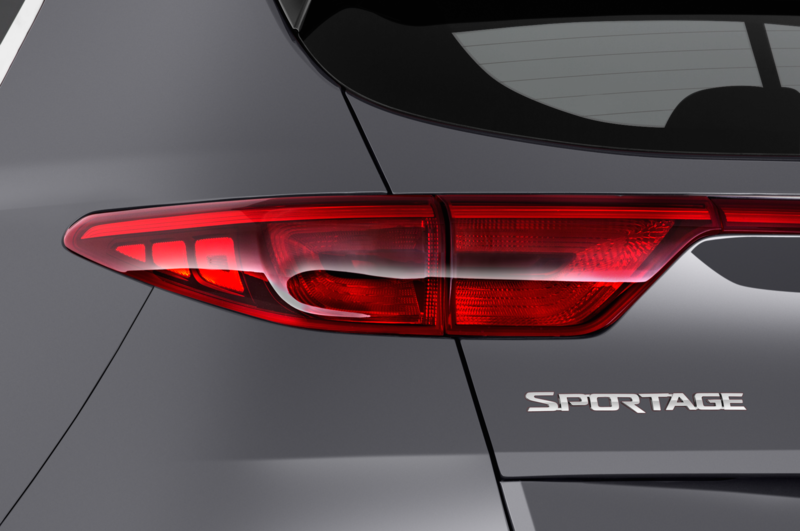 It’s the sporty model for people who, like us, care more about carving the mountainous two-lanes above San Diego than going to Costco. 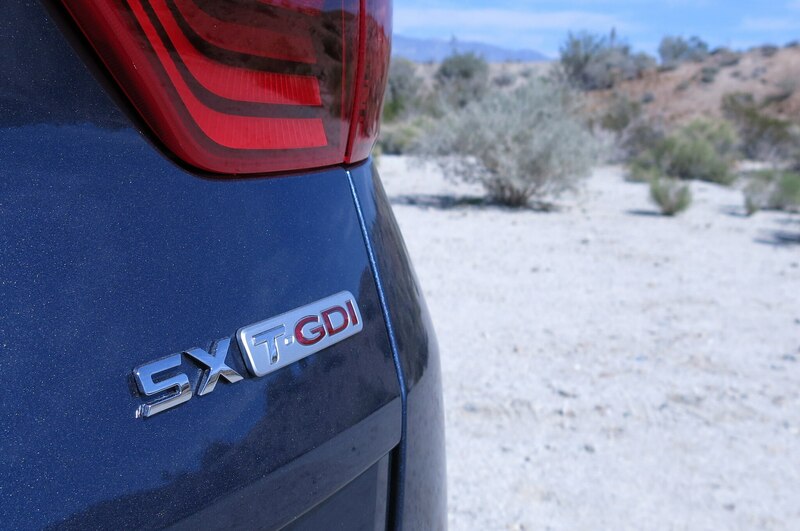 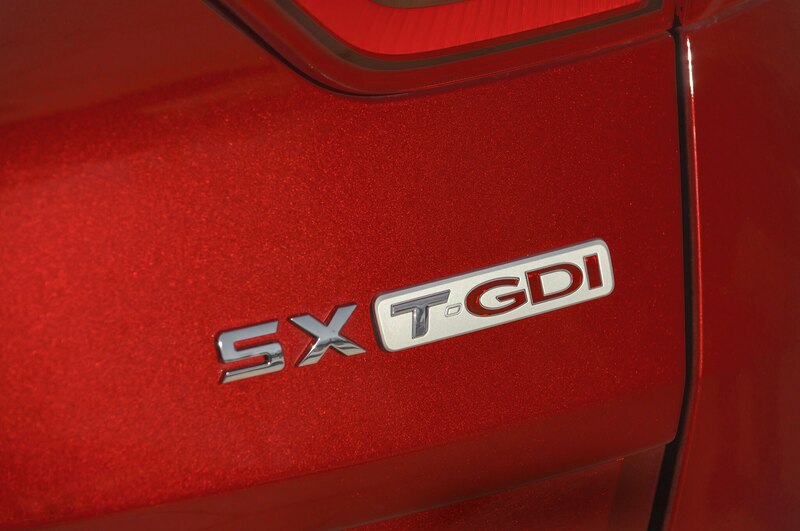 In addition to a 2.0-liter turbo-four engine, the SX gets larger brakes and firmer damper tuning than the LX and EX models, which themselves make do with a 181-hp, 2.4-liter inline-four. 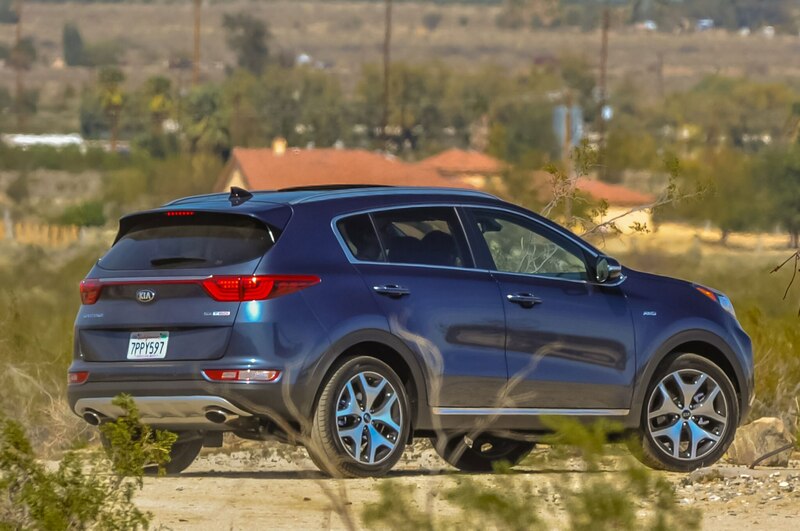 With the caveat that it’s still a crossover, the Sportage SX is enjoyable to drive. 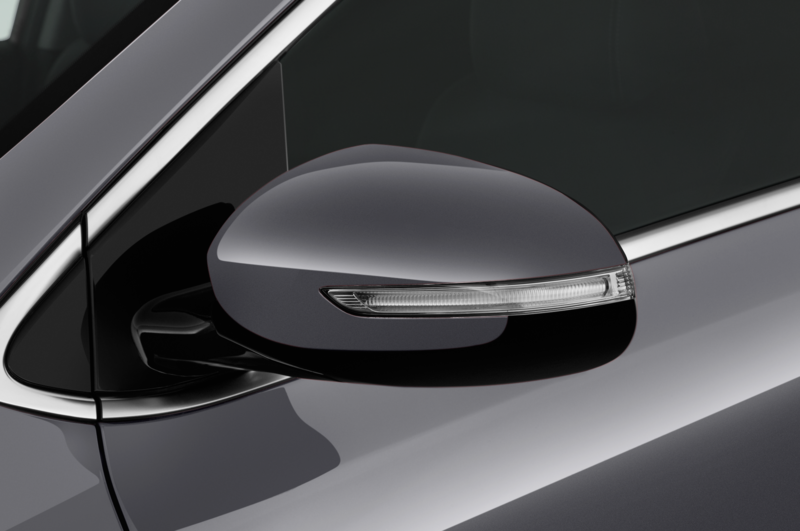 Body motions are well damped, with little floatiness through turns. 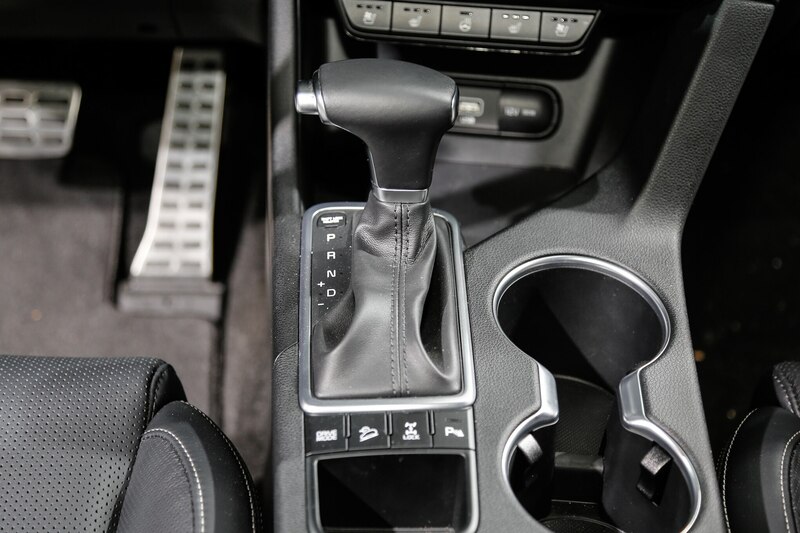 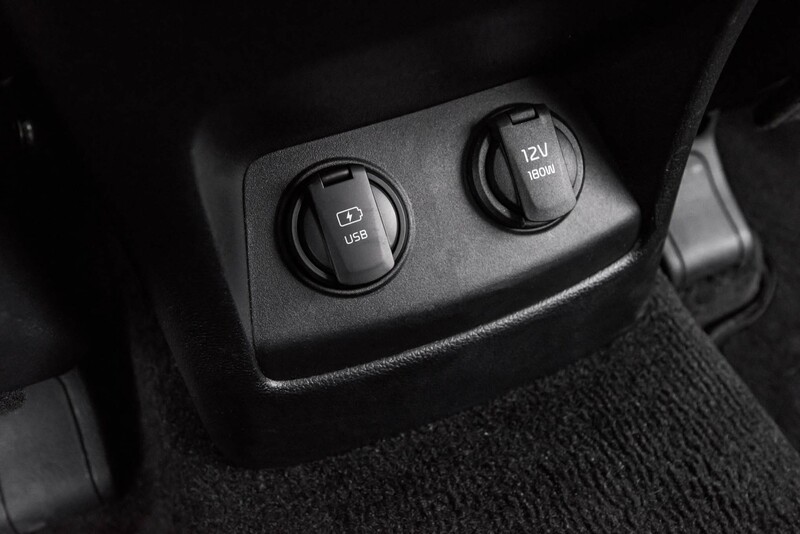 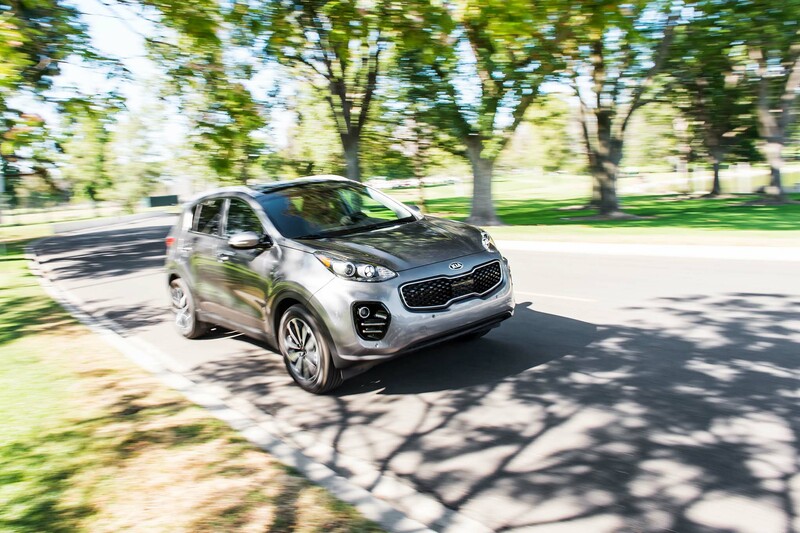 The electric-assist power steering is greatly improved from the old Sportage, thanks in part to a more powerful processor and a redesigned steering box. 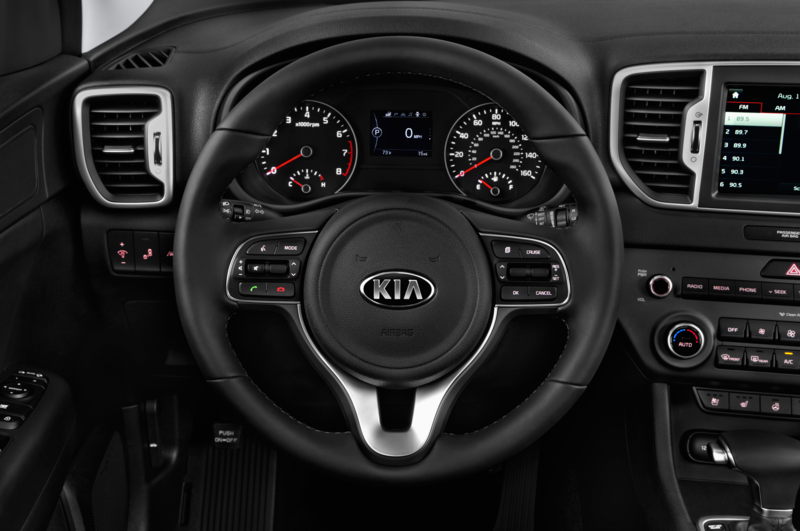 Steering effort loads up naturally and delivers a very progressive, realistic feel. 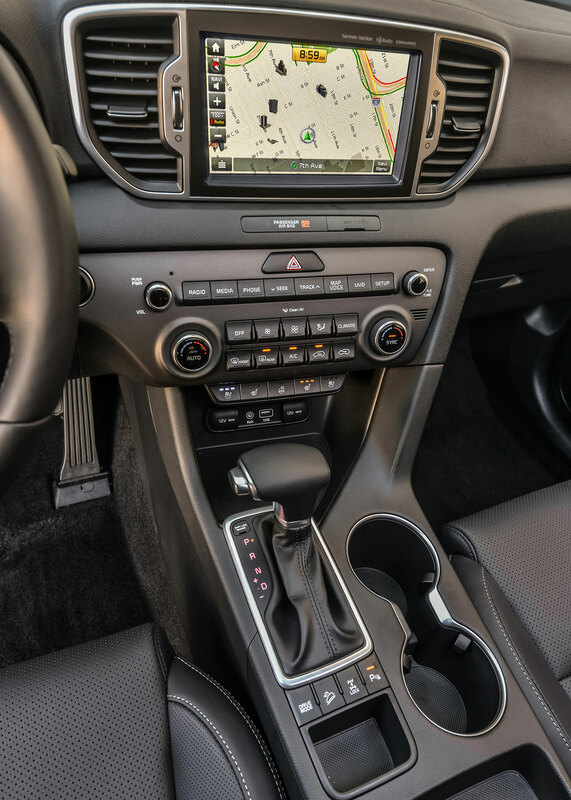 The steering effort is on the heavier side for this segment, reminding us of the Mazda CX-5, which is fun but not necessarily the best thing for urban driving. 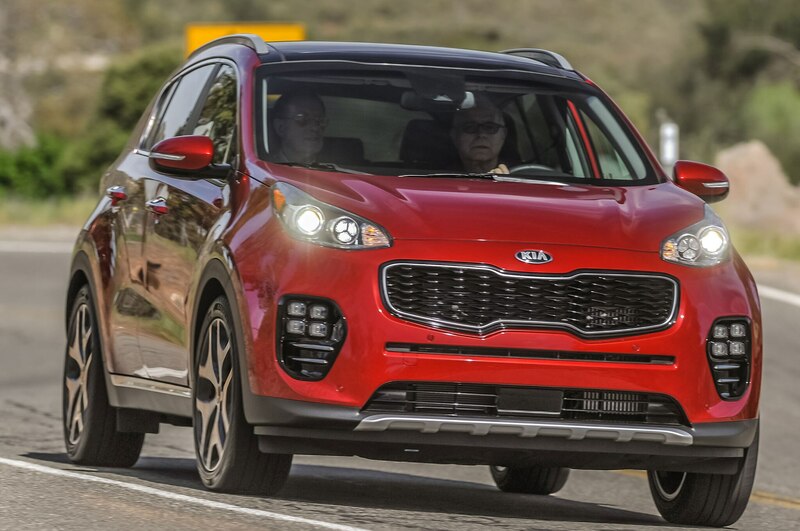 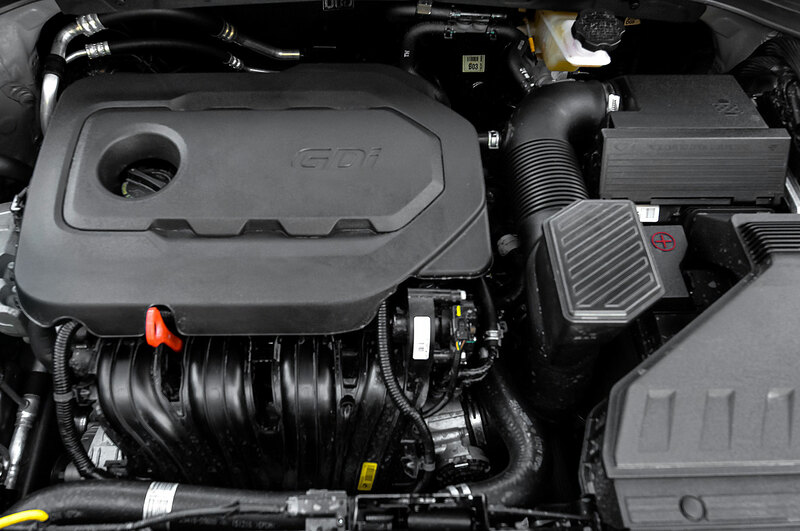 Compared to the engine in last year’s Sportage SX Turbo, the new 2.0-liter inline-four has been retuned for broader, earlier torque delivery at the expense of sacrificing 20 hp and 9 lb-ft of torque. 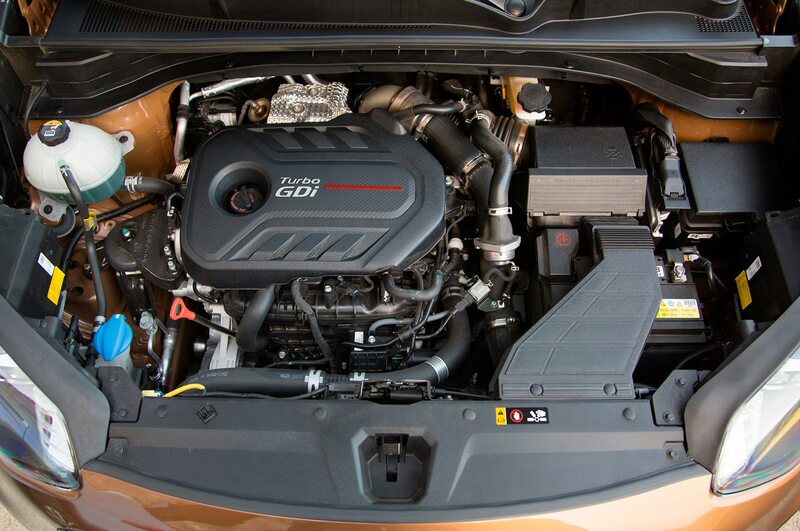 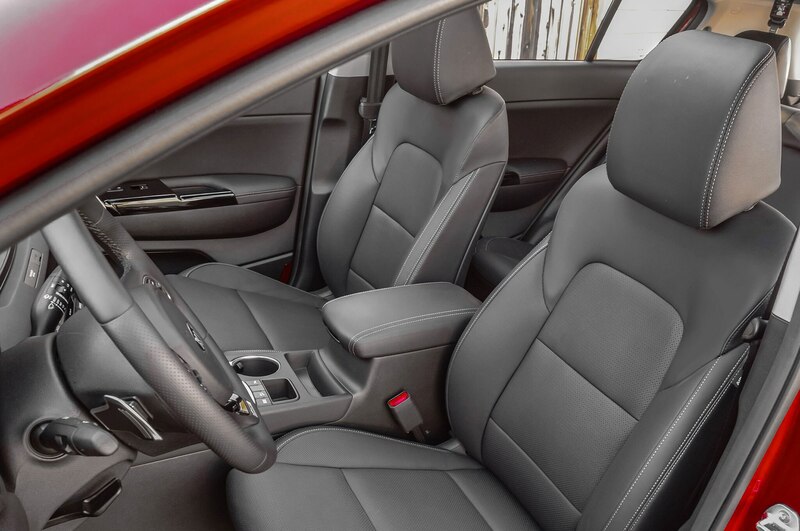 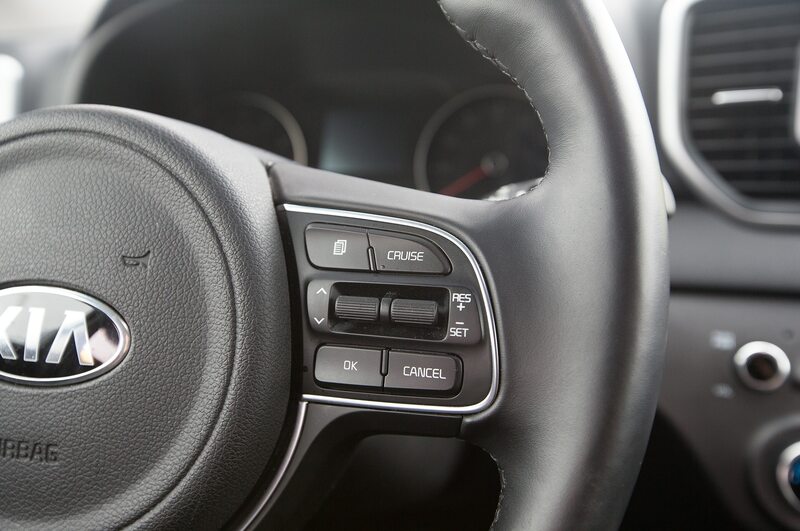 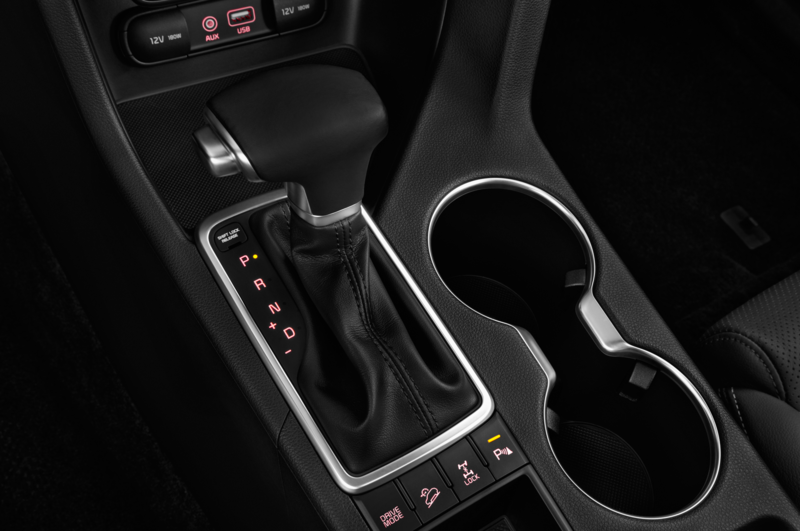 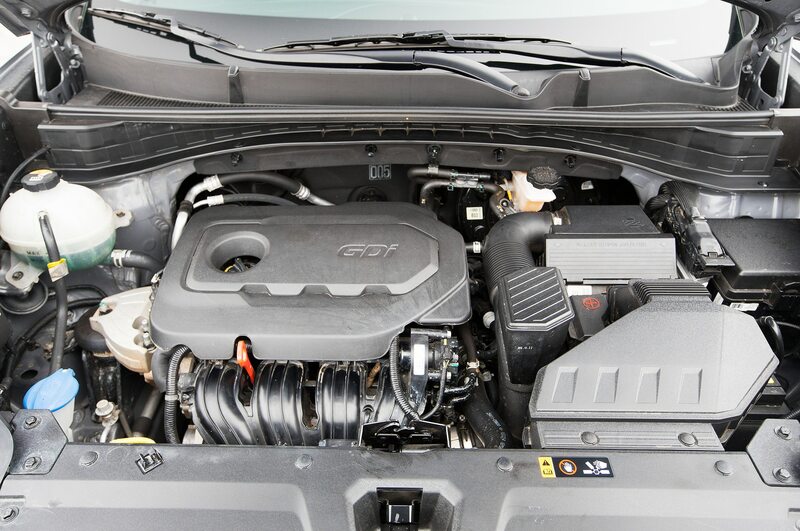 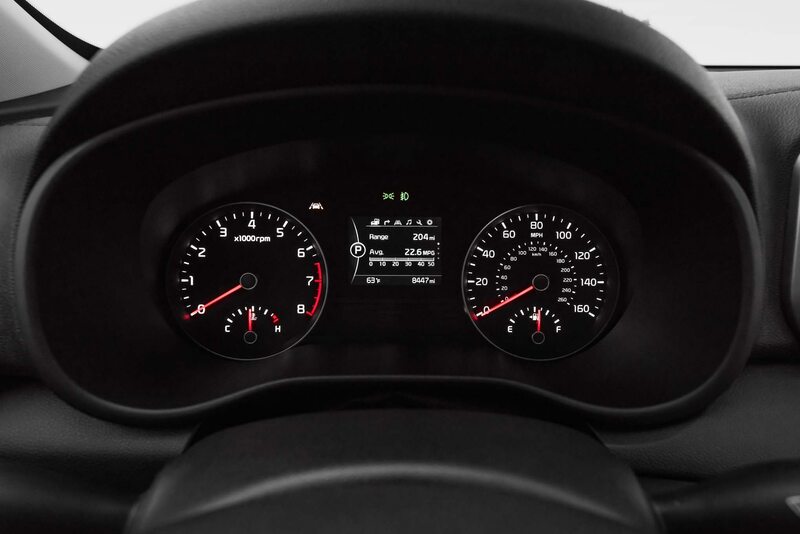 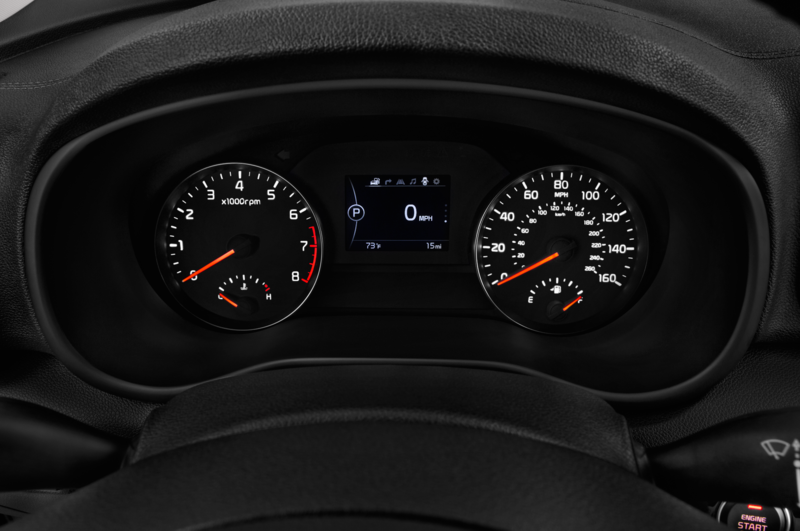 Quiet, smooth operation means you’ll rarely hear the engine in the cabin. 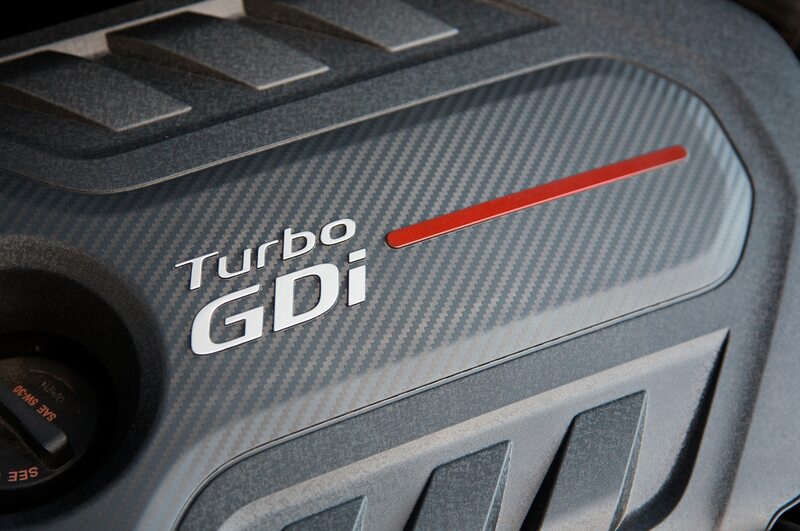 It pulls easily and deliberately through the automatic transmission’s six forward gears, but considering the power rating, we were expecting a bit more punch from a 240-hp turbo. 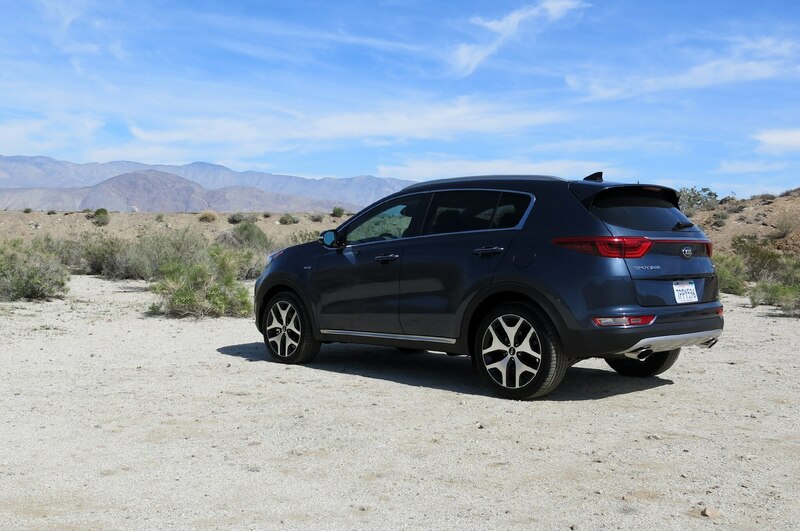 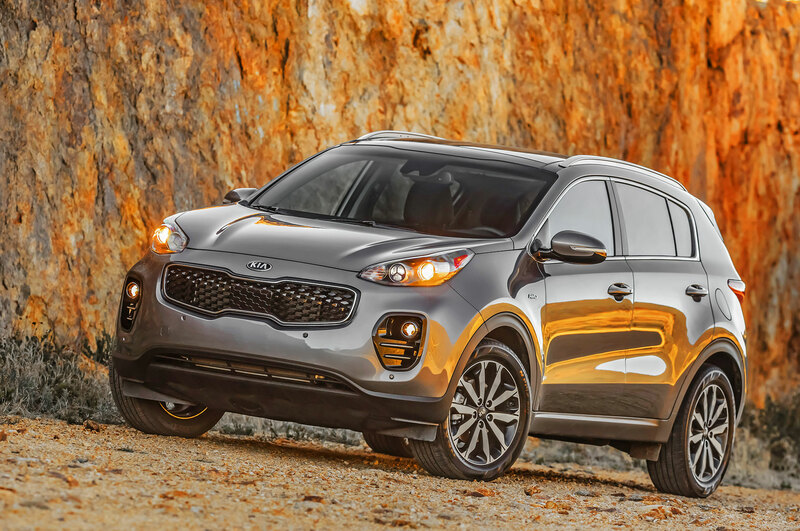 Efficiency gripes aside, the 2017 Kia Sportage comports itself with the same maturity and sensibility as the best modern crossovers. 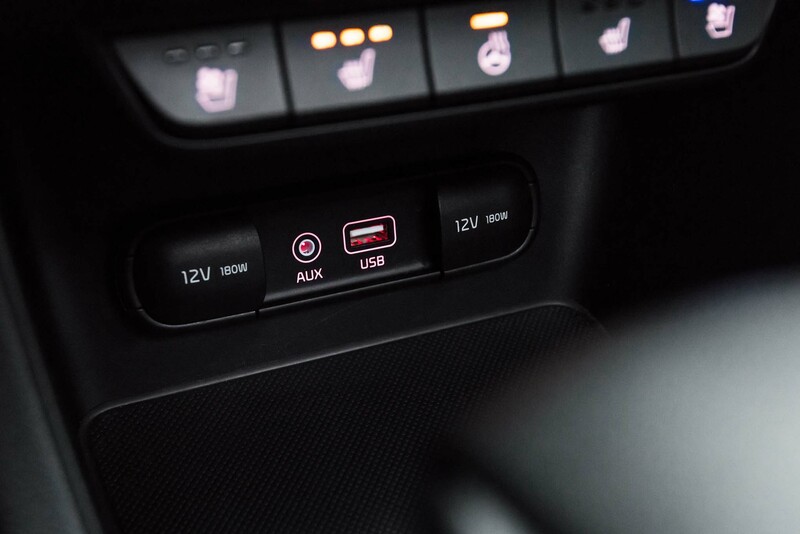 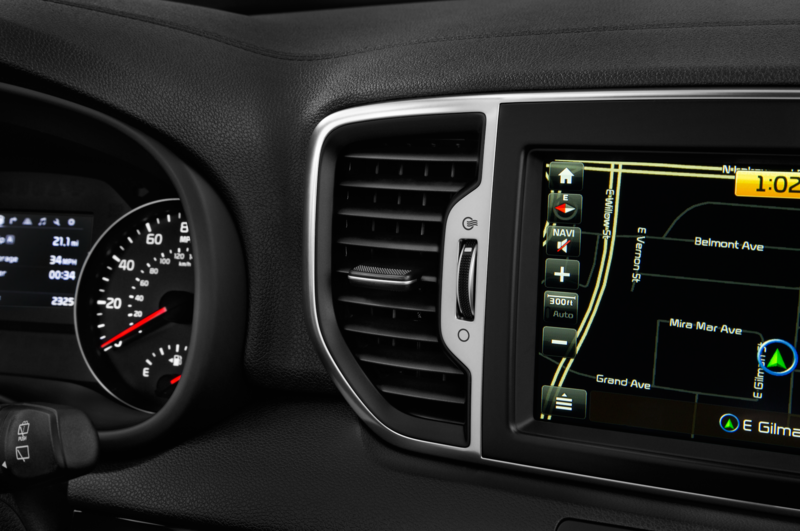 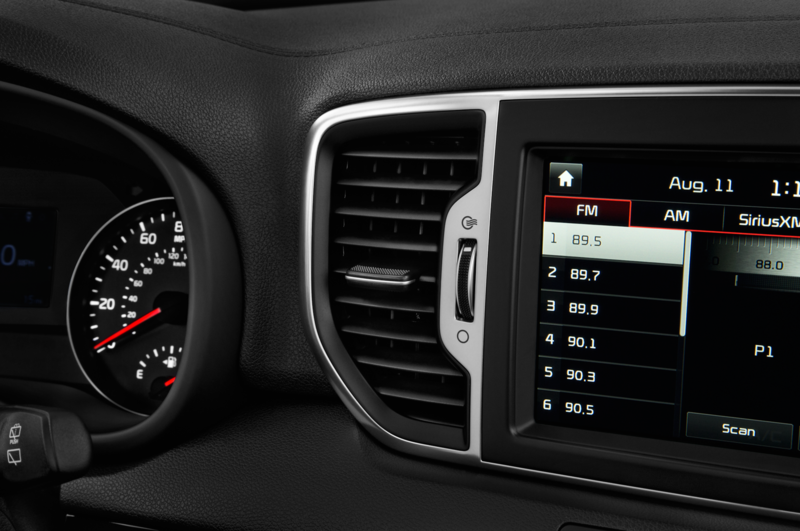 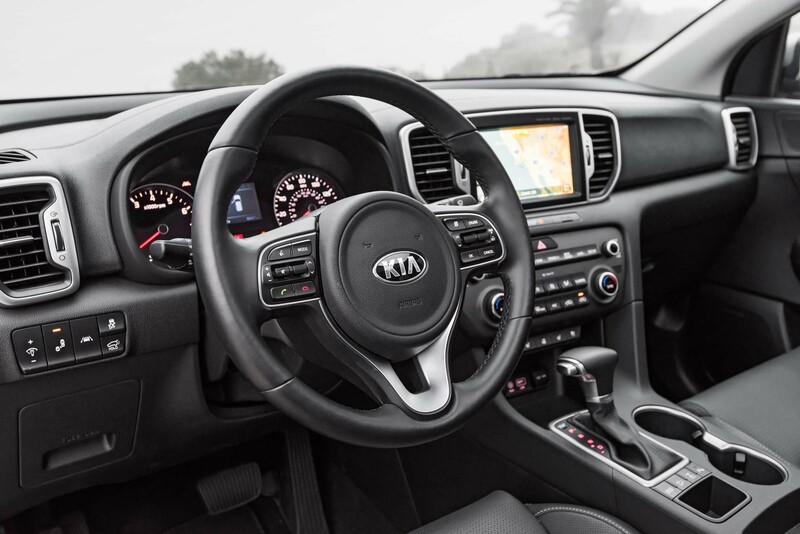 The handsome interior has supremely legible gauges, a responsive touchscreen infotainment system, and physical buttons that click home with a satisfying quality. 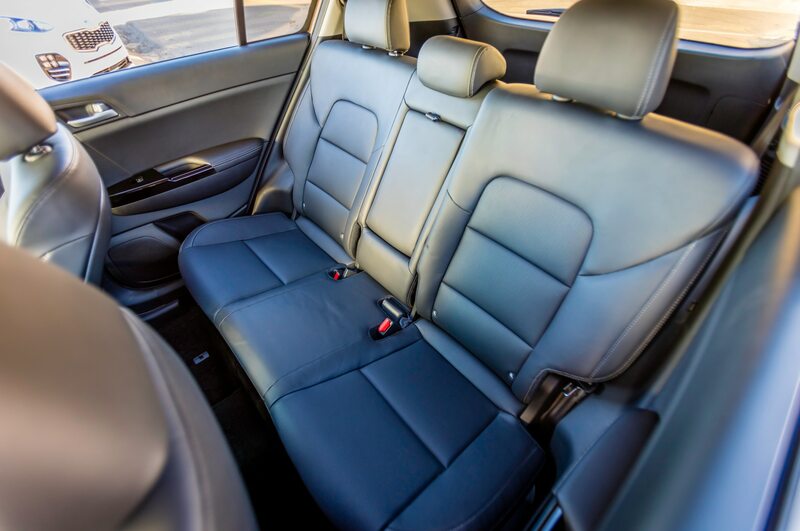 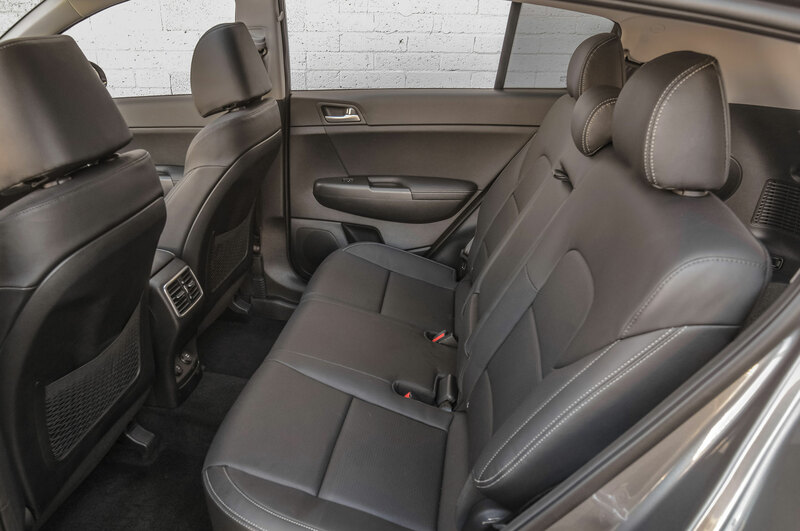 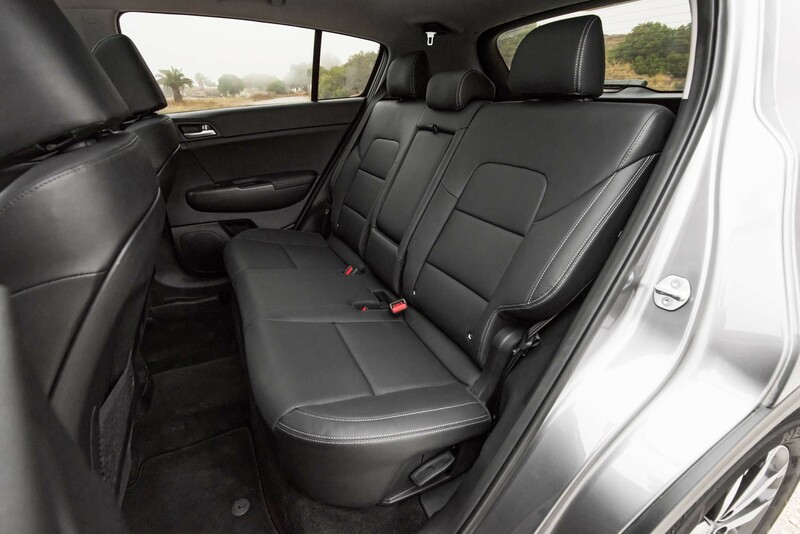 The back seats recline at several angles and fold down easily, though there is no handle to fold them from the cargo area. The trunk floor even has two heights so owners can pick between a totally flat surface or gaining a few inches of extra height. 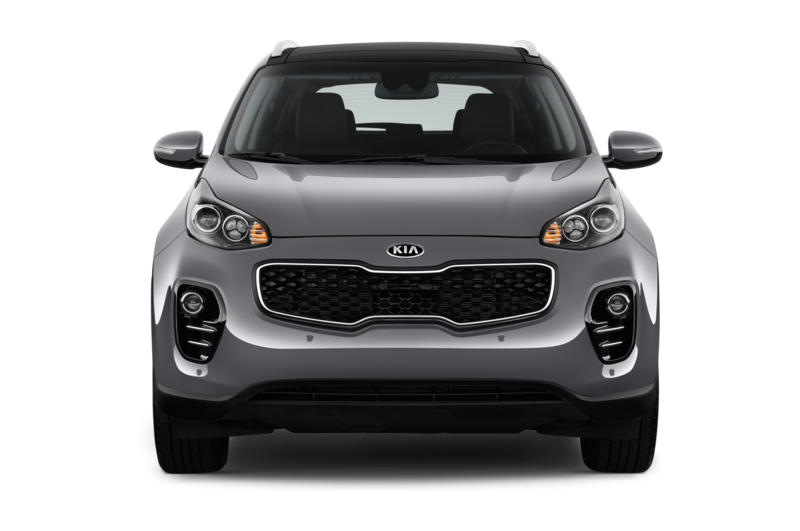 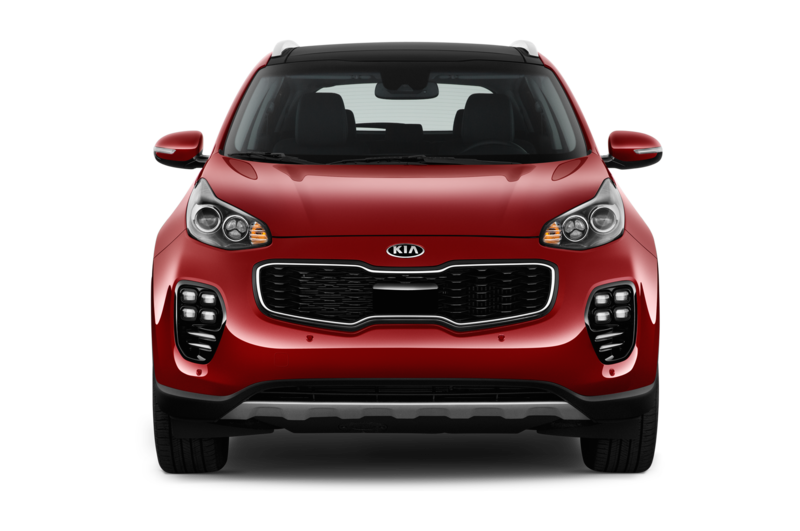 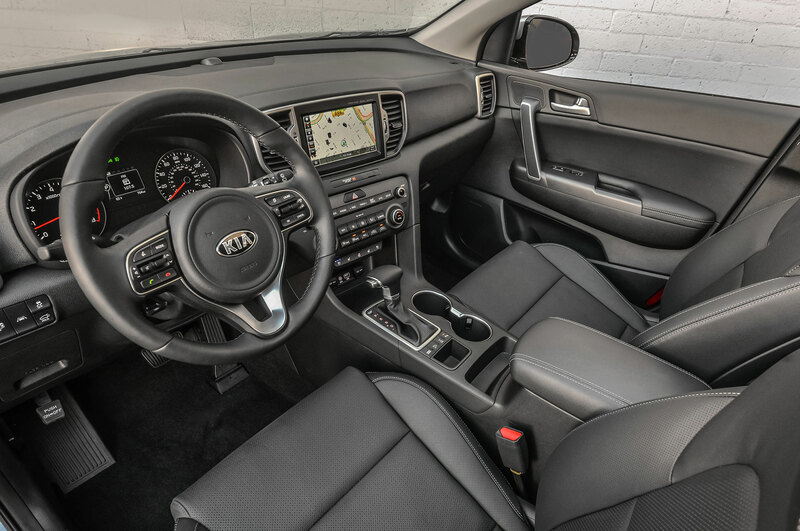 Kia used more soft-touch materials in the 2017 Sportage than its predecessor, and the dash and center stack follow the stylish (if not particularly daring) triangles-and-polygons look of other new Kia models like the Optima. 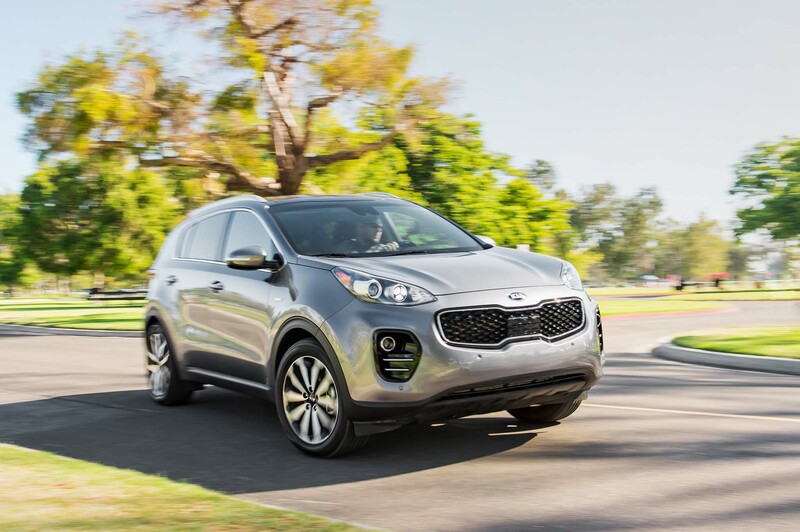 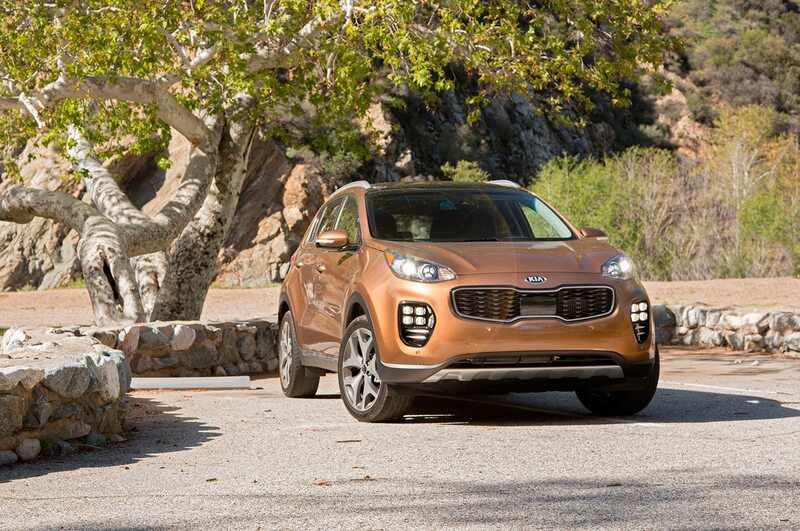 Above all, the Sportage is an easy place to spend time. 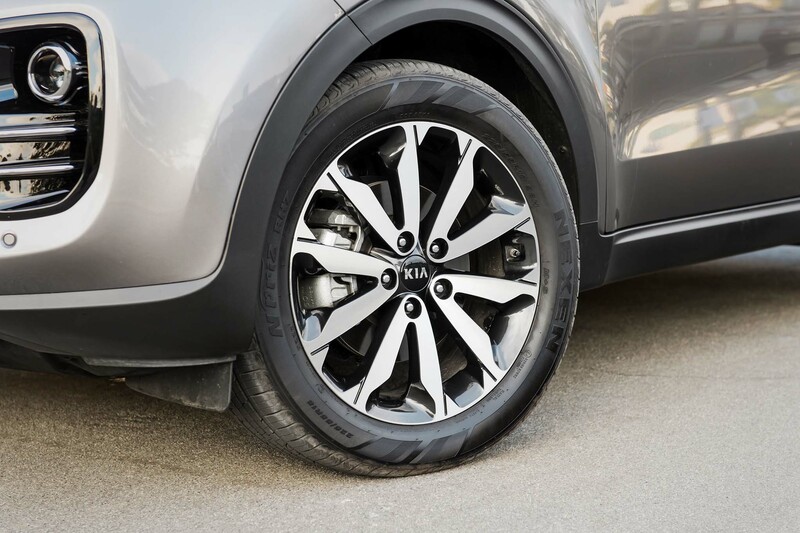 Improved acoustic insulation keeps wind and road noise to a minimum, while the suspension dispatches with bumps and potholes before they are felt or heard by passengers, even when you find 19-inch wheels and low-profile tires under the fenders, as with our SX tester. 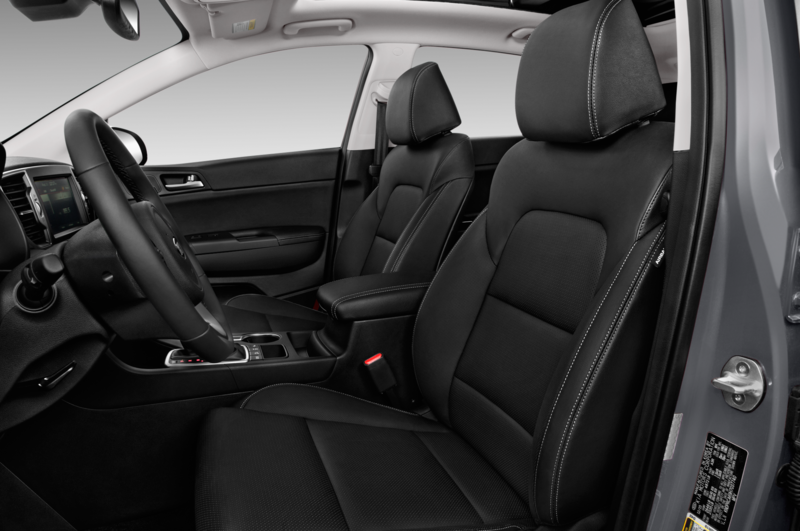 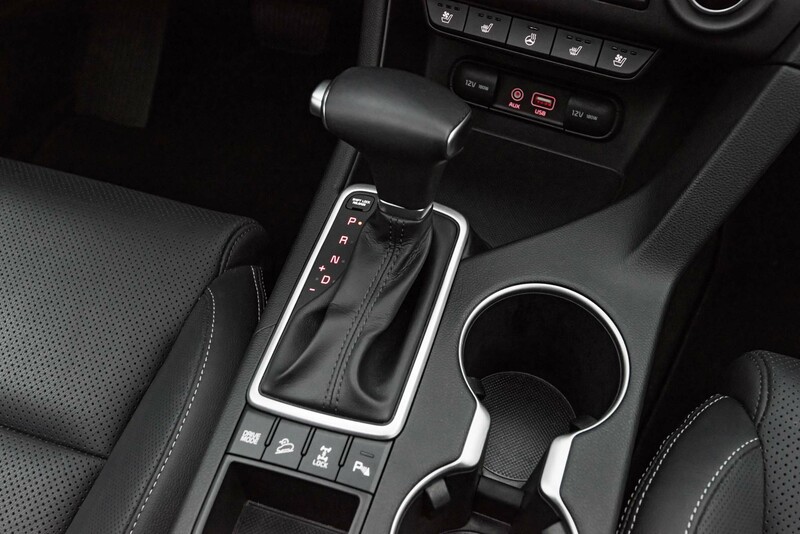 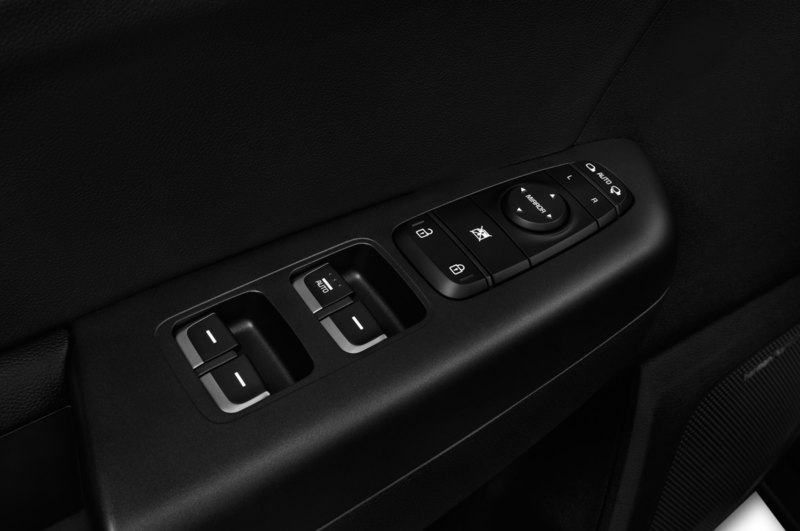 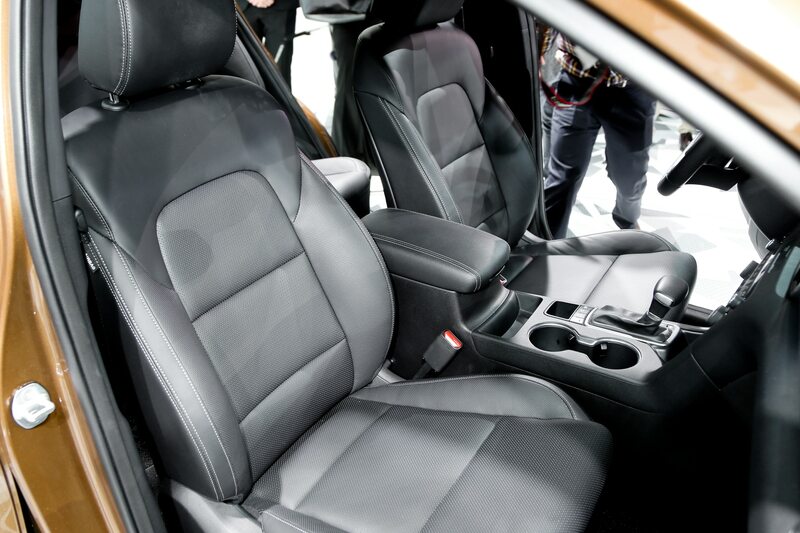 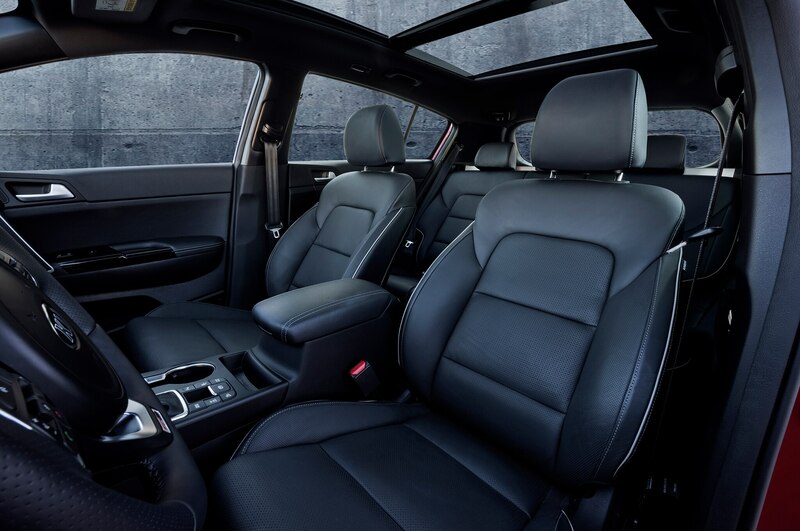 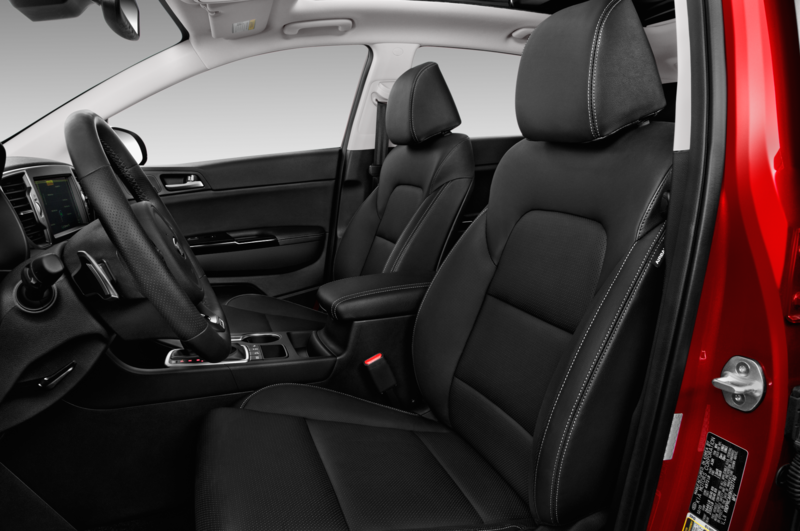 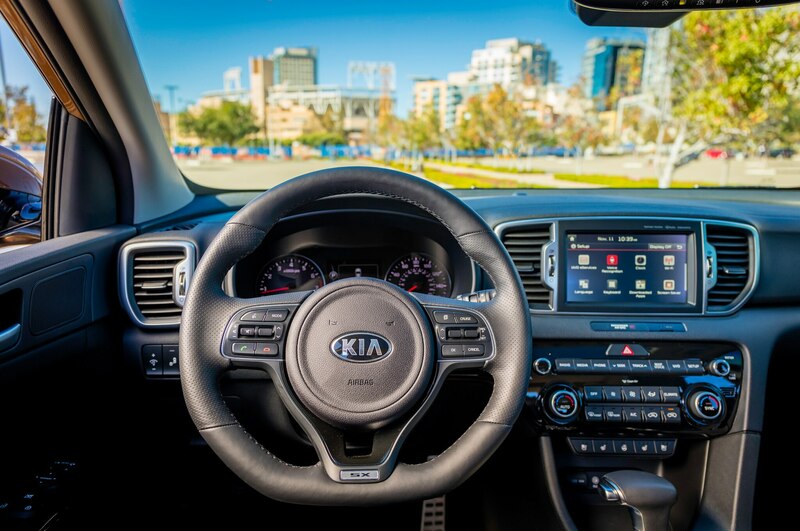 A natural driving position and supportive seats make it easy to get comfortable in seconds, and every control is positioned in a logical and easy-to-reach place. 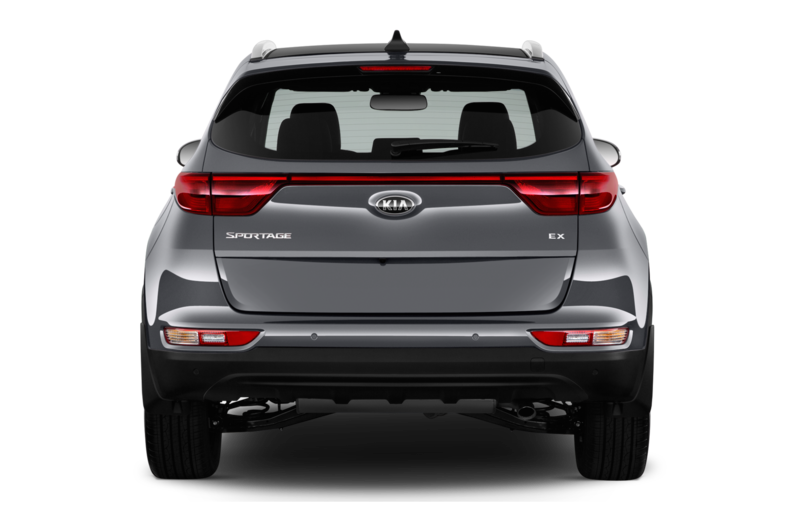 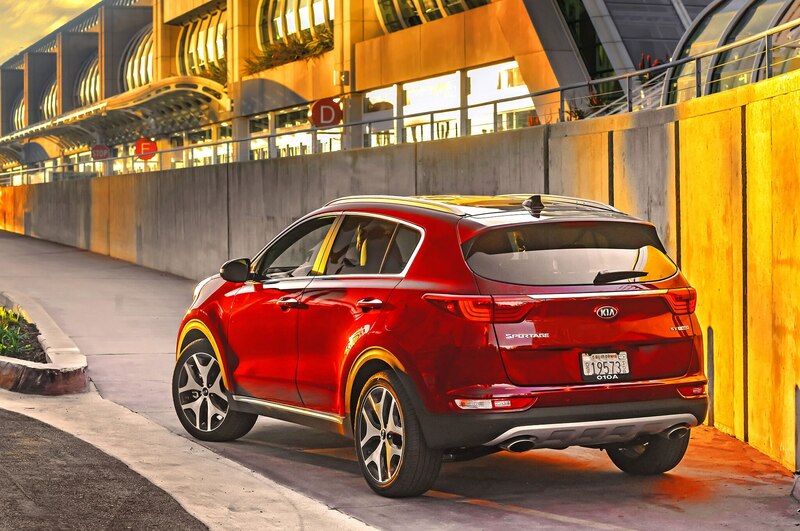 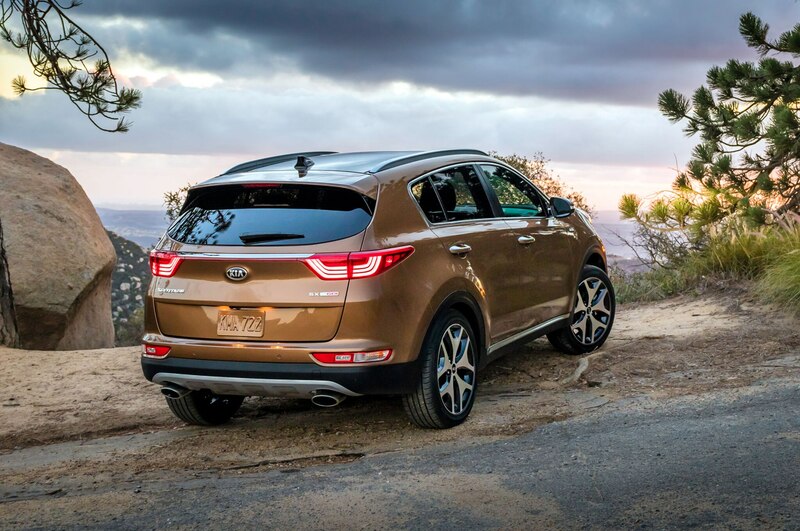 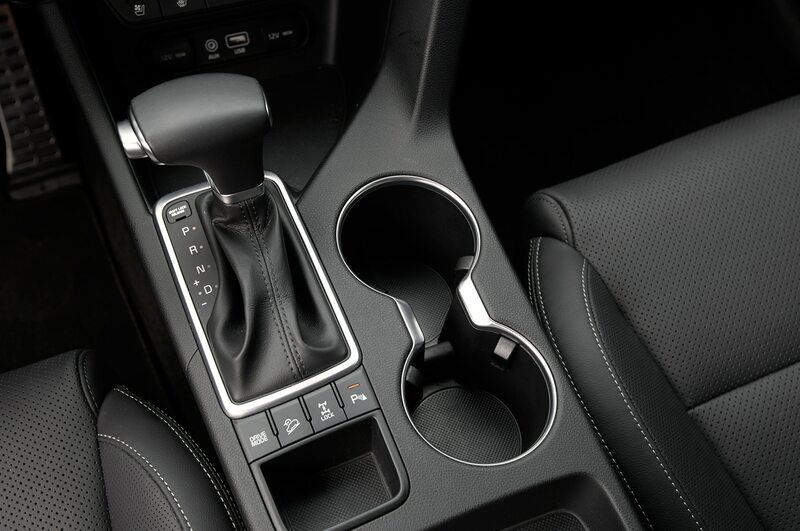 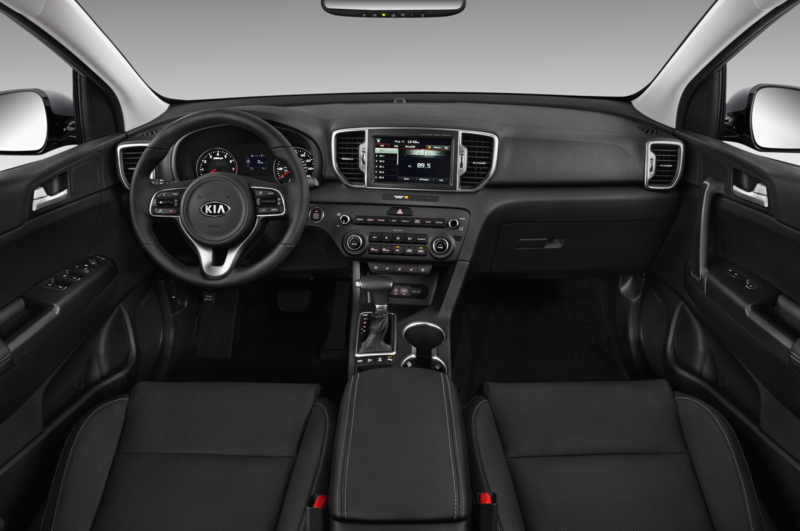 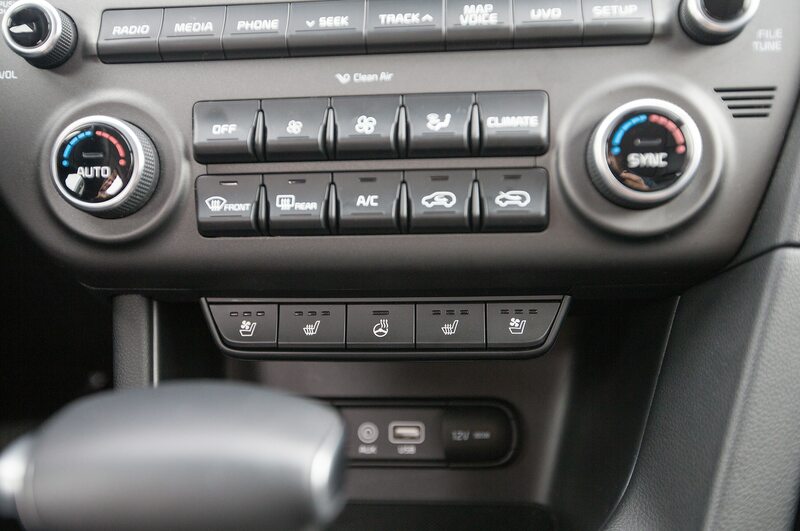 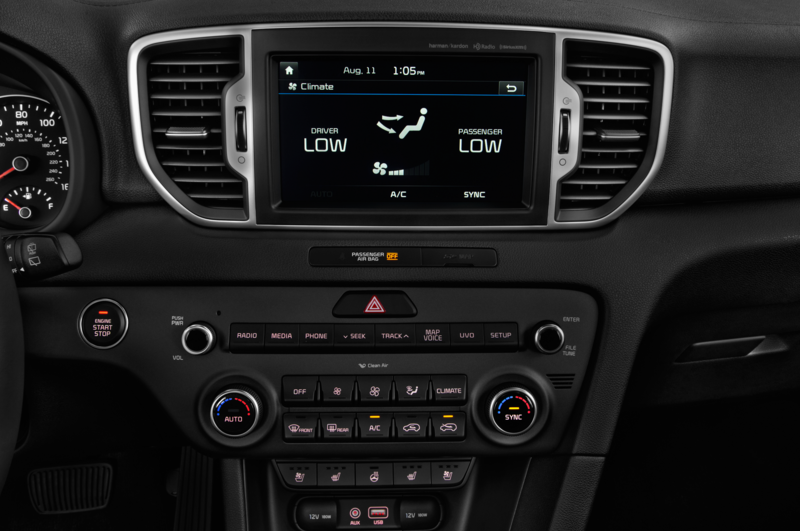 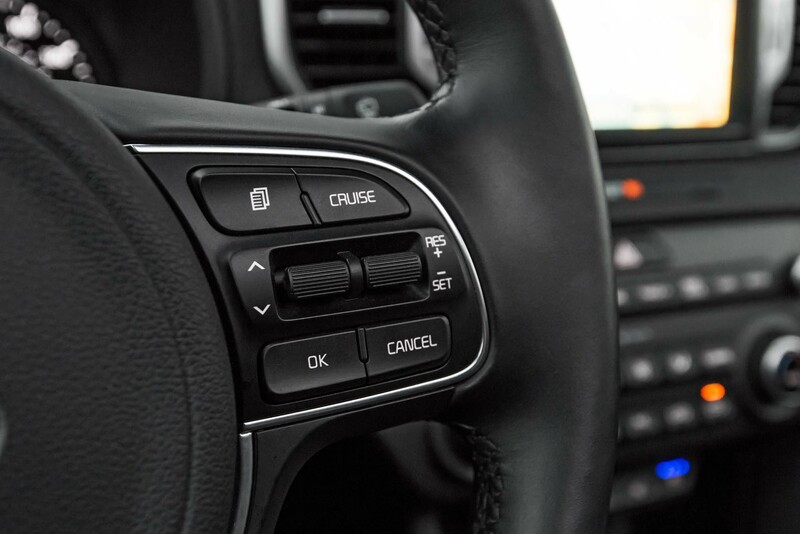 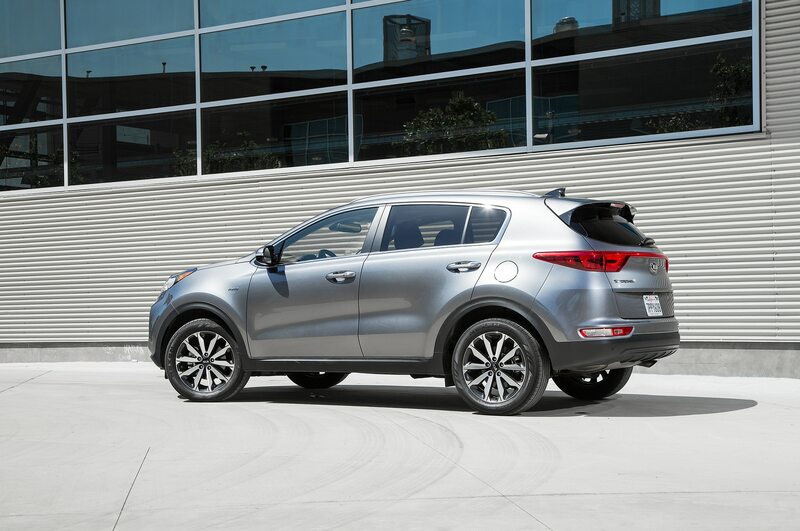 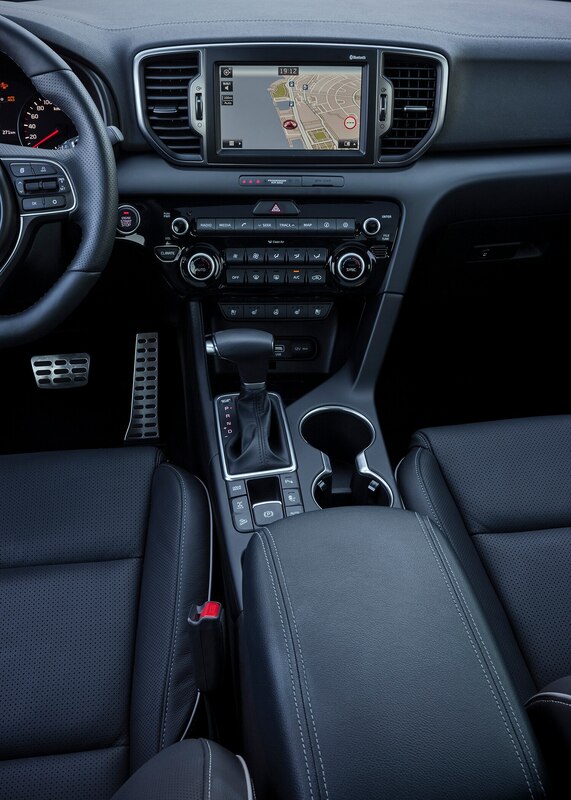 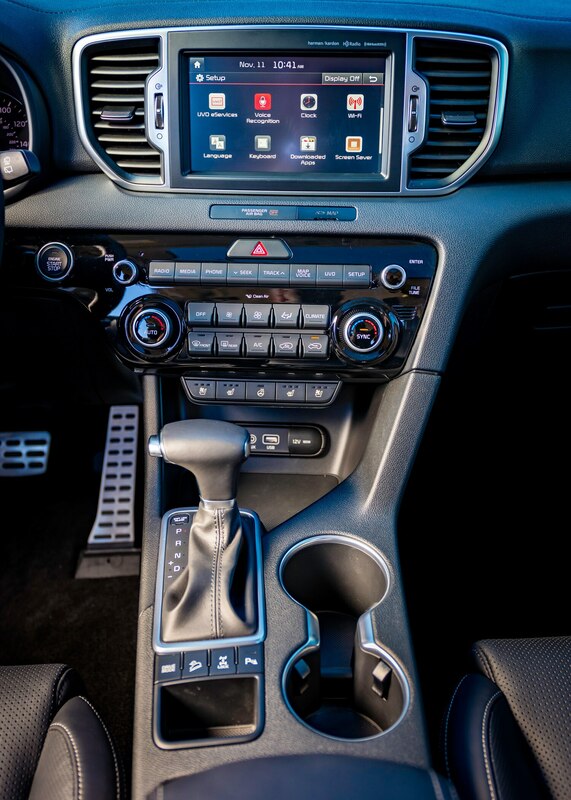 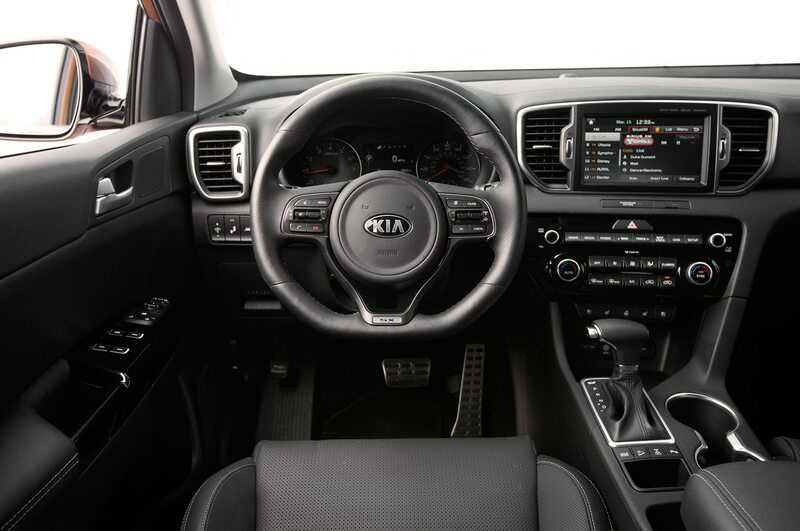 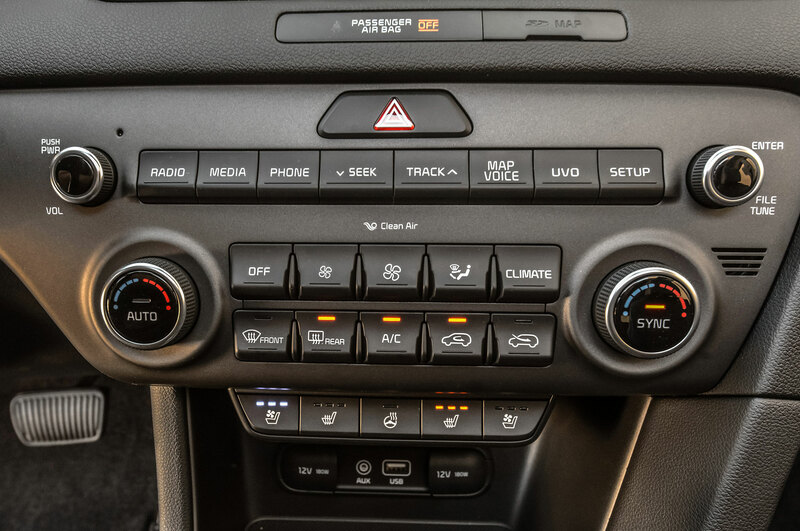 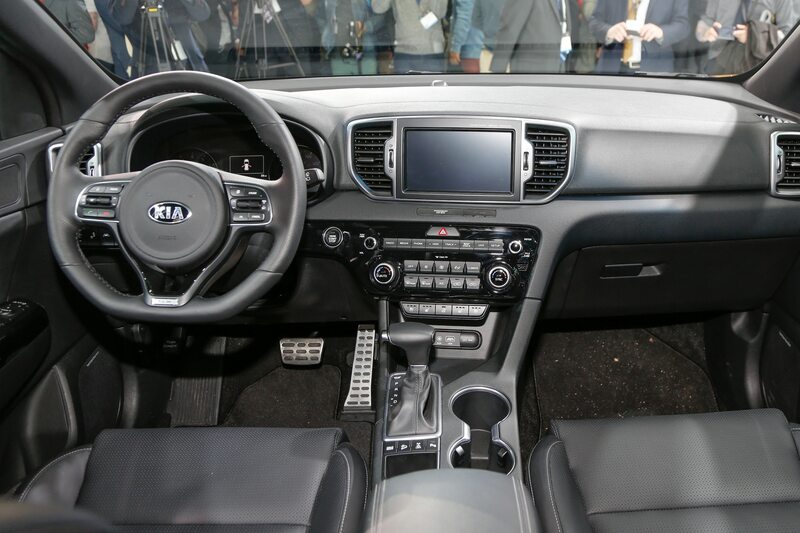 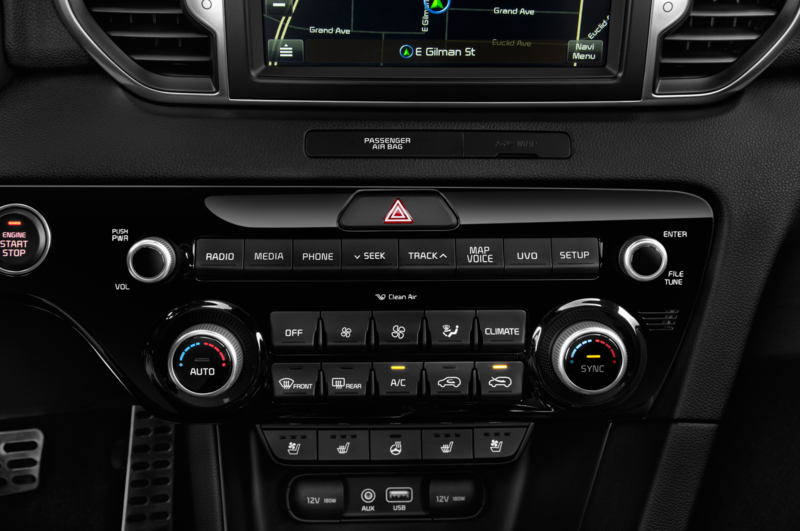 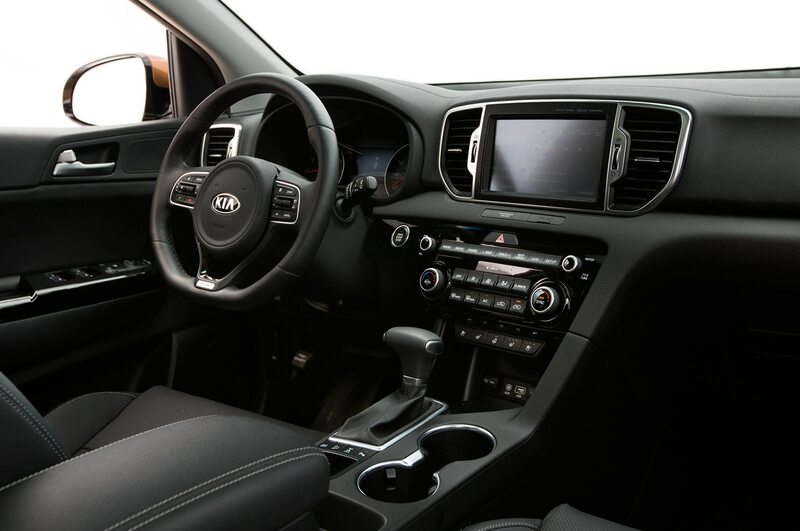 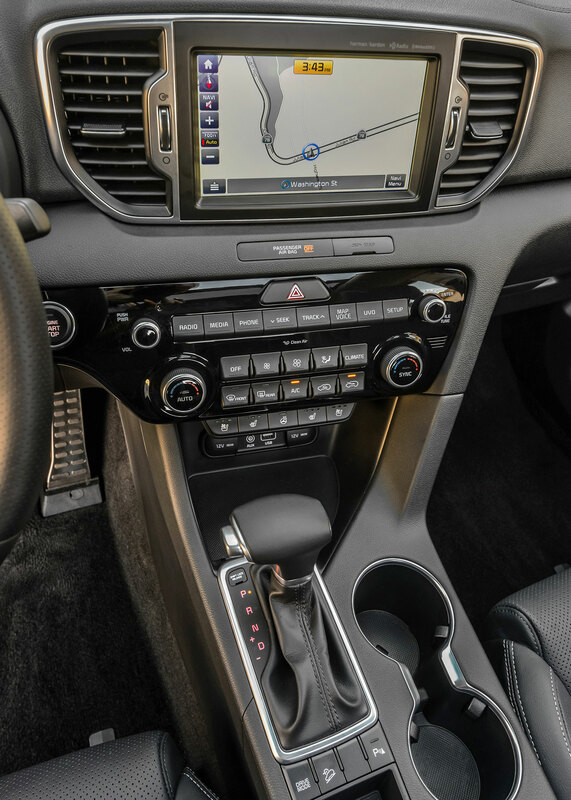 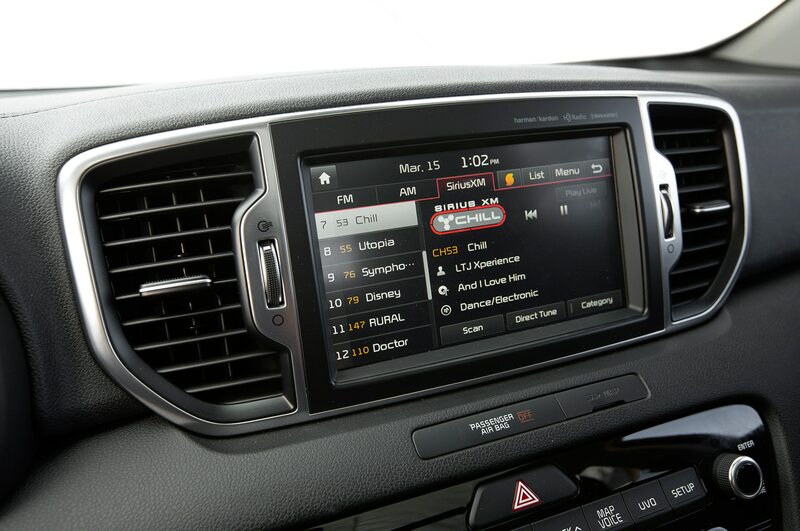 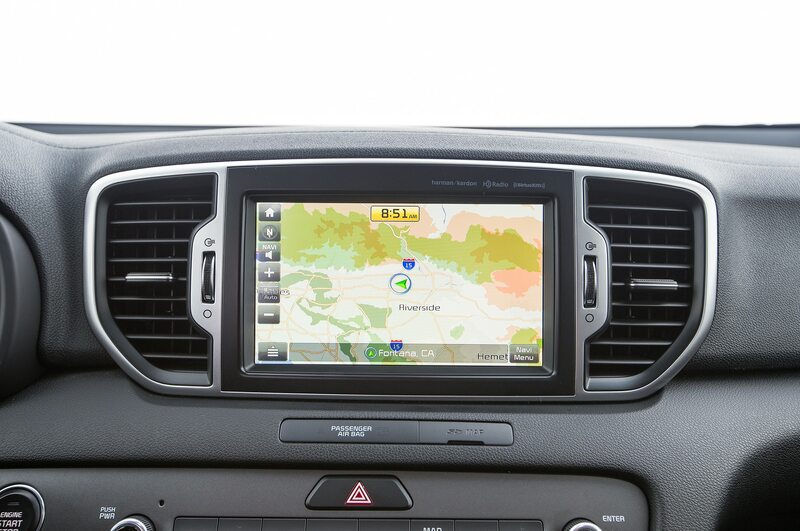 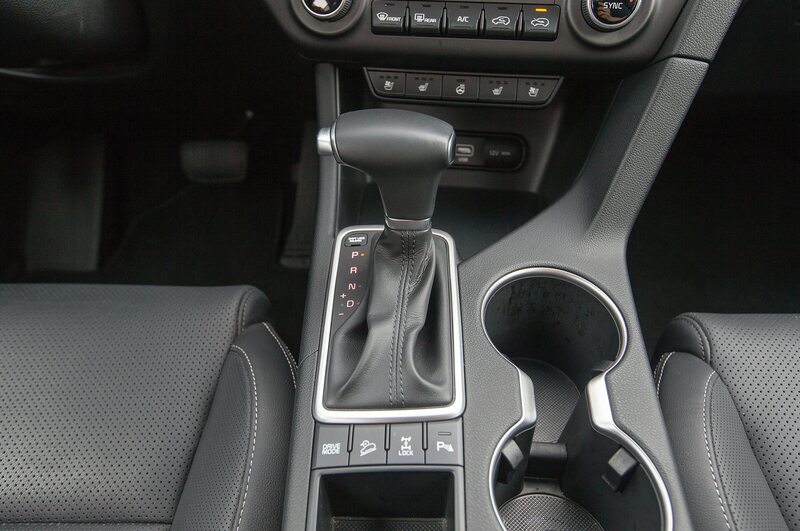 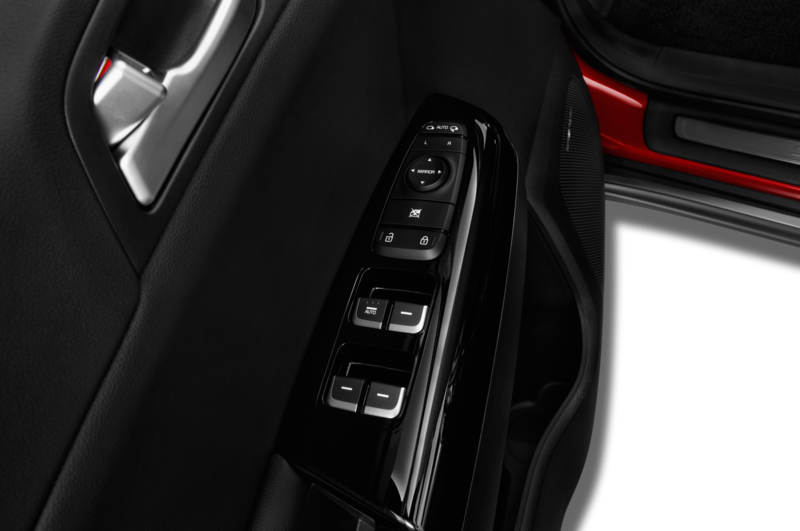 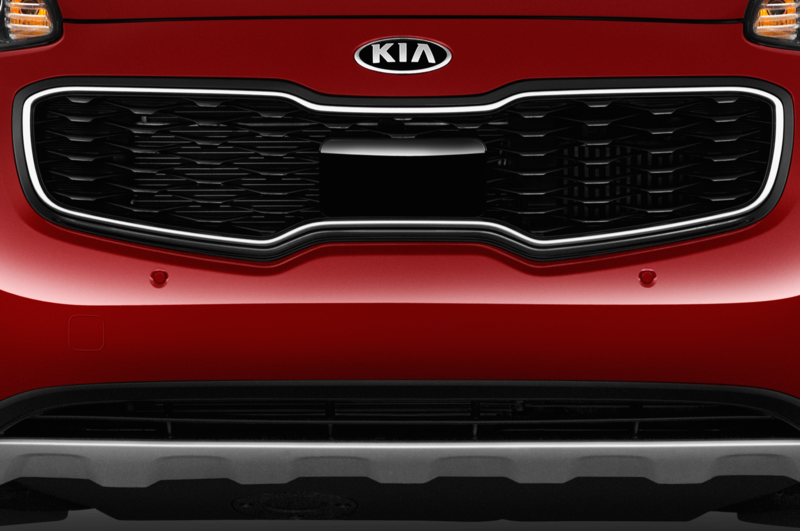 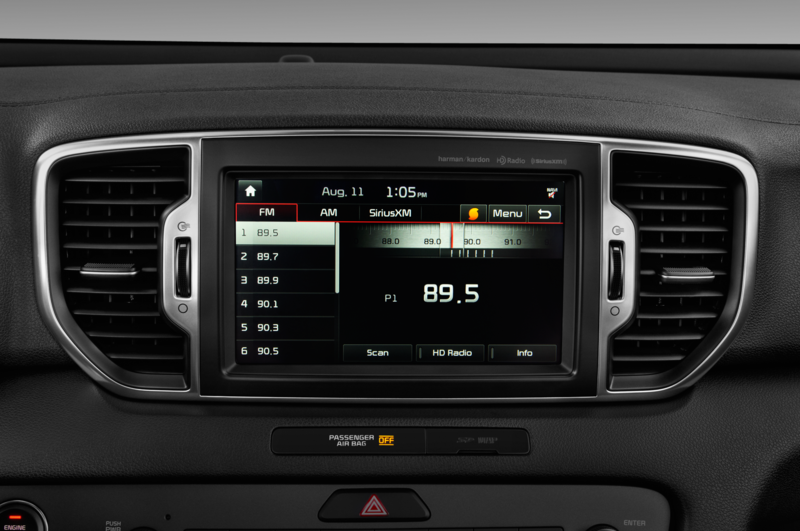 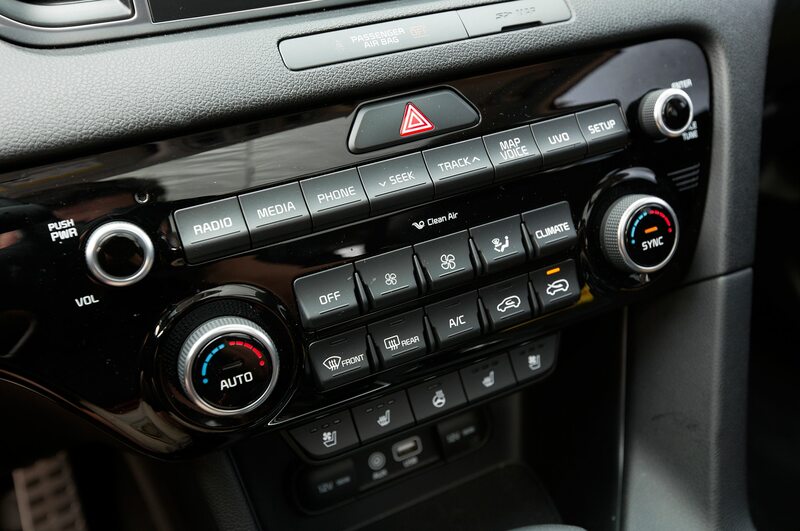 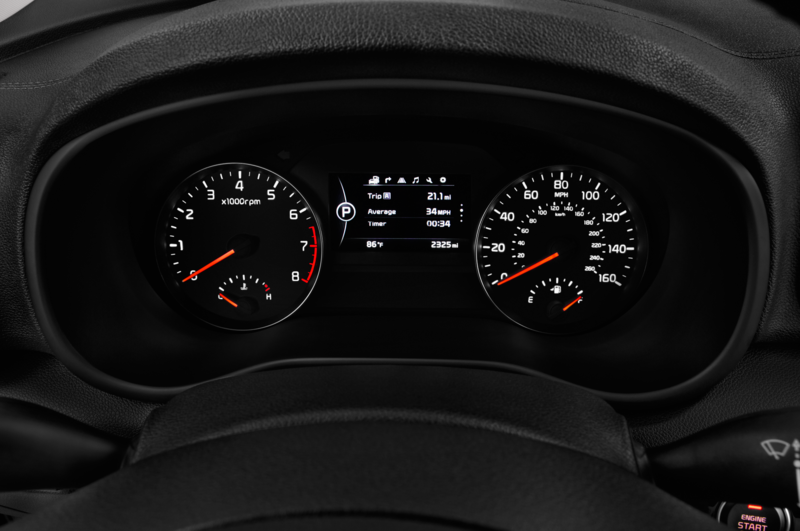 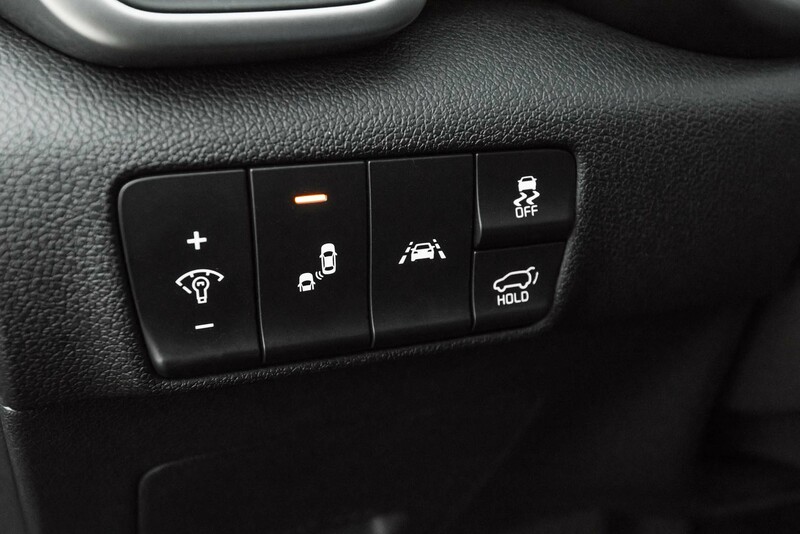 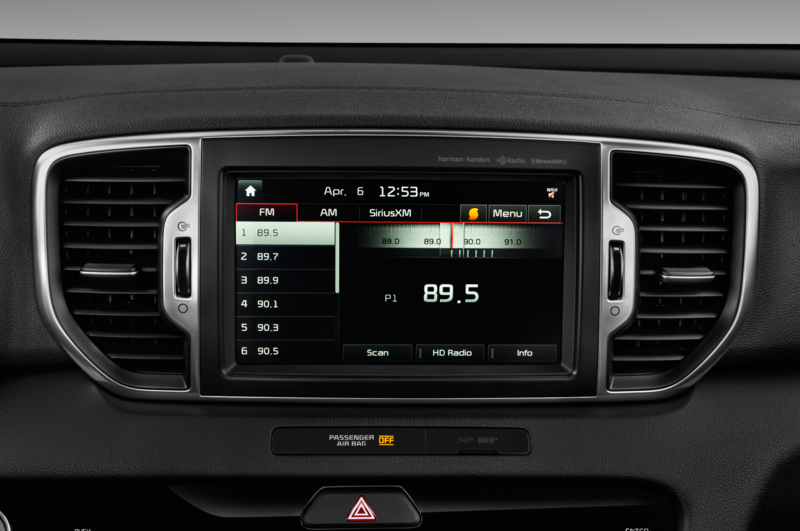 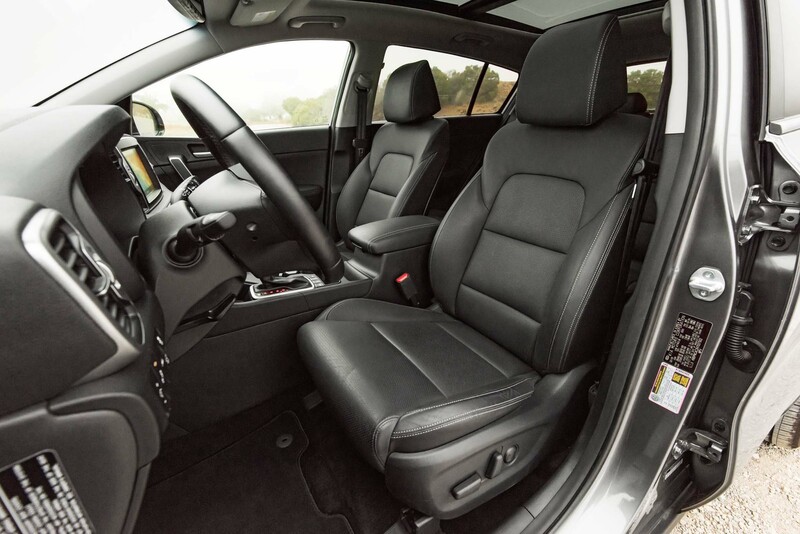 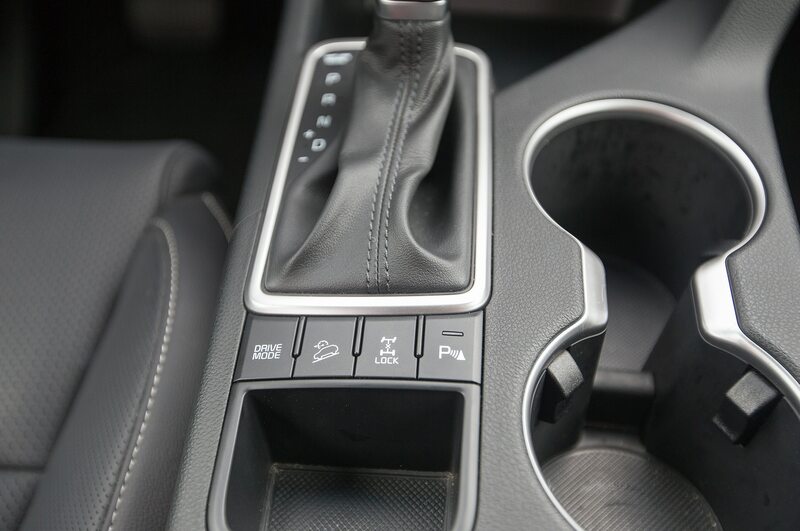 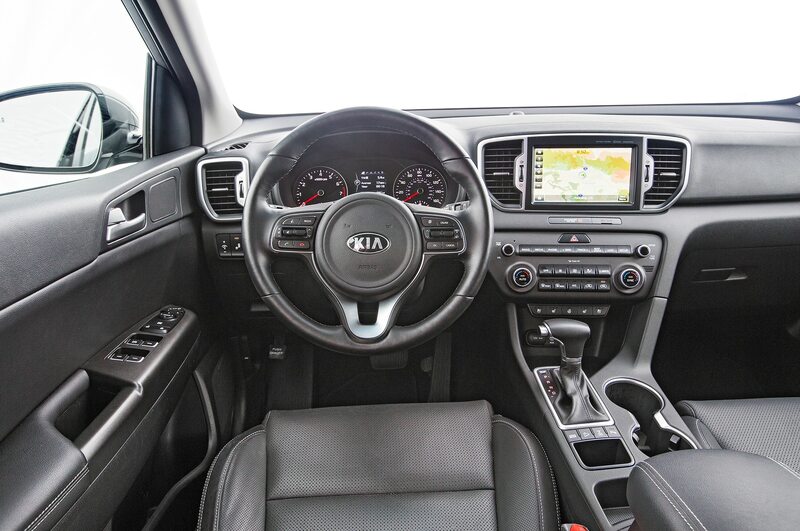 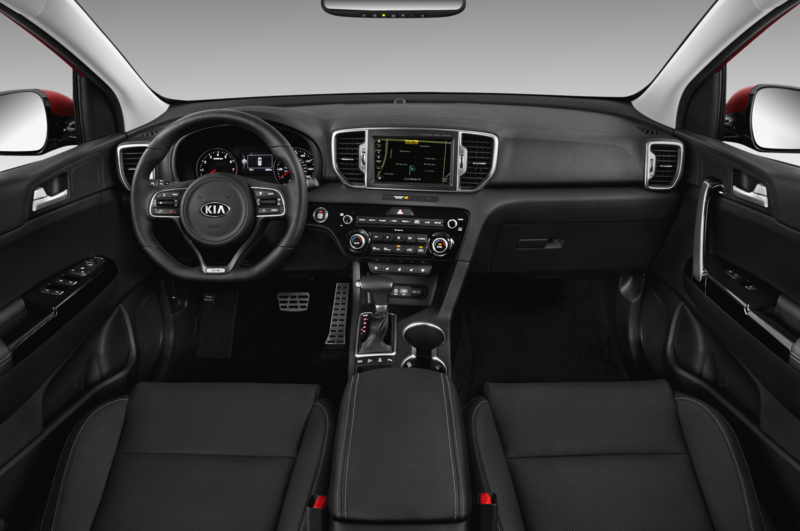 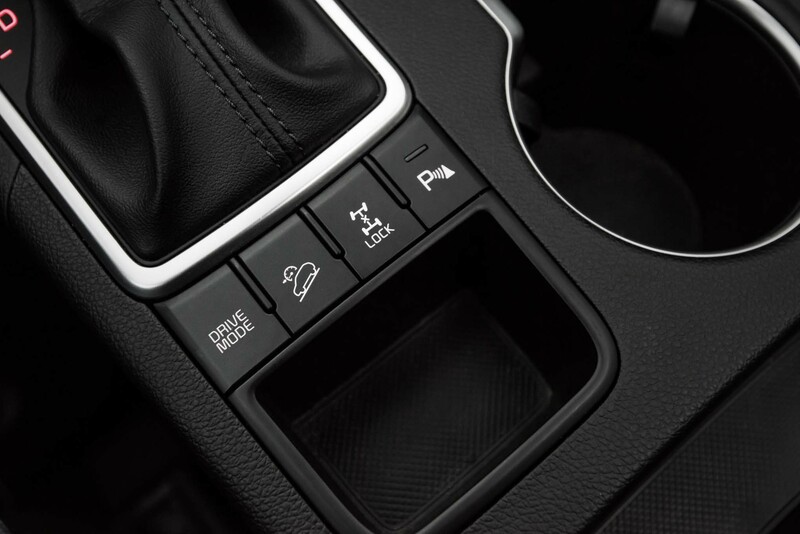 Optional features include a panoramic sunroof, automatic emergency braking that works at up to 49 mph, Apple CarPlay/Android Auto, LED fog- and taillights, heated and cooled seats, a heated steering wheel, lane-keeping assist, blind-spot monitoring, and Kia’s handy power-operated liftgate. 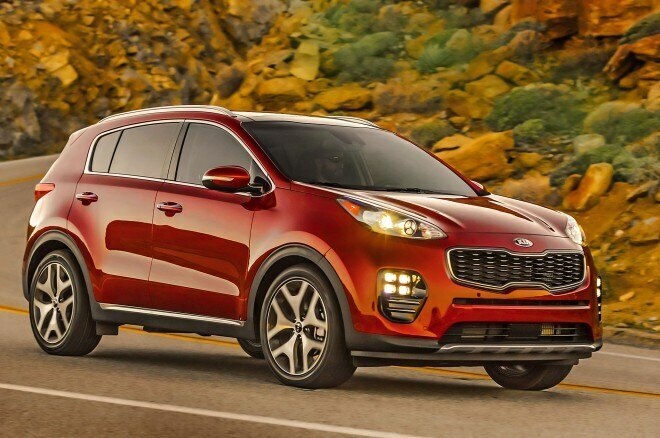 In other words, the 2017 Sportage has pretty much all the gadgets we look for in modern cars. 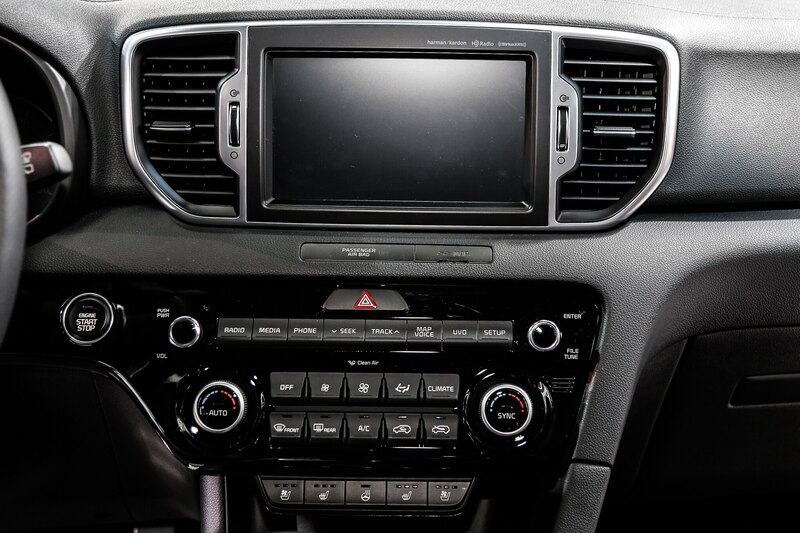 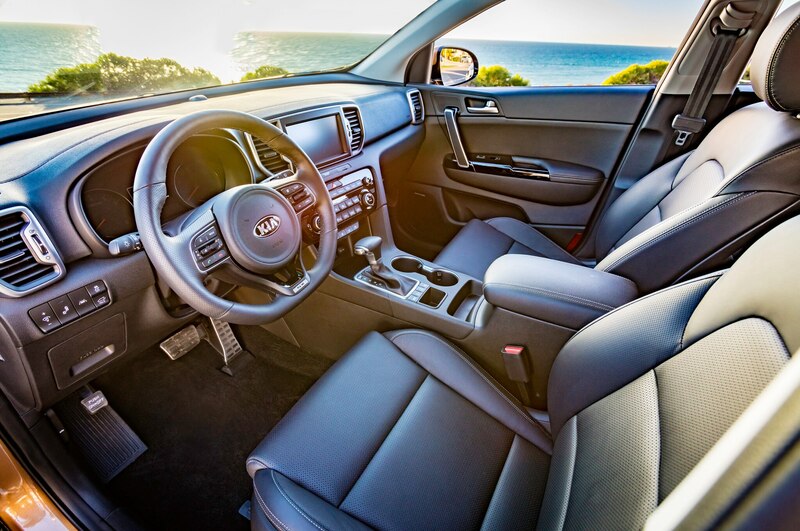 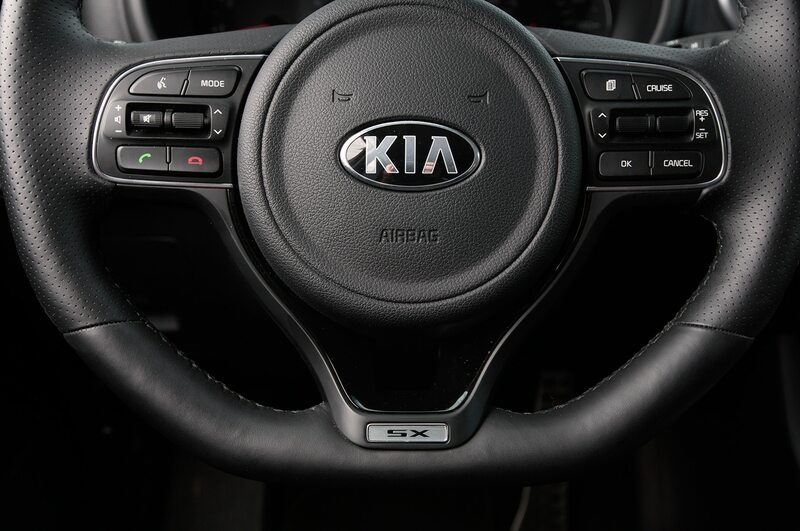 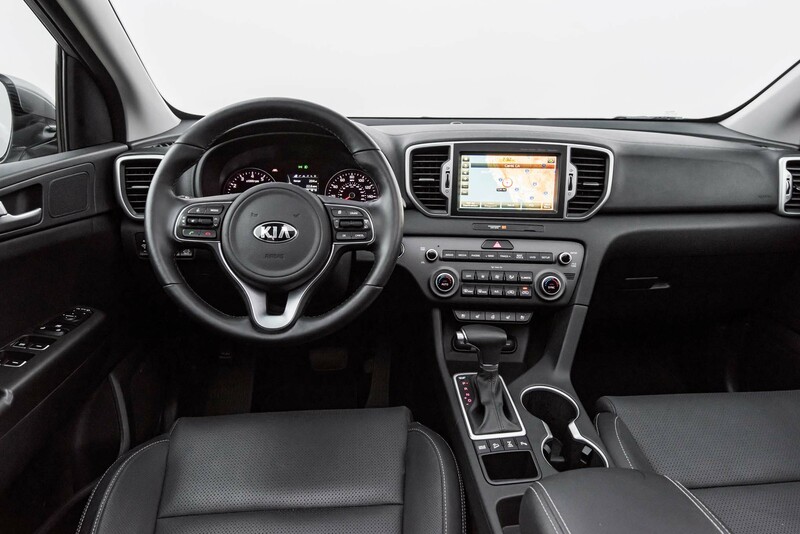 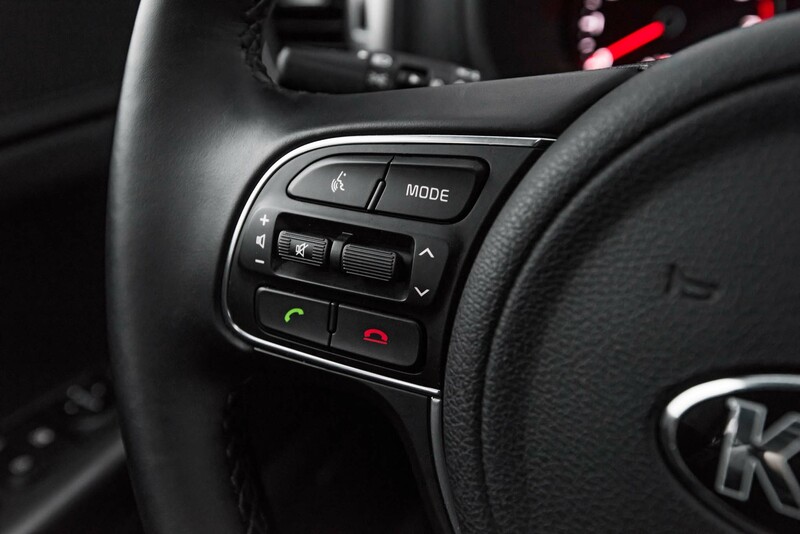 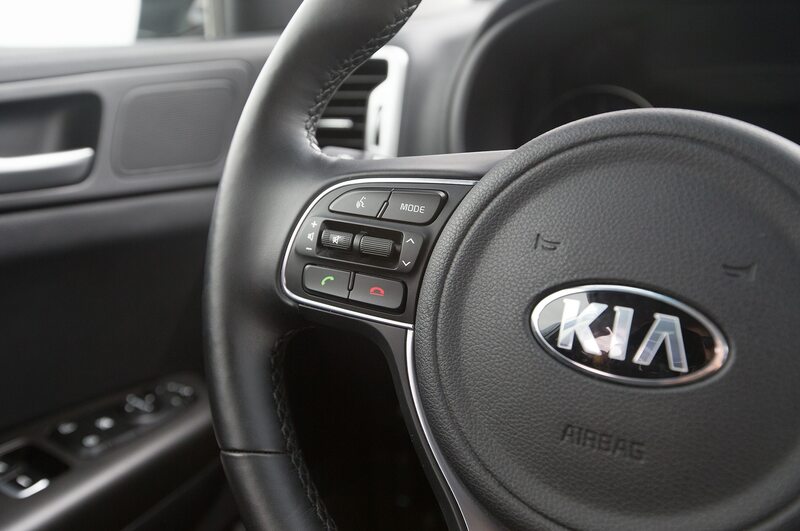 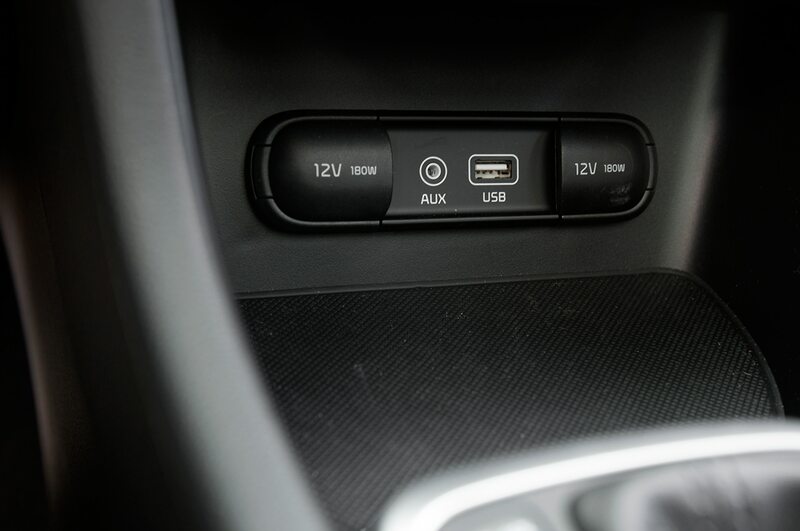 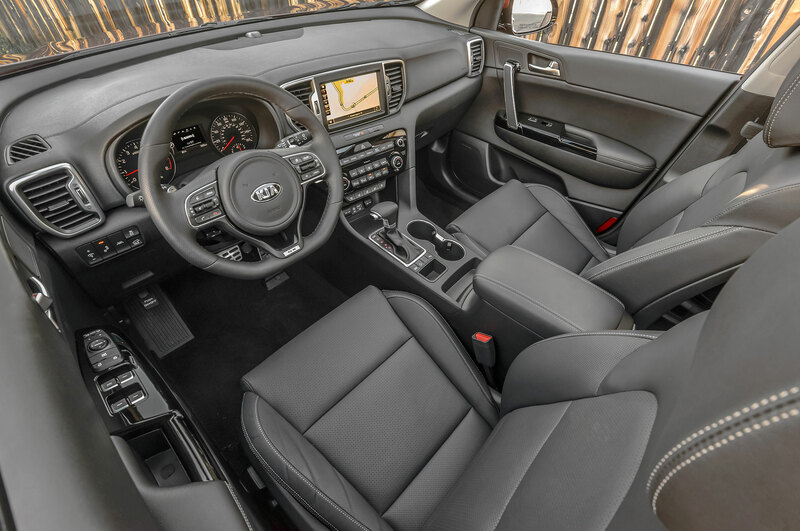 Best of all, Kia notes that its aggressive pricing strategy means several appealing options — heated seats, leather upholstery, Apple CarPlay/Android Auto — can be had for several thousands of dollars less than on rival crossovers. 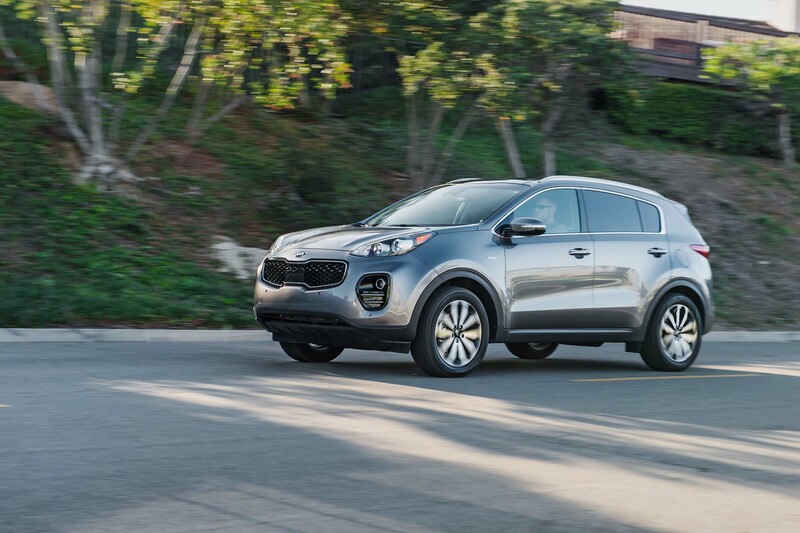 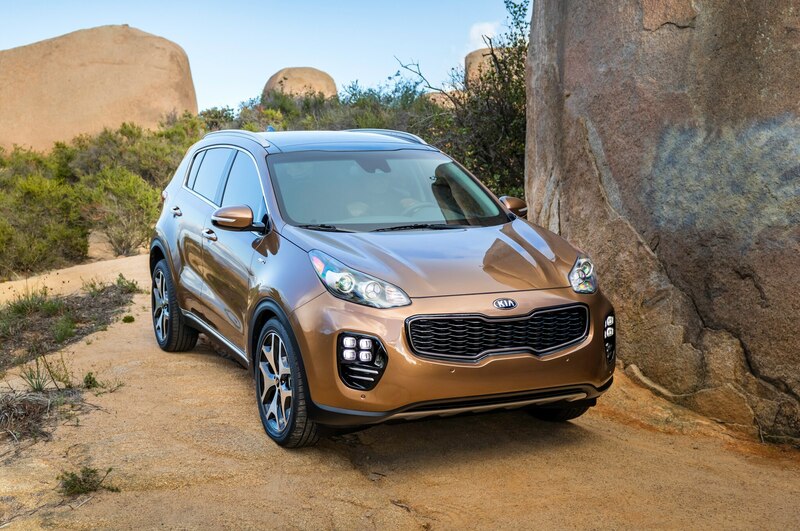 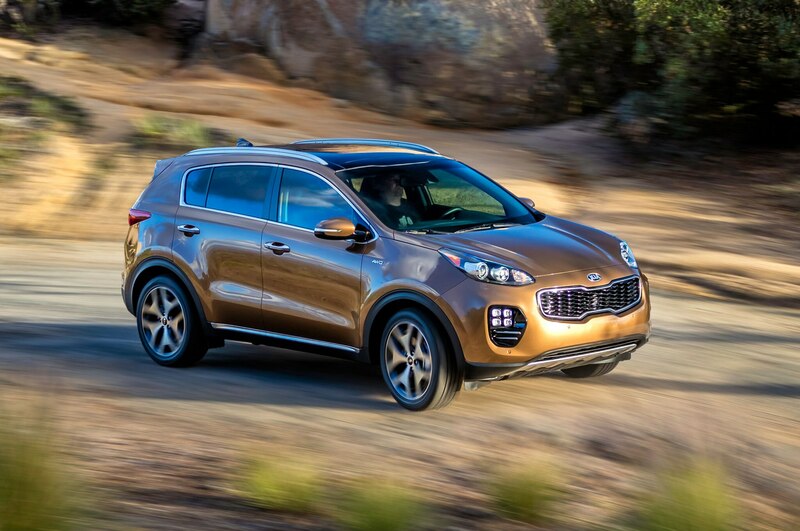 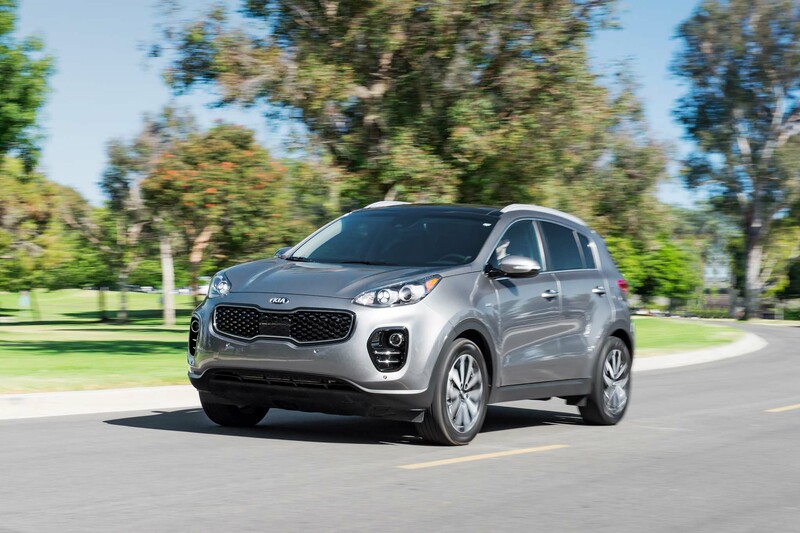 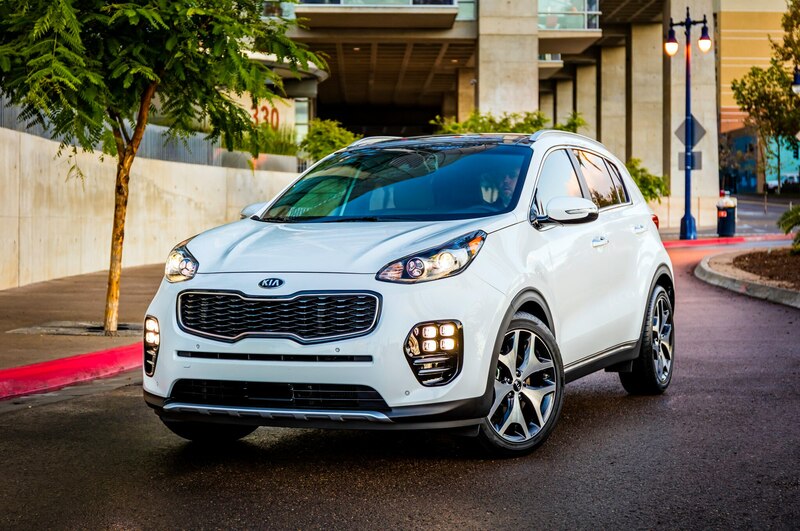 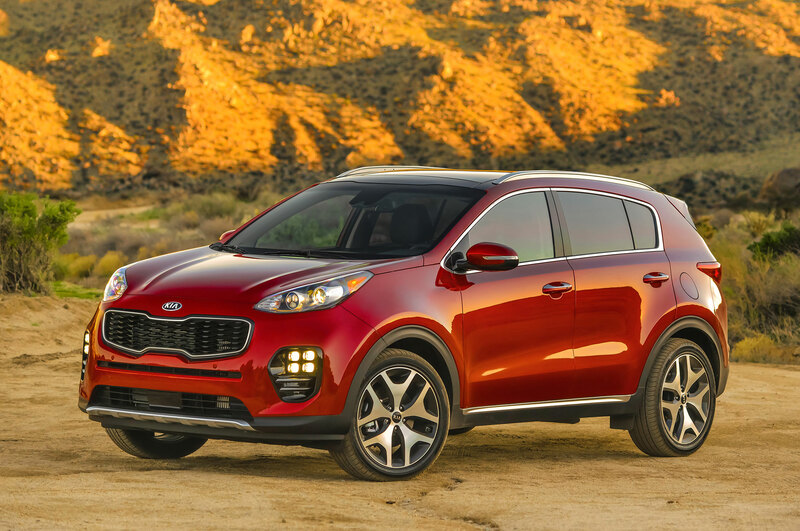 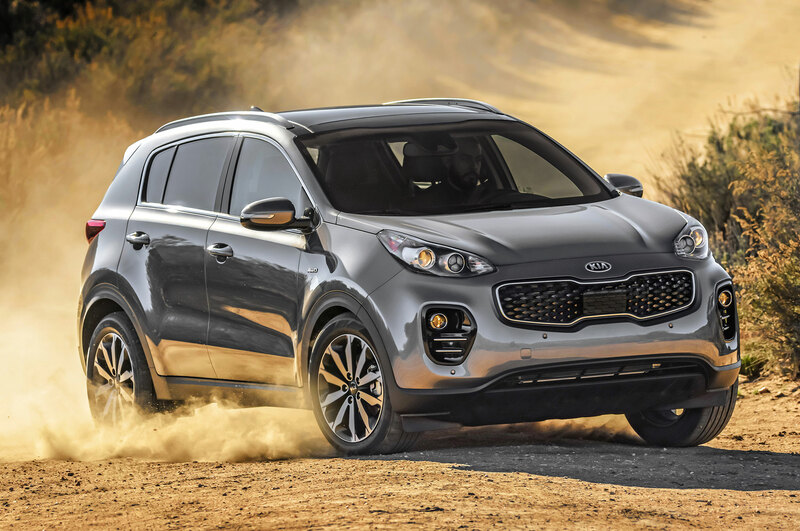 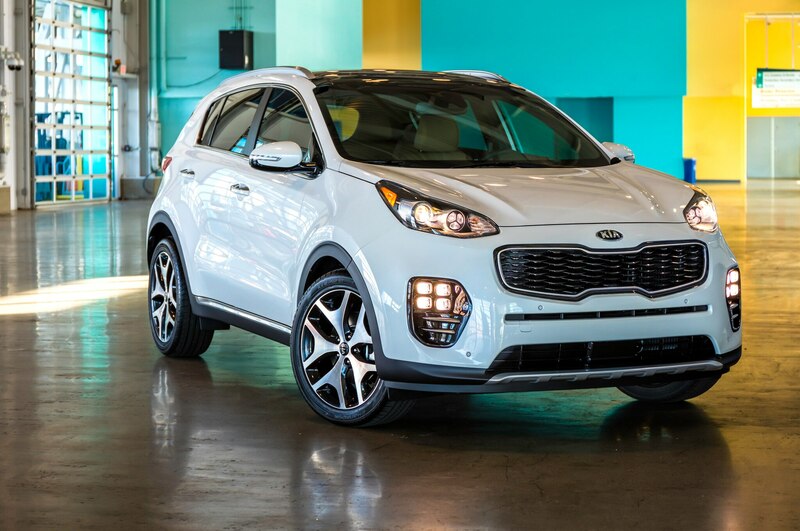 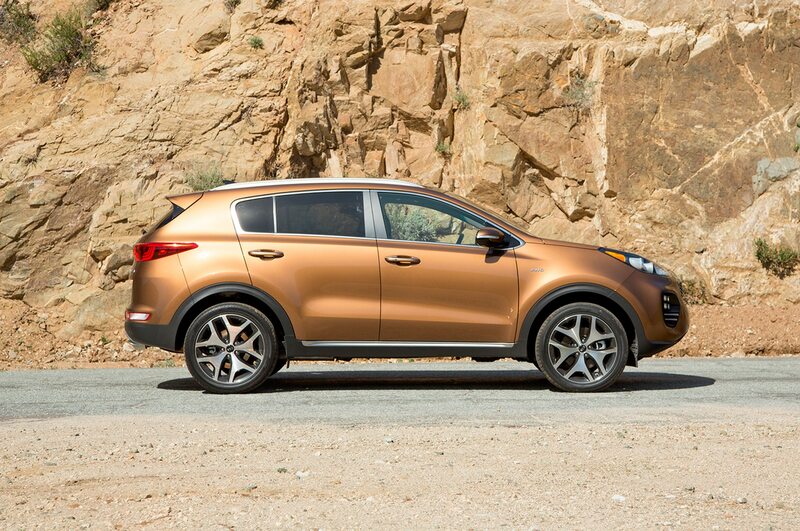 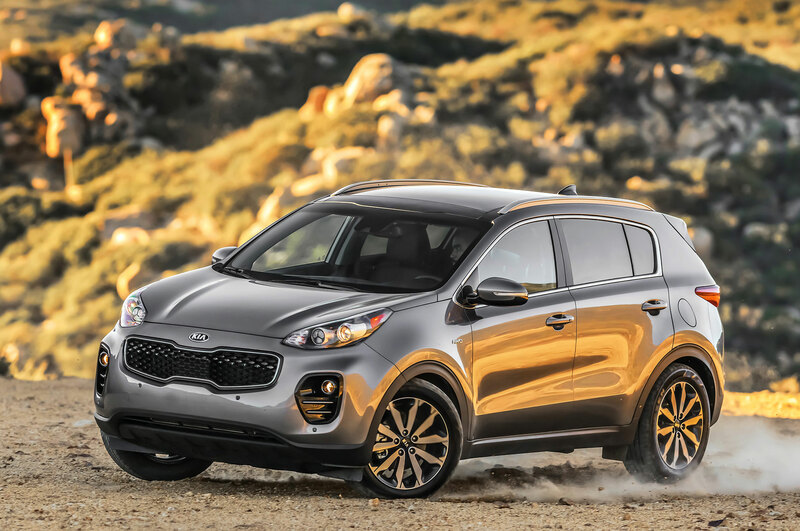 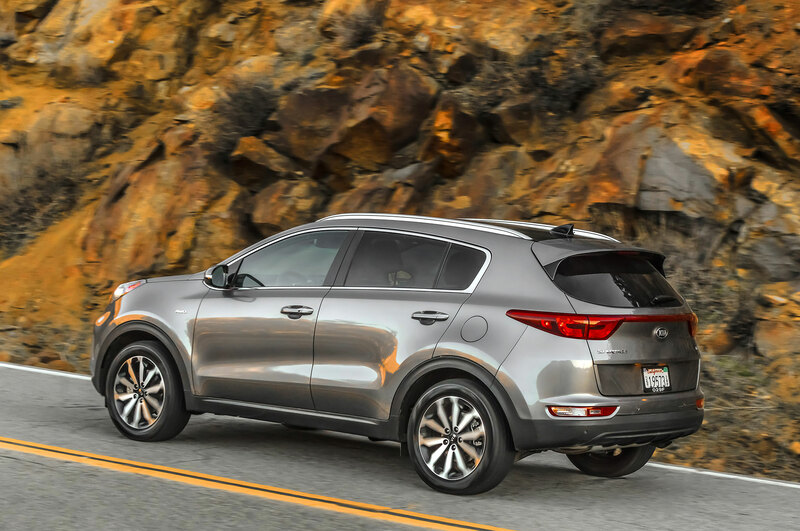 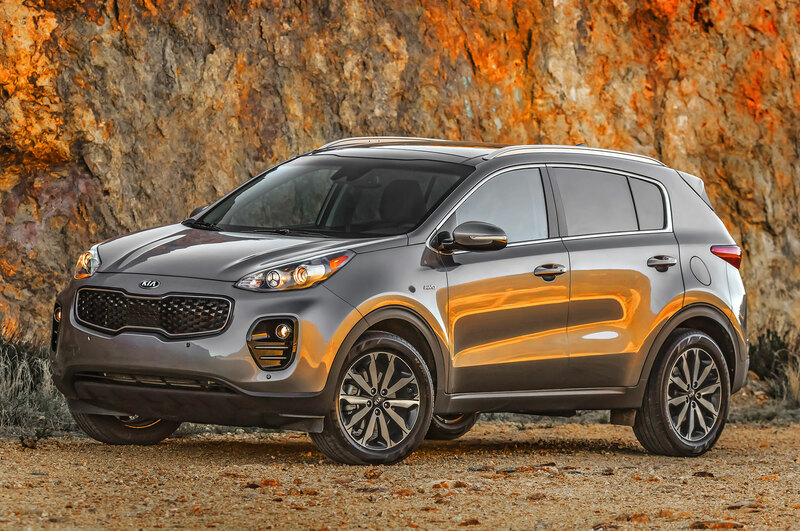 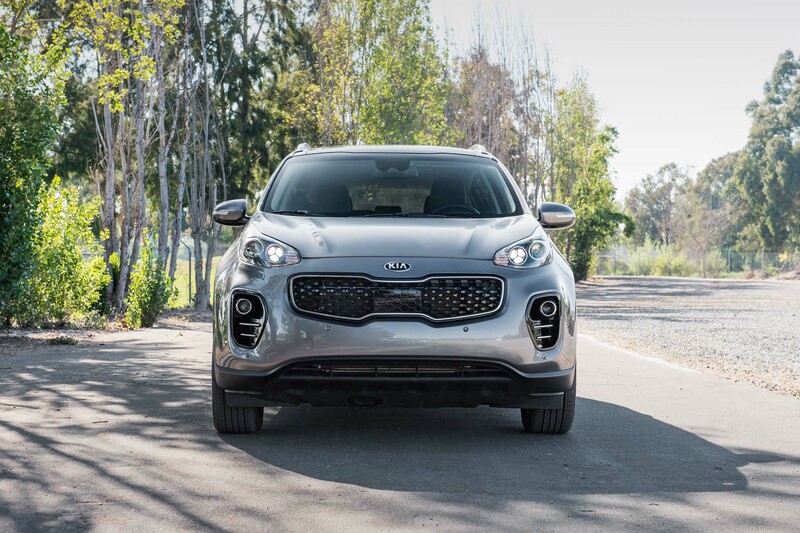 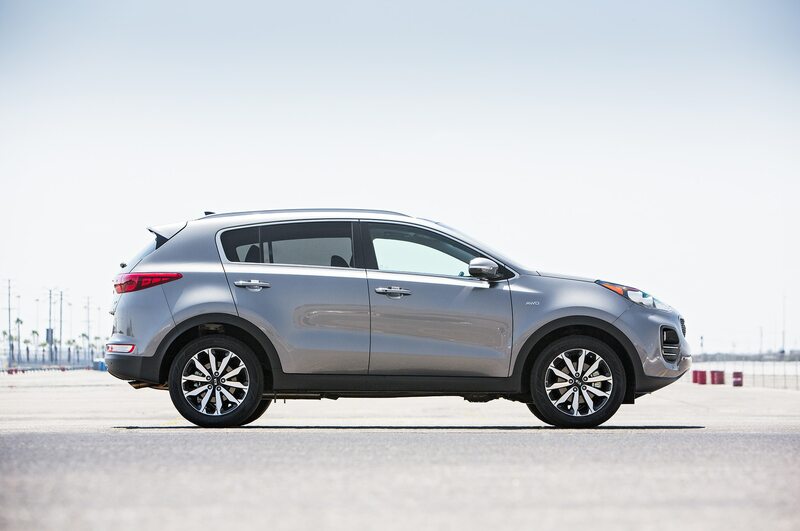 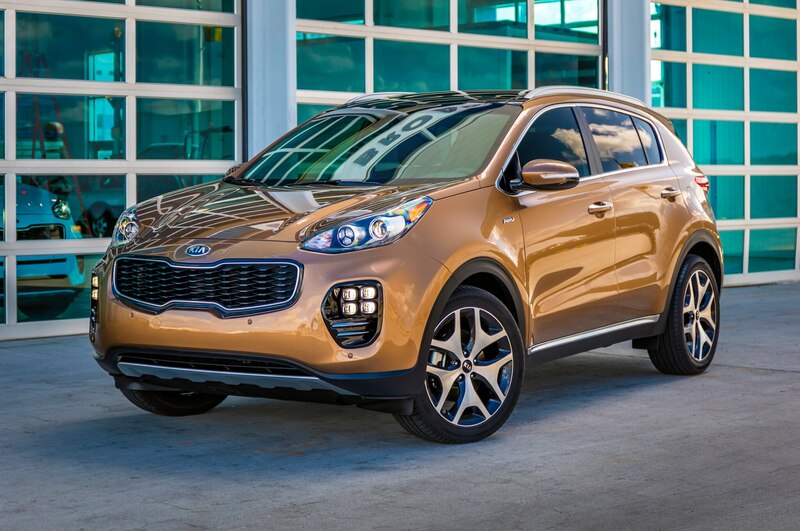 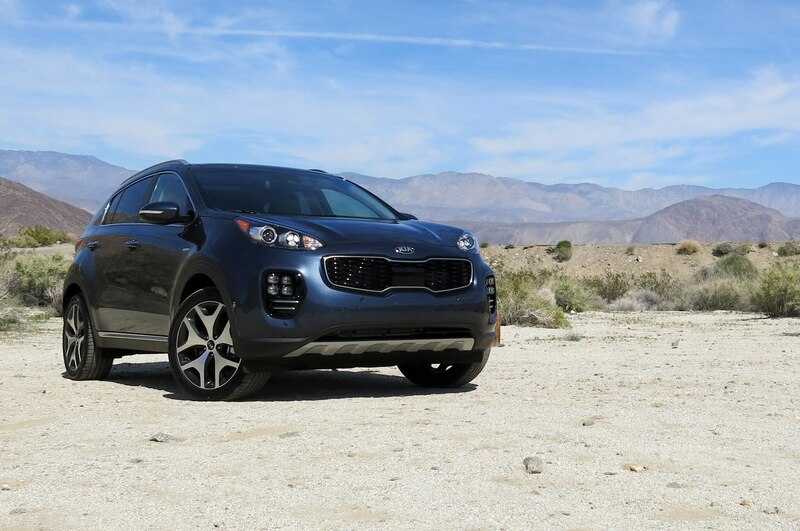 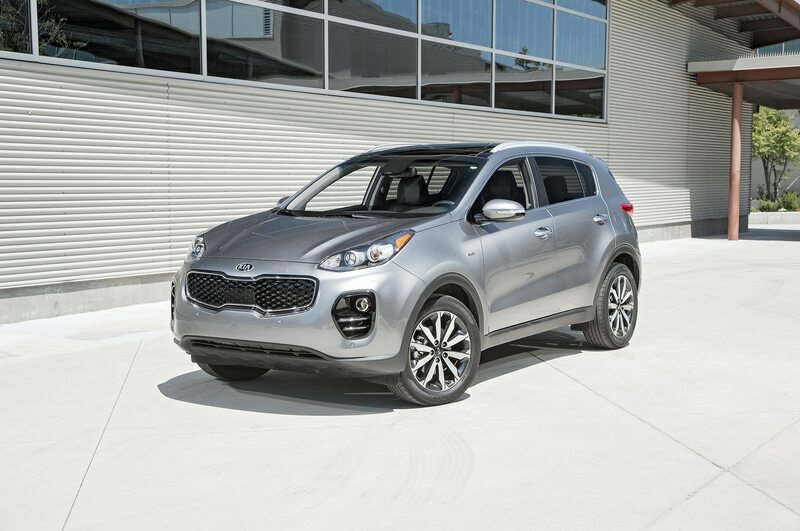 The 2017 Kia Sportage has made huge strides from the old version. 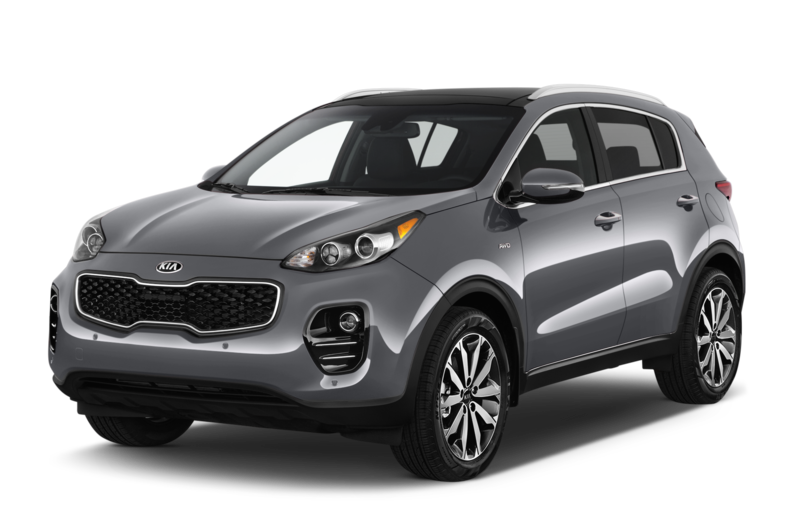 Compared to our Four Seasons 2011 Sportage EX, the new car is roomier, more comfortable, better to drive, quieter, and much more handsome inside. 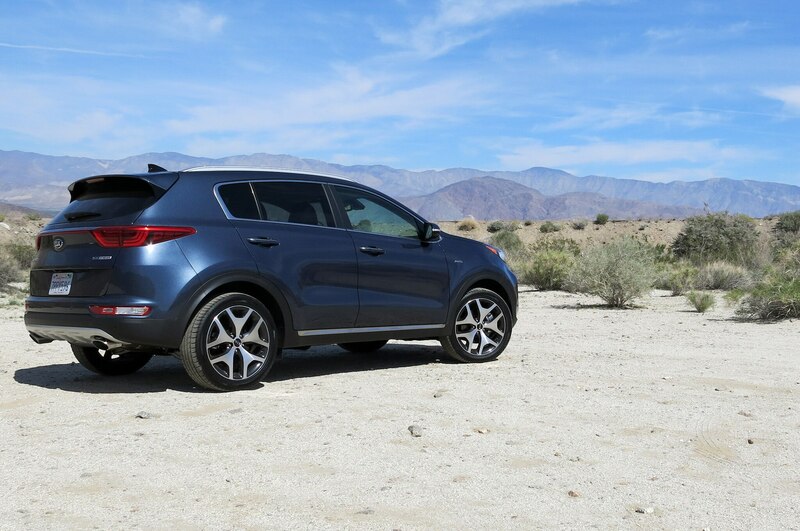 It’s a car we enjoy spending time with, and it really is a great value for money. 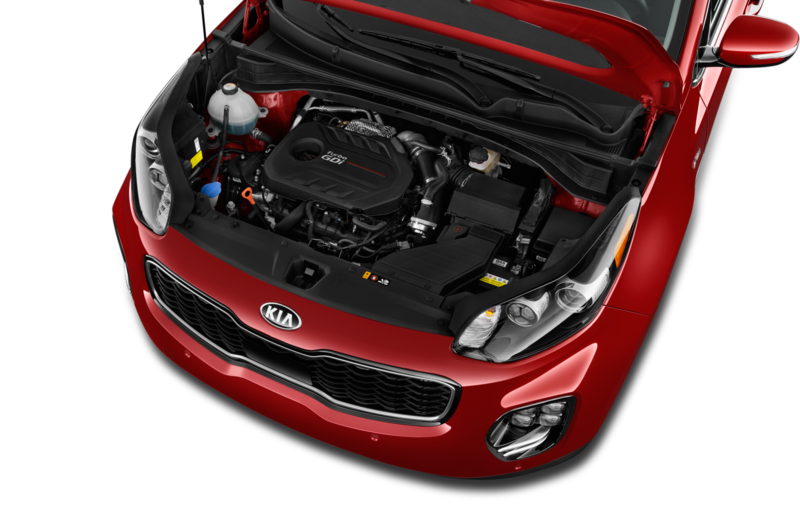 Yet its so-so fuel efficiency puts a serious damper on how readily we’d recommend this car to people who need to save at the pump. 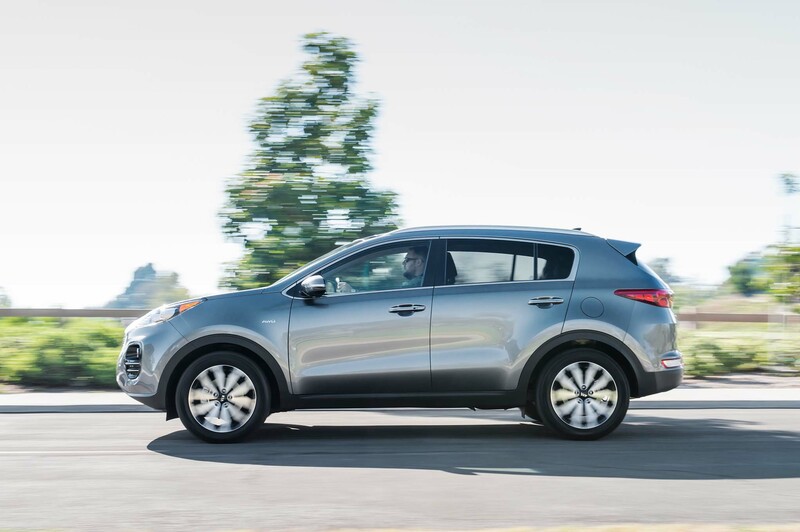 In comparison, the 2016 Hyundai Tucson, which is based on the same platform as the Sportage, might not be as boldly designed or as fun to drive, but its highway fuel mileage benefit is undeniable. 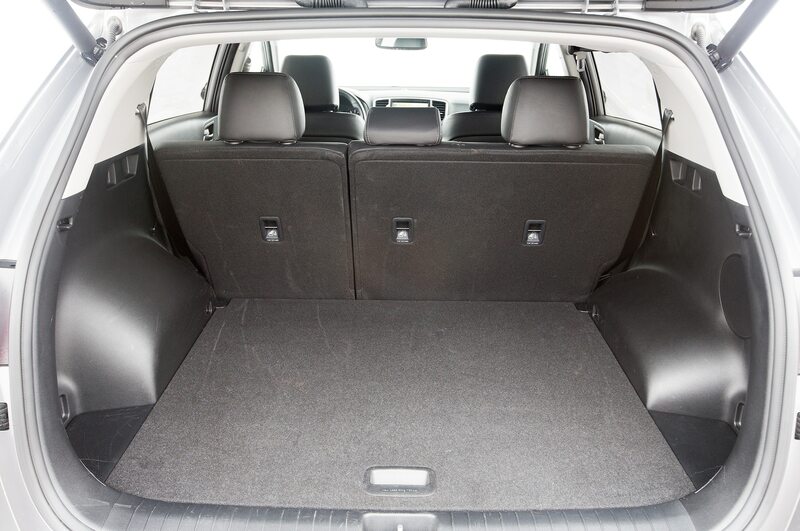 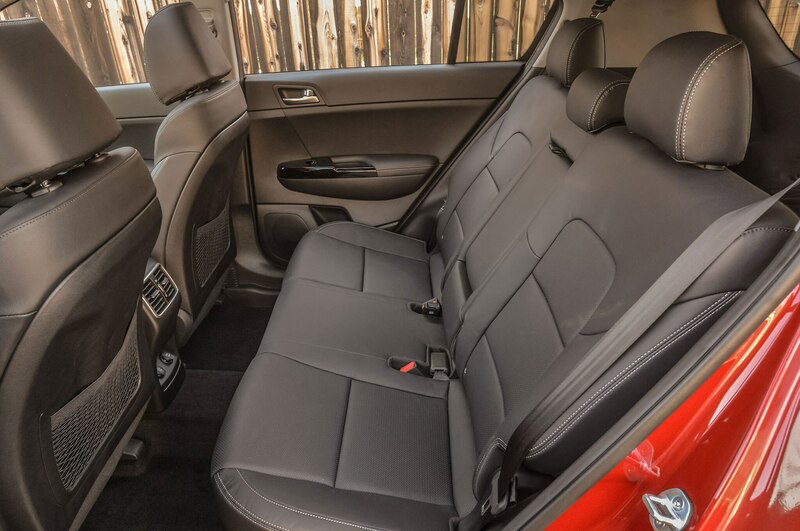 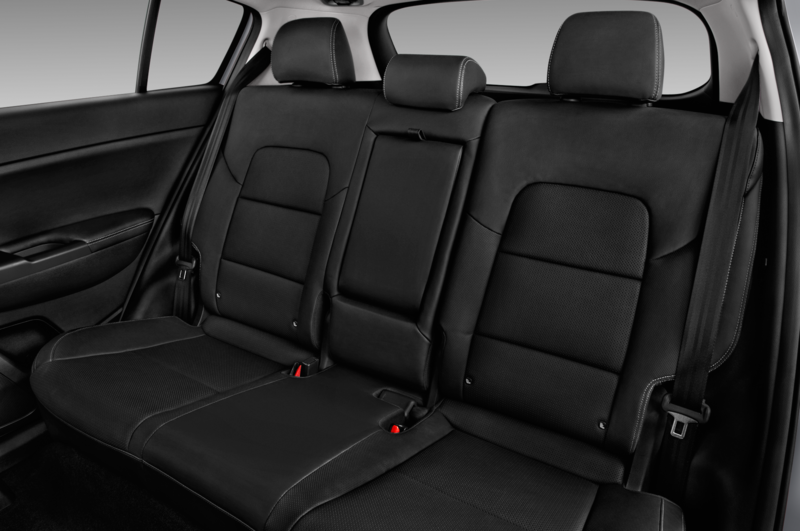 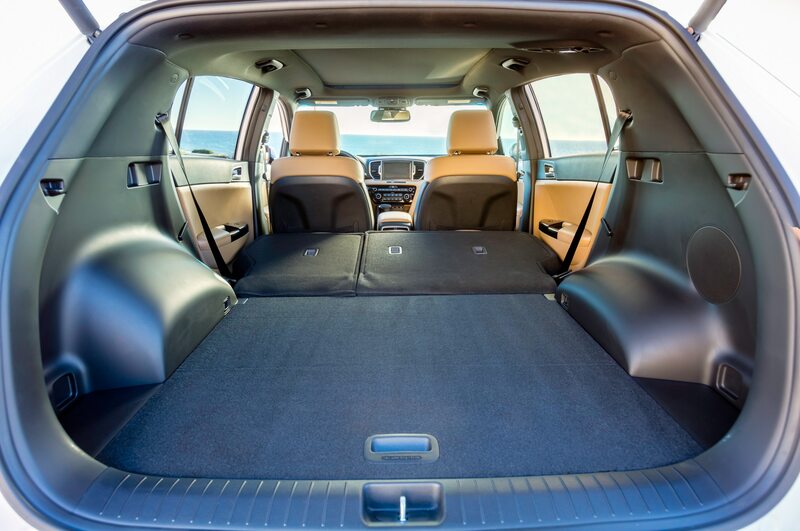 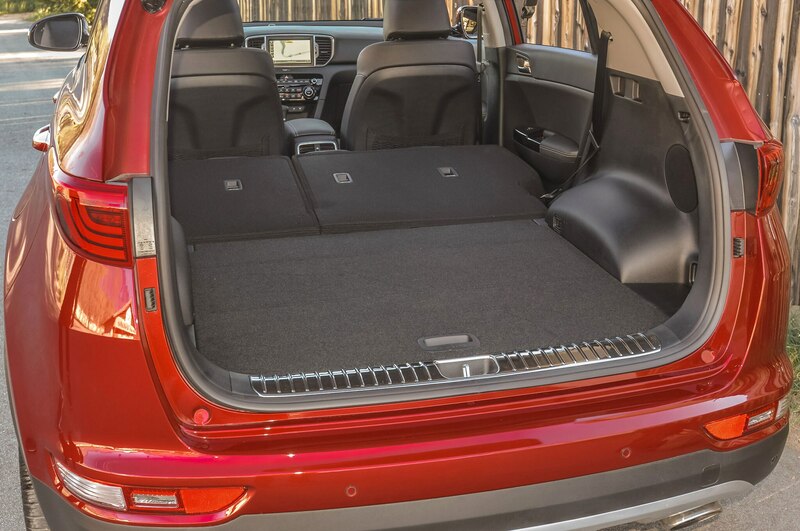 And several other smart compact crossovers have much roomier cargo areas. 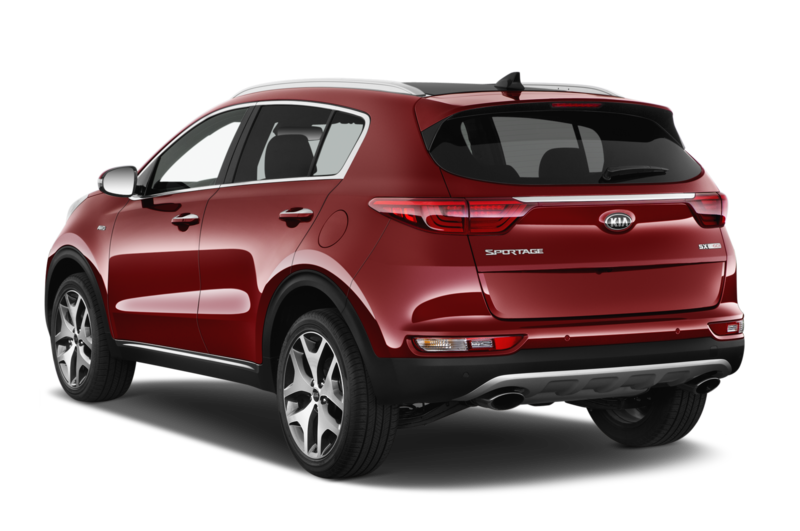 So although the 2017 Kia Sportage SX Turbo is a great crossover that we’d be happy to live with, it won’t be the first pick for sensible shoppers who need the most efficient and spacious vehicle they can afford.